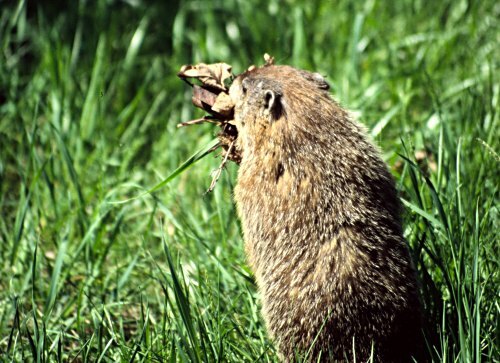 As this animal was very busy excavating items hidden under Trojan soil and inspecting the cravices of the ancient walls, we called it Heinrich after German archaeologist Heinrich Schliemann. A beautiful sight that is a world apart from the bustle of the metropolis above. 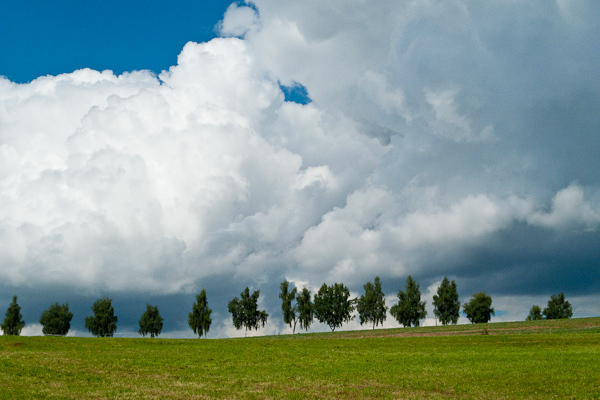 Trees lined up on a hill near the “Bucher Stausee” a water reservoir. (”Ostalb”, Southern Germany). 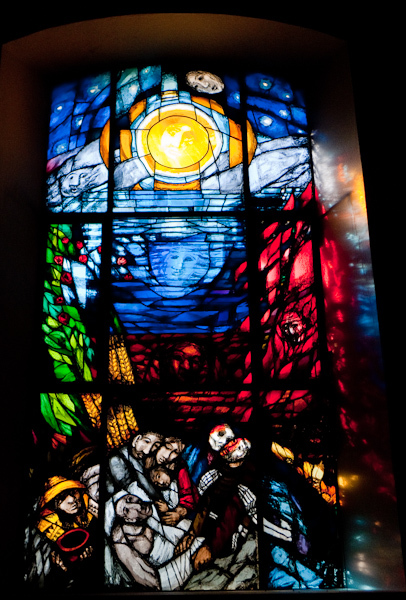 Church window in St. Francis Chapel of the “Marienpflege Children Village”, an orphanage in Ellwangen. 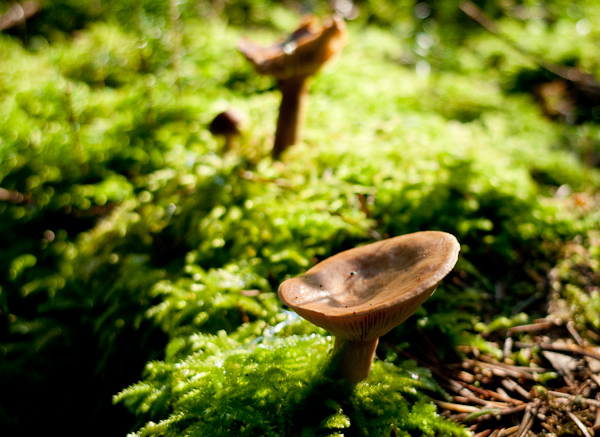 Moss and mushrooms in the woods near Neuler, Southern Germany. 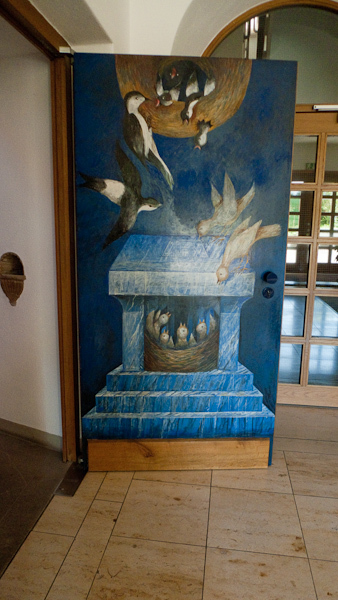 Renowned artist Sieger K�der created all the windows for the small, mnodern Hl Geist Kirche (Holy Ghost Church) in Ellwangen, Southern Germany. 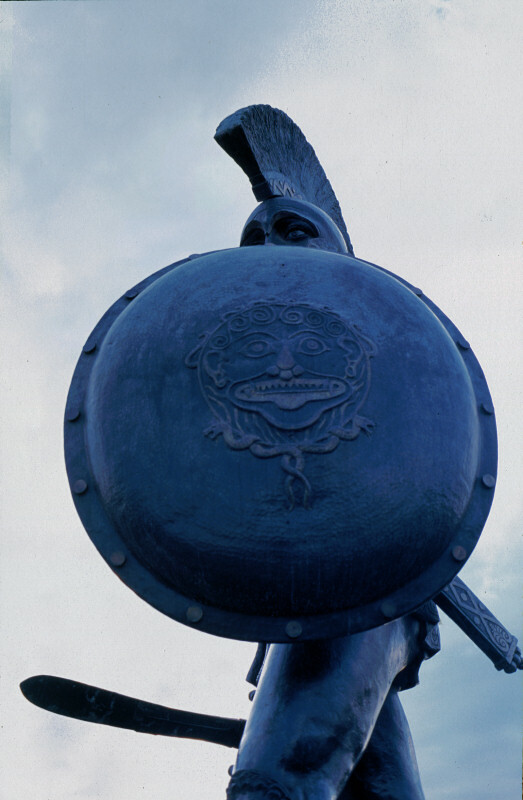 More on Sieger K�der at the Website of the city of Ellwangen. 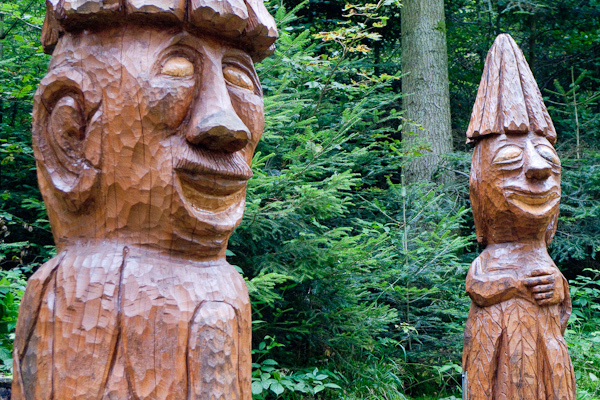 These wooden “tree spirits” are one of the exhibits lining the “sculpture path” at Neuler, Southern Germany. 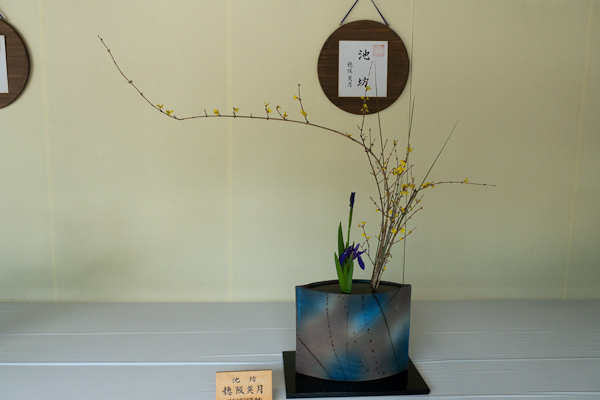 another impression from Ritsurin garden. 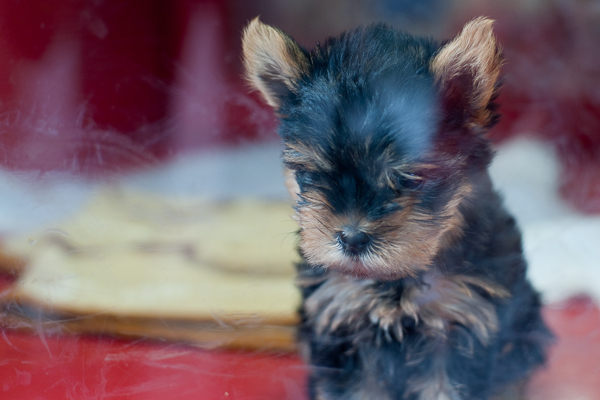 There were quite a few puppies in this shop in Himeji, near the famous castle, every one in its own small plastic box, looking outside. Of course I wish that every one finds a nice home and a good owner, but isn’t it a pity that such shops can make money this way? Seen in Kamakuras Haze Dera temple. 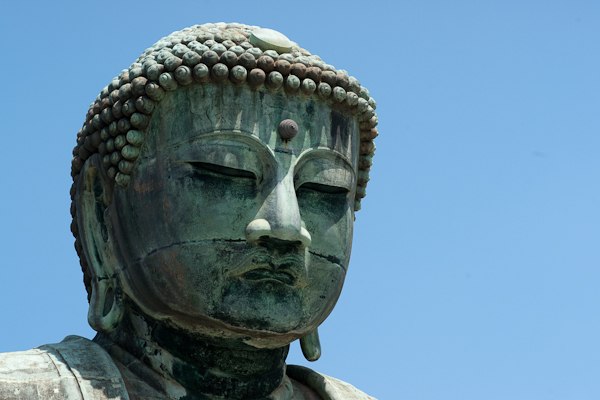 The great Buddha statue in Kamakura is among Japans best known attractions. Although the huge structure seems quite compact, it is actually hollow and visitors are actually admitted to enter inside. Not really photogenic, but quite an experience nevertheless. 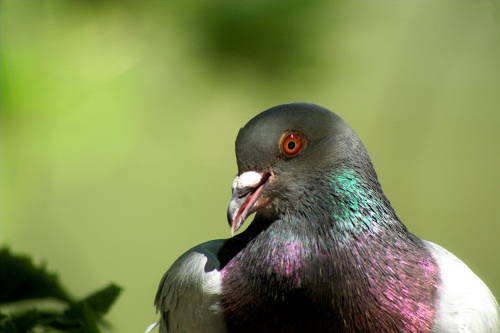 Below, you see a shot taken upwards, the black whole wolud be where the neck joins the torso. A very lively and impressive short play in Hamburg’s Ernst Deutsch theatre has Wilhelm Busch as the main character, who is asleep in his armchair throughout the play. The action takes place around him as his ceations start to come alive in his dreams and a charming muse accompanied by two musiciand provides the musical background. The cathedral is the place where Nicolaus Copernicus worked and made many of his observations. His grave also was recently discovered inside this church. I’m currently in Prague - a beautiful city albeit a bit cold at the moment. 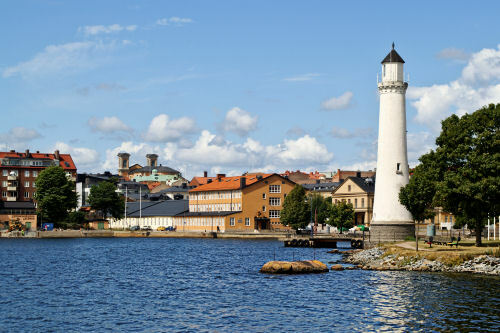 Lighthouse in Karlskrona (Sweden). Karlskrona is renowned for its baroque buildings in the city centre, but the relaxed atmosphere at the waterside appealed to me even more. 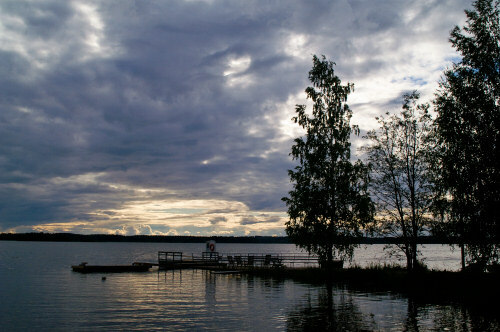 This is yet another photo taken at sunset close to the cottage we rented in Finland. Kalmar is a pleasant town in Southern Sweden that has many beautiful buildings and one truly historic monument: Kalmar castle, where the Kalmar Union (combining Denmark, Sweden and Norway) was founded in 1397, as a counterweight to the rapidly growing Hanse. 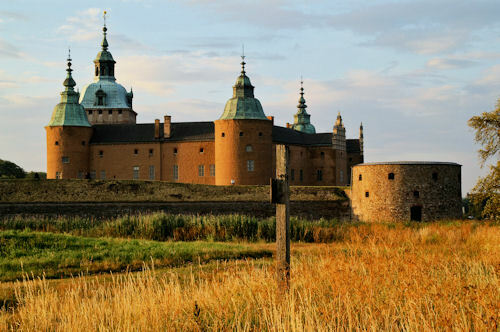 This is one of the most important and most beautiful castles in Sweden. I didn’t fiddle with the saturation here - sunsets can be quite spectacular in Finland. 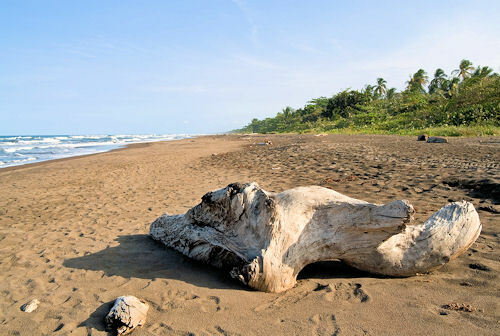 El Tortuguero (Lim�n province) is known for its canals and for the turtles that build their nests on the beaches of this fascinating nature reserve. 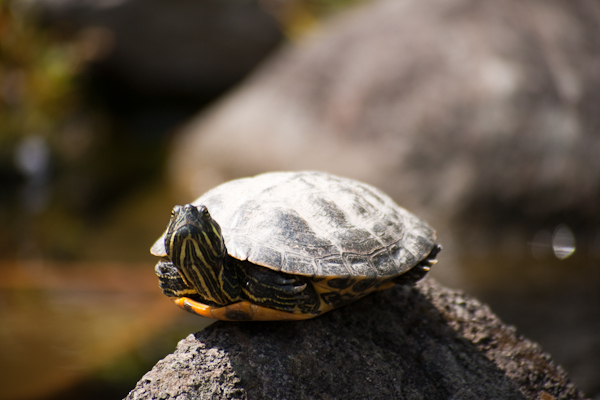 Actually, the name of the place is derived from Spanish “tortuga” for turtle. 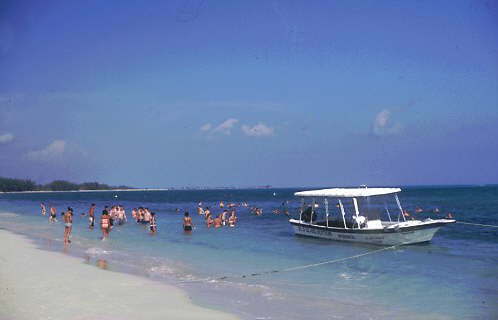 Even when there are no turtles, the beaches are quite beautiful and the boat tours on the canals are fun. Another case of photogenic “bad” weather. 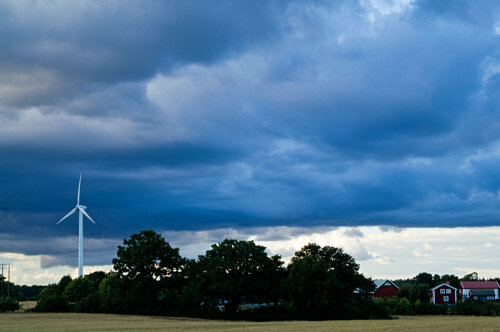 Fortunately, the thunderstorm was a few kilometres away, when we were riding on our bikes through woods and field in Southern Sweden. This photo was taken near S�der�kra, where we had a nice little holiday cottage. 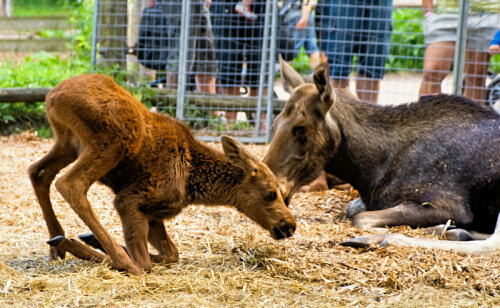 Skansen is a museum village right in the centre of Stockholm showing many wooden buildings from Sweden. 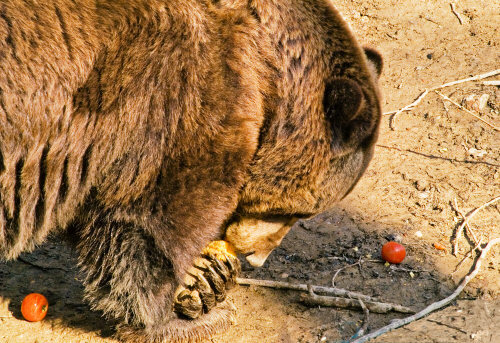 It also has a nice zoo with domestic animals including elk and bears. Even when the weather is “bad”, it can be highly photogenic in Finland. Here, a little bit of rain is falling on Puruvesi lake shortly after sunset (Enanlahti near Punkaharju). 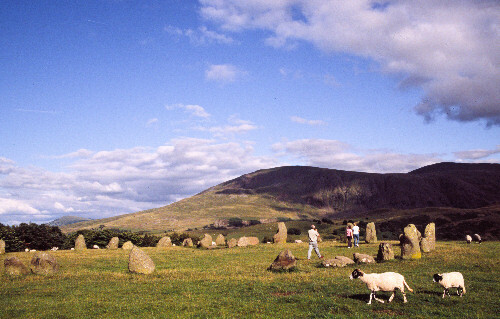 Although it never gets really dark at night, it’s already too late in July for real “midnight sun”. This is a picture that just happened - I saw the sky turn red and the silhouette of the iron Spire of Riddarholm Church, so I walked over the next bridge and shot this. 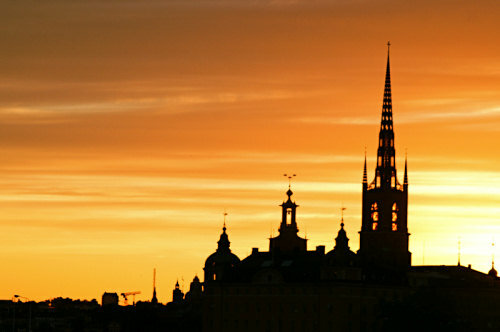 I then tried to improve on the shot by using the “Katarina Hissen” (an elevator with a spectacular view) to a viewing platform, but it was not possible to get the setting sun directly behind the church. Weeds in the evening light, a moment after the sun set seen in Finland. 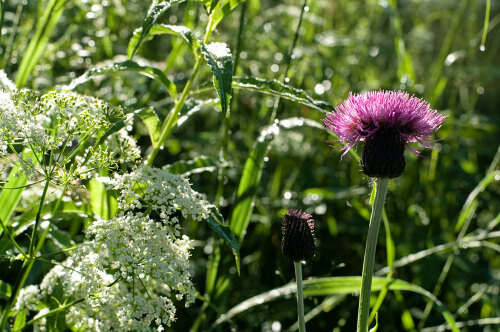 There are lots of flowers near the lake, but I especially like the thistles. 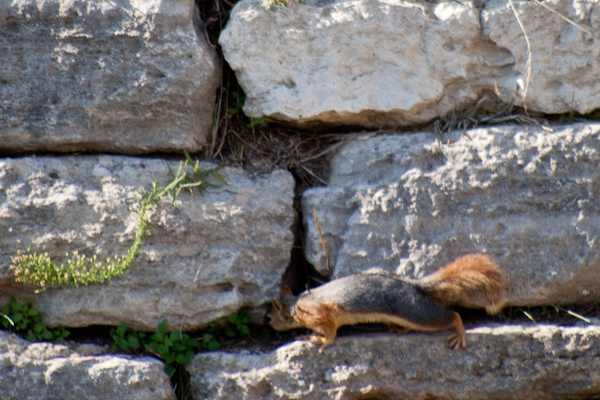 I spotted this nice fellow under a bridge crossing a small rivulet near the hotel. 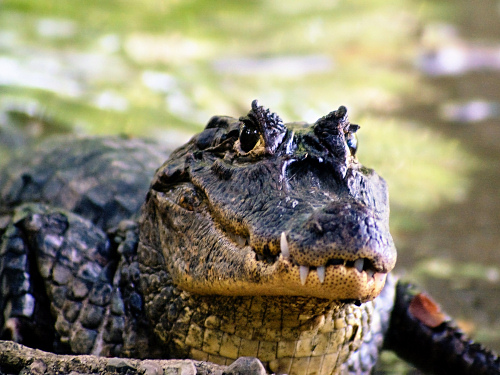 As this was the mouth of the small river, and the water presumably quite brackish, I guess that this was a crocodile rather than a caiman, but I’m by no means sure. Maybe someone more knowledgeable can enlighten me? 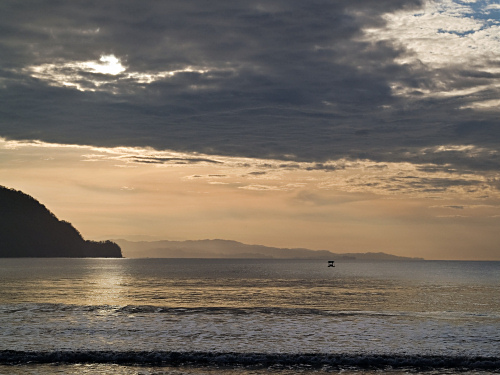 An impressive evening sky seen from Playa Tambor on the Pacific side of Costa Rica (actually located on the Nicoya Peninsula). 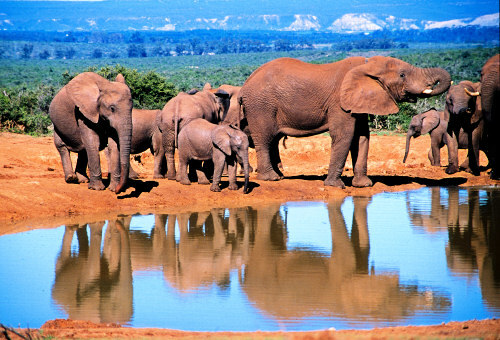 Seen in Addo Elephant park, South Africa. 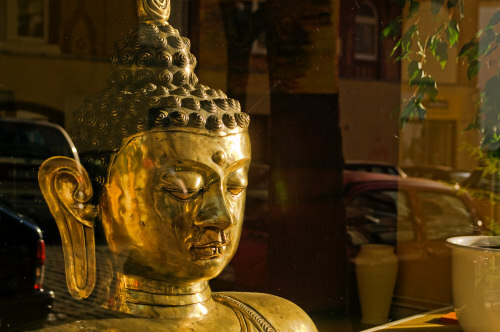 A golden Buddha is contemplating the city life from a quiet spot in a barber’s shop. 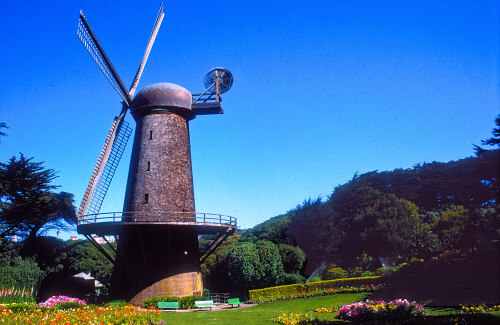 A Dutch windmill in Golden Gate Park, San Francisco. 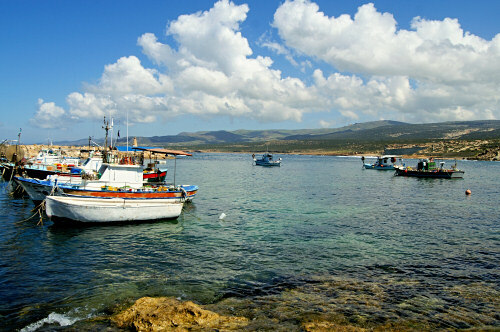 Coral Bay, situated north of Paphos. 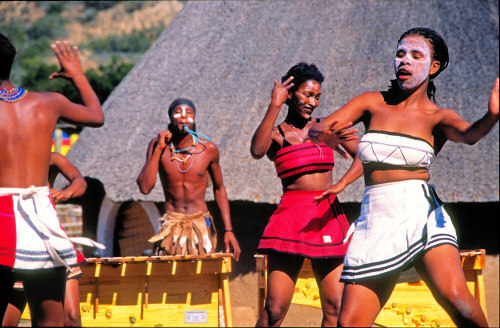 This performance wass held in Shamwari Park, one of the many game parks along the Garden Route, South Africa. Decidedly touristy, but a very nice photo opportunity and good fun. Ugly and never shown in profile this dwarf-like god looks very un-Egyptian, and indeed it is suspected that he was imported from somewhere else, maybe other parts of Africa. 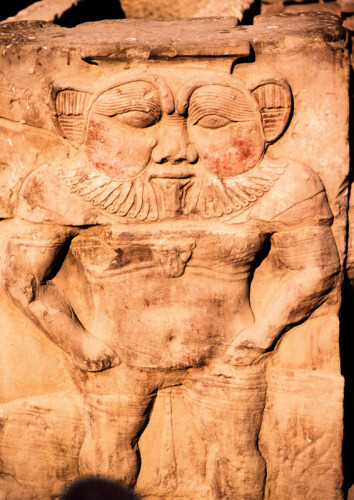 Still, as a protector of homes and childbirth, Bes was quite popular although no temples were dedicated to him. He also acted as god of war and music. 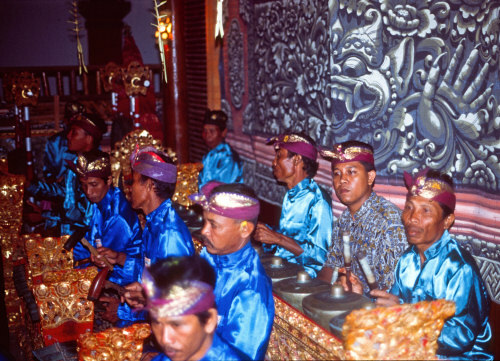 A Gamelan orchestra performing in Ubud, Bali. For ears used to European classical music, this sounds very strange and noisy, but the atmosphere of such a performance is truly unique. Everyday life goes on beside the ruins. For a long time, it was believed that the Colca Canyon was the deepest canyon on earth, but it turned out that the nearby Cotahuasi Canyon is even deeper. 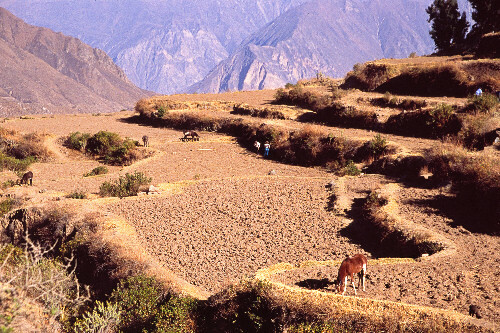 In any case, the Colca Canyon is an attraction and walking there is a unique experience. 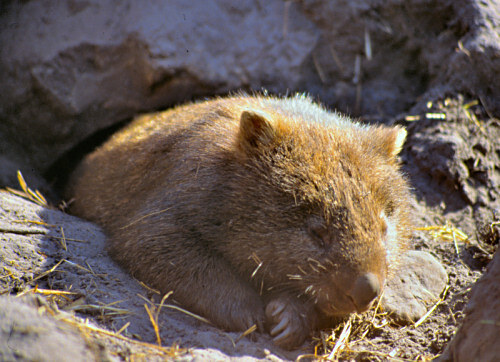 It is quite a strenuous effort, however, - after all it is situated at a height of approximately 3500 meters and acclimatisation is essential. 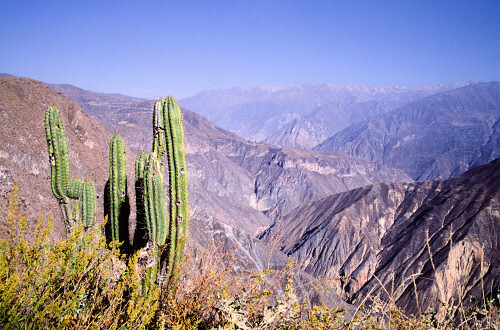 More on the Colca Canyon at Wikipedia. 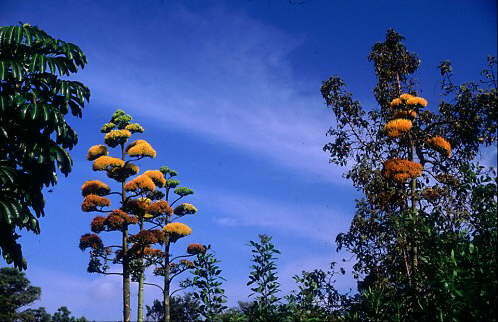 It is a very relaxing experience to walk along a levada through woods and fields. 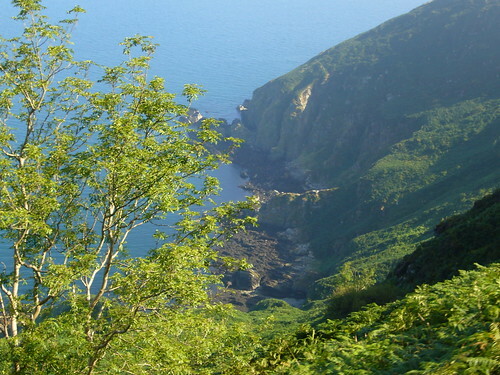 The levada Nova in the Western part of Madeira is quite an easy walk and very varied. 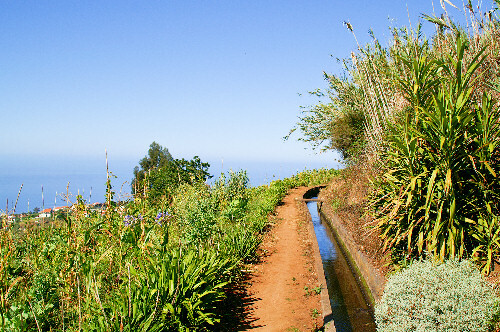 Local agencies organise the walks, but it is quite easy to do a walk on your own as well: although there are hardly any signposts, the “levada” carrying the water across the island usually clearly identifies the correct way. The stone circle is about 5000 years old and today consists of 38 stones of varying size. I’ve seen it in good and bad weather and don’t know which atmosphere to prefer. Even more facts at Wikipedia. 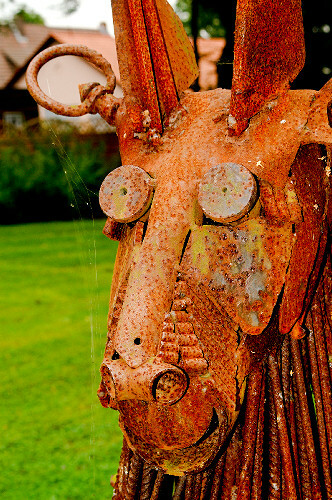 A rusty statue seen in a Bad Hersfeld park. 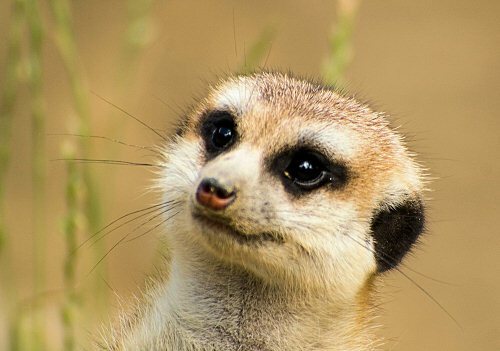 Actually quite cute, isn’t he? This fellow is hoping for carrots and you actually can see a few deep inside the hippos mouth. 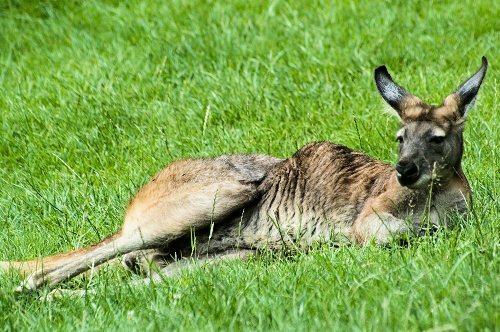 I took all these photos (and many more) at the Opel Zoo in Kronberg, not too far away from Frankfurt (Germany). The centre of Lisbon in the blue hour. 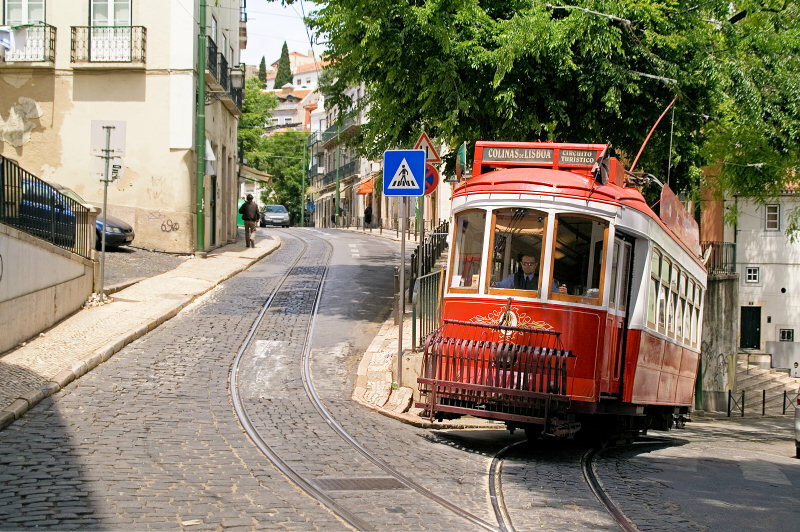 An “electrico” or traditional Lisbon tram. There are many expensive tours on double decker buses, but a ride with electrico 28 will also bring you to most attractions and actually get much closer to some of them. It’s also much cheaper - and more fun! The sign on the tram says “colinas de Lisboa” - “Hills of Lisbon” and indeed, it has a steep hill to climb. 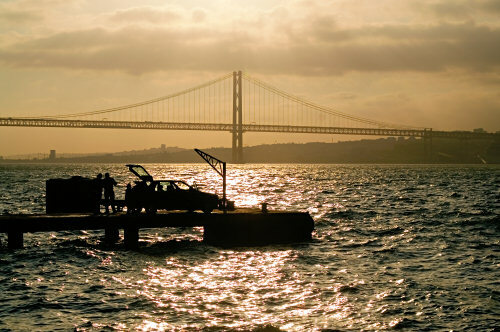 Like Rome, Lisbon is built on 7 hills and there are “Miradouras” (”golden views”) almost everywhere. 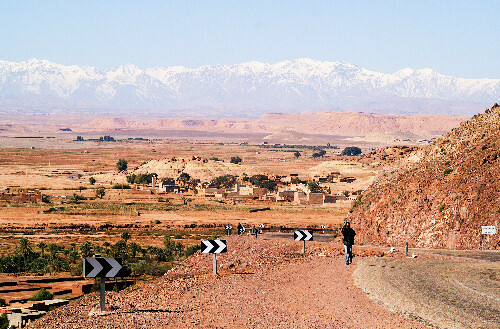 The Atlas mountains on the way to Ouarzazate. 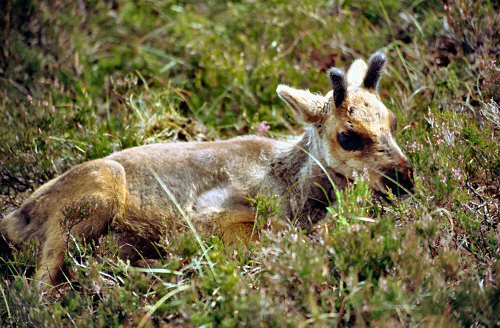 The photos on this site are copyright by Laurenz Bobke. A cheap and entertaining way to see Lisbon from another angle is to take the ferry to Cacilhas. Here I was lucky enough to see quite an impressive sky over the “Ponte 25 de Abril” bridge just before sunset. 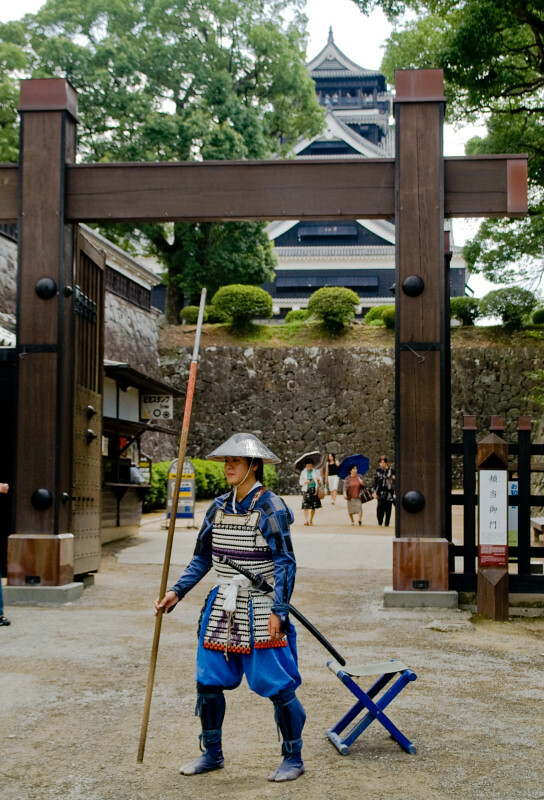 An ancient picturesque “shopping mall” for the imperial household. Today, you can see only tourists instead of the empress and the imperial concubines - but then who would have had the privilege to see this in the 18th century? 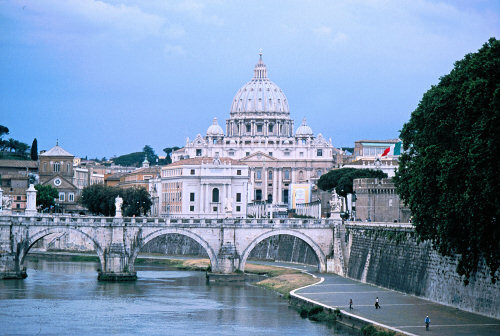 St. Peter’s Basilica and the Angels’ bridge leading to it across the Tiber (Italian Tevere) river. A moment after a short but heavy rain, light breaks through the clods in the Troodos mountains. A tiny bit of the sea is visible in the background. Agios Georgios is not far from Paphos where I spent a fascinating 1 week holiday. The water is crystal clear and the coast extremely beautiful - although you do not find the perfect white or golden sand beaches of other holiday locations on Cyprus. More photos from Agios Georgios. The Nubian museum in Aswan is one of the most interesting museums I have visited -much more inspiring than the famous, crammed Egyptian museum in Cairo. Here, all items are shown in the best light - very similar to the equally beautiful Luxor museum. 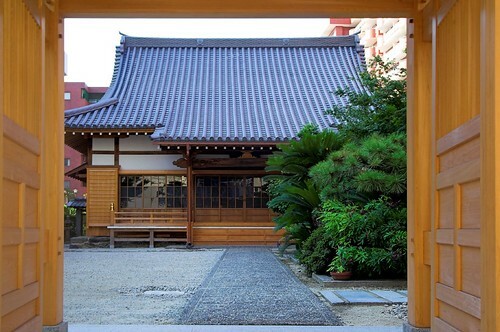 Outside the museum itself, there are some traditional buildings to be seen, like the small mosque on the picture. Wandering around the compounds at night is an almost magical experience. 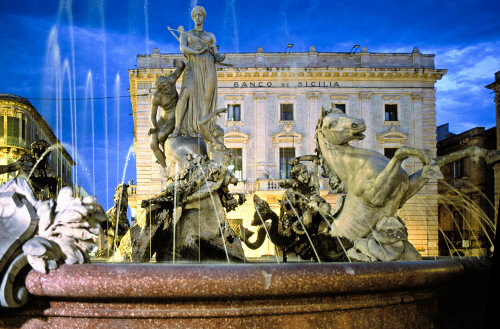 The Diana Fountain on Piazza Archimede at night. Syracuse at night is a photographer’s paradise. 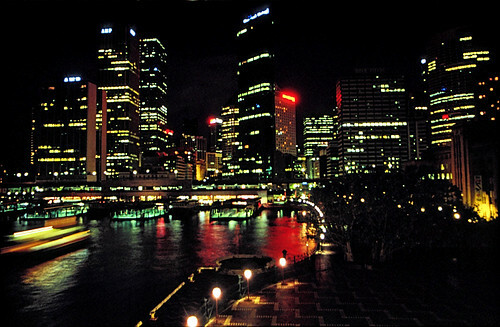 The lights of the harbour and the illuminated monuments create a very special atmosphere. 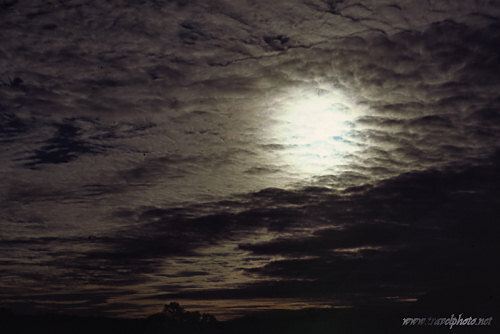 The photo above was taken with my Minolta Dynax 9 in the blue hour on Fujichrome Velvia using the camera flash and a remote controlled flash as fill-in. 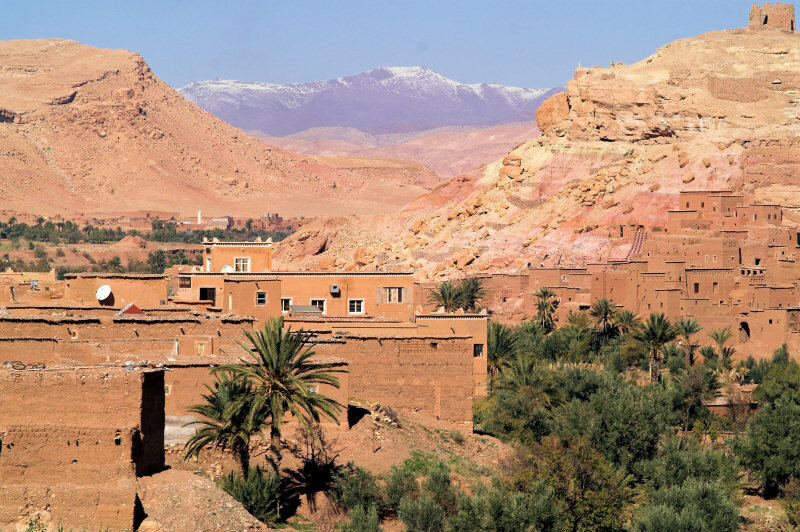 The drive to Ouarzazate is a standard excursion from Marrakesh - and highly recommended. There are some breathtaking views from the Atlas mountain and beautiful landscapes anywhere. The tourist buses are comfortable - but if I ever get there gain, I’ll try to find a taxi instead - so that I can make more photo stops and exactly where I want them. 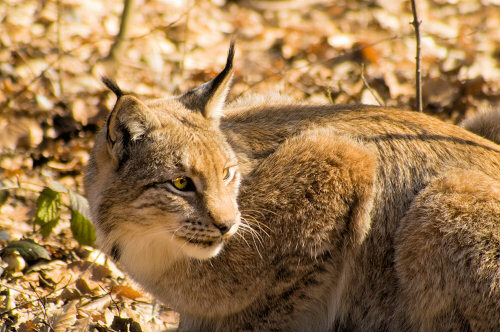 Here you can see the typical small tuft of black hair on the ears of the lynx. 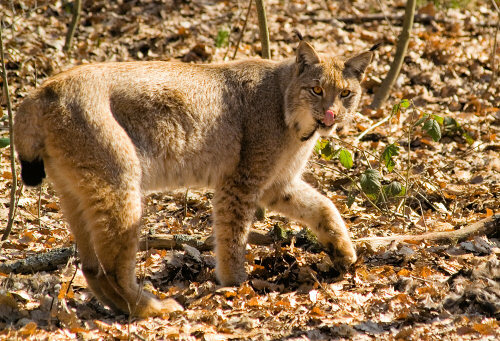 This is easily the biggest cat species in central Europe and a very impressive sight. Another typical feature of the Lynx is its short, stubby tail. Again, these pictures were taken at the “Fasanerie” in Wiesbaden, Germany. 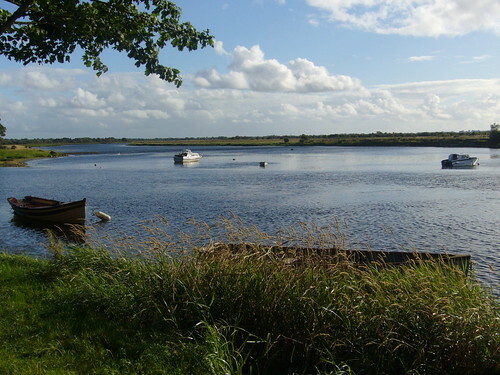 When I visited Clonmacnoise, the weather changed rapidly. Here, I got a shot of the surroundings, just a moment before rain started pouring down. Fortunately, the AV-show was interesting and the rain had disappeared when we came outside again. 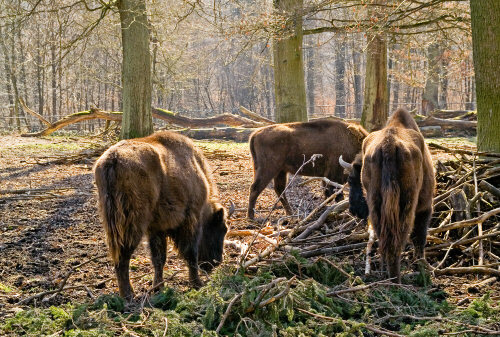 The “Fasanerie” in Wiesbaden is home to animals that used to live in the region such as the Wisent (a form of buffalo), wolves and even some bears. more photos taken at the “Fasanerie”, Wiesbaden: racoon, young foxes. more photos from Wiesbaden at A Photo a Day. I also have a special site only showing photos from Wiesbaden. The salient facts at Wikipedia. 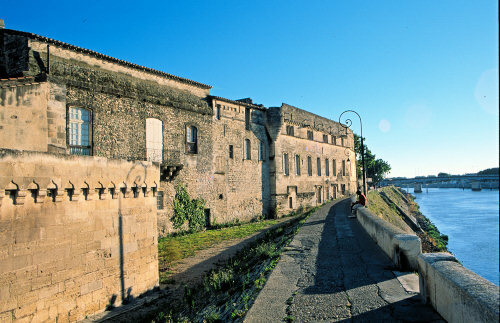 Arles has many sights to offer - a roman amphitheatre, many churches and an ancient and formerly very important cemetery. 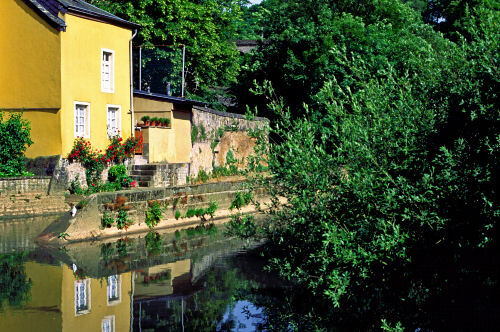 A very good way to relax in between is to take a stroll along the Rh�ne river. 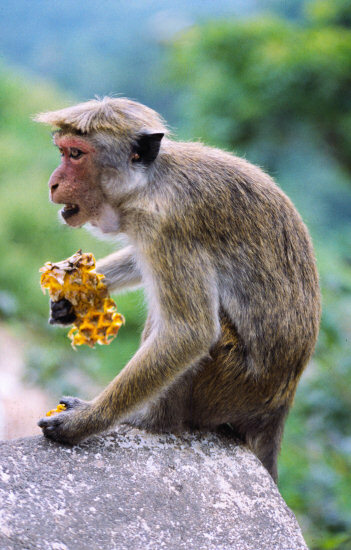 A monkey right outside the Dambulla (Sri Lanka) caves. Looks like he might have been the role model for Mr. Spock? Doesn’t it almost look like a face? 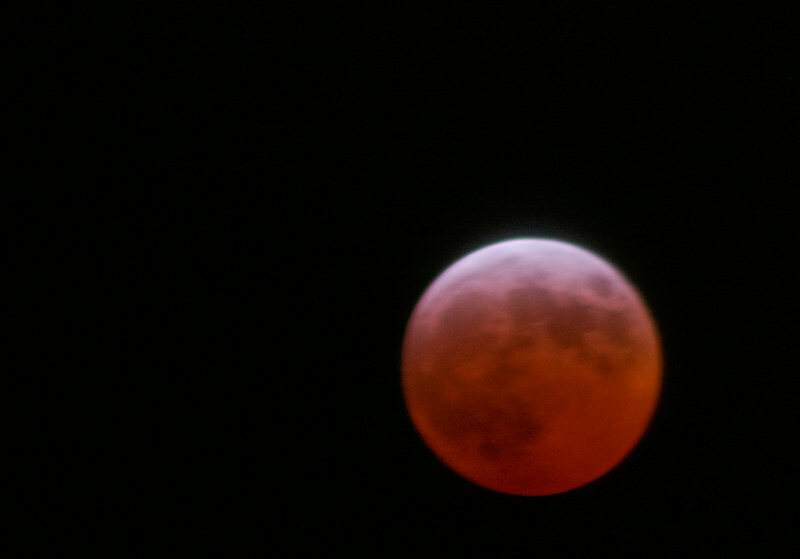 The lunar eclipse, seen a few minutes ago in Wiesbaden from my kitchen window. Fortunately the clouds broke although there always was a little bit of a hazy cloud screen making the photo somewhat less sharp than desirable. 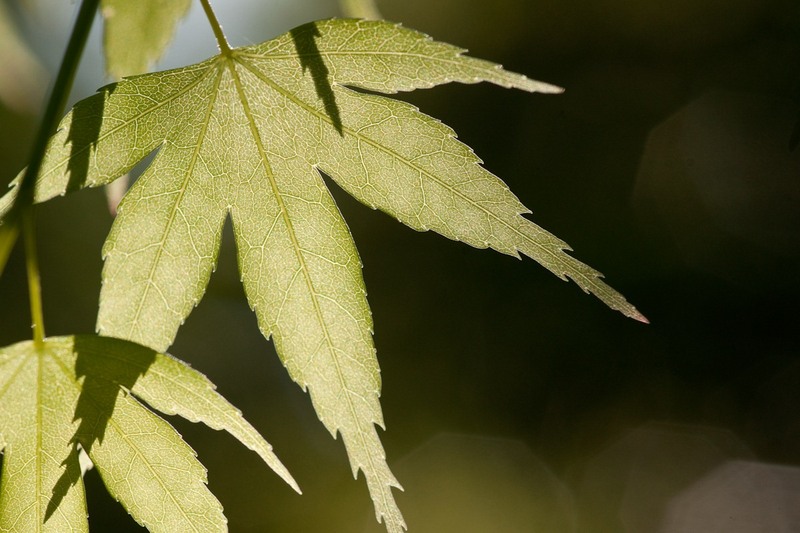 Minolta 7d, Tokina 80-400, image cropped. 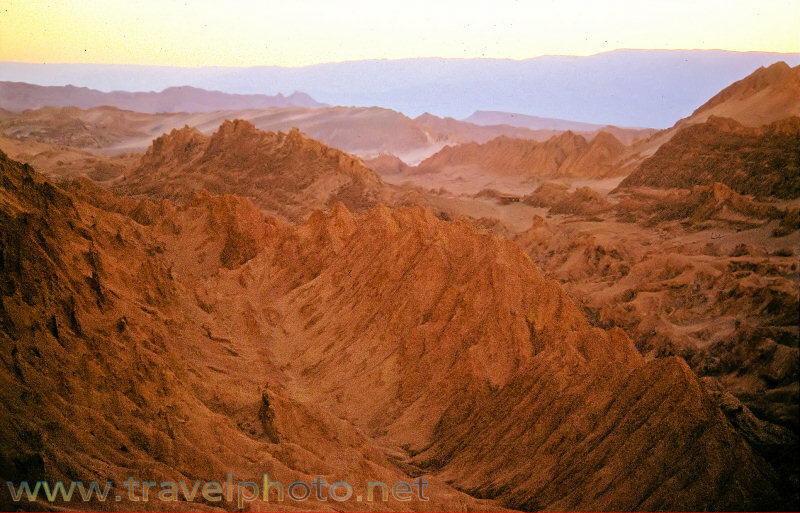 The “valley of the moon” (that’s what “valle de la luna” means) is situated in the Atacama desert, not too far from San Pedro de Atacama. 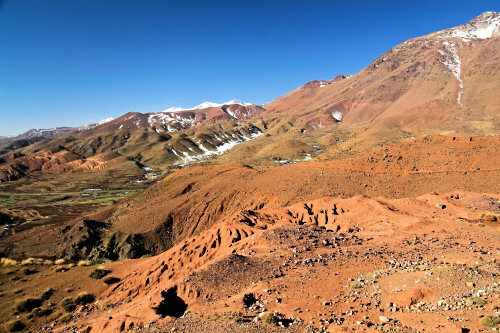 Oh, and - of course - there are more “valles de la luna” in other Spanish speaking parts of the world (Bolivia, Argentina…), but this is the most famous one. A�t-Ben-Haddou maybe is the most famous “Ksar” in Morocco. 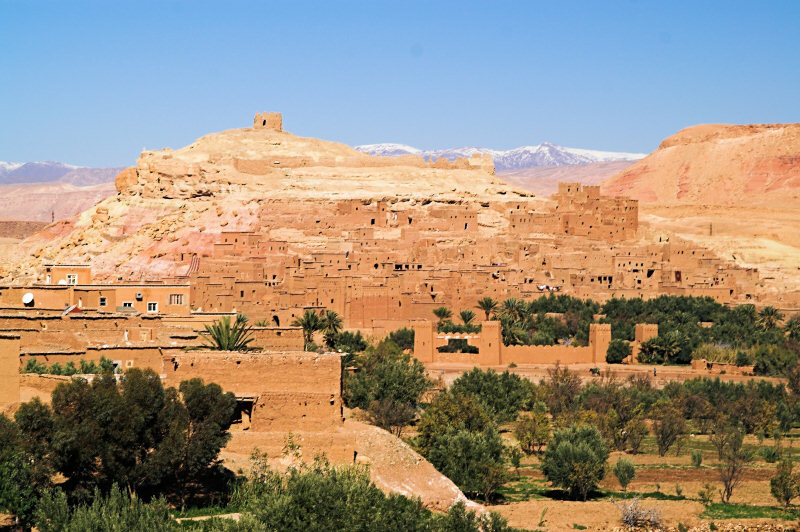 This fortified village has been featured in many Hollywood productions although Ksar Ouled Soltane in Tunisia may be even more famous. 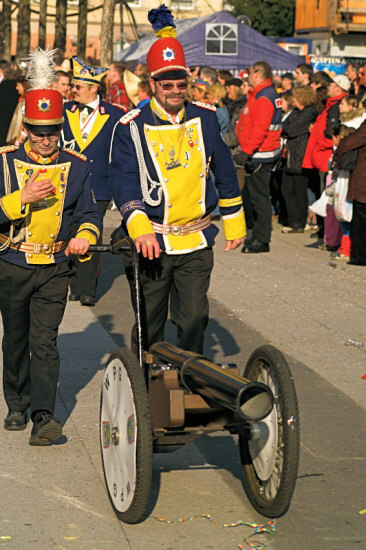 Some pictures from this year’s carnival parade in Wiesbaden. Surrounded by olive groves, Menara Gardens makes for a very scenic change from the bustle of central Marrakesh. Even though the water of the pool in front of the pavilion looks somewhat murky. it’s still one of the most romantic places the city has to offer. You can see the door in the red wall on both photos, by the way. Punta Arenas is the southernmost city in the world. Gion Corner in Kyoto may not be the most authentic place for Japanese Theatre, but it’s a good way to see different styles of theatre in one evening - and photography is allowed. 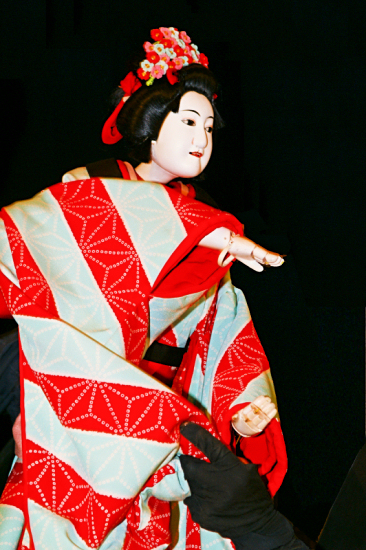 Bunraku is the art of the Japanese puppet theatre - one puppet may require several puppet players although there’s always a lead player who sometimes is fully visible. 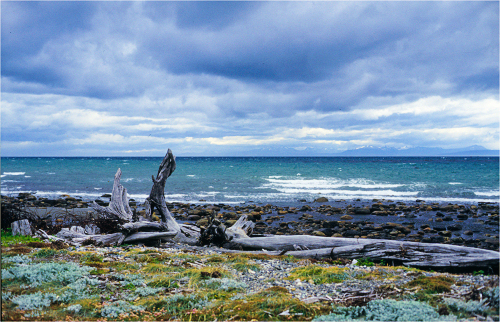 View of the sea in Patagonia (Southern Chile). 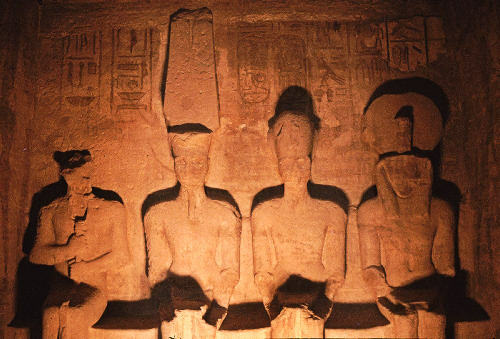 When I last visited Anu Simbel in 2004, it was imposible to take photos of the inner sanctuary. Fortunately, I had already done so 12 years earlier. In the sanctuary there four seated statues of Amun, Ra-Harakhty, Ptah, and Ramesses. 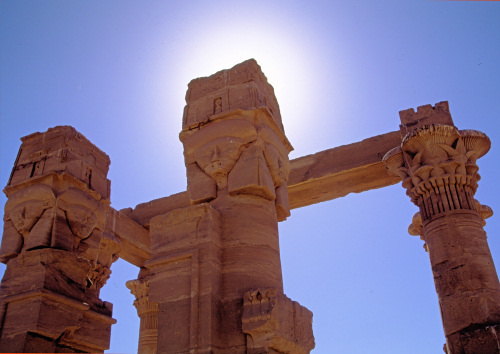 The temple was constructed in such a way that the sun shines directly on 3 of the statues during two days of the year only the statue of Ptah - the god of darkness - remains in the shadow. 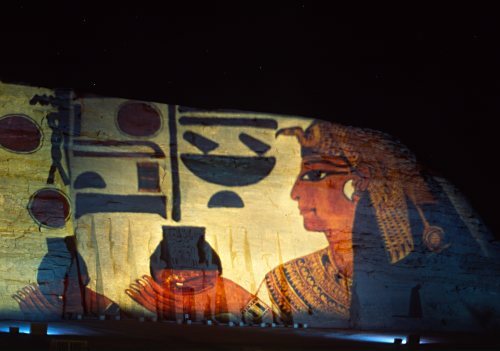 More pictures from Abu Simbel. 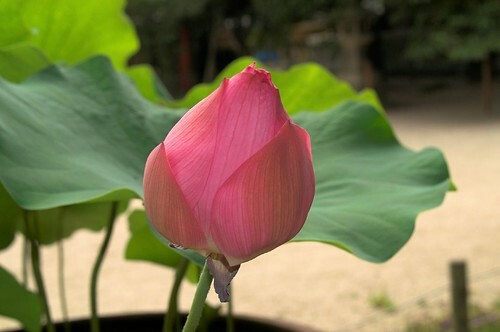 A lotus flower in a Fukuoka Temple. 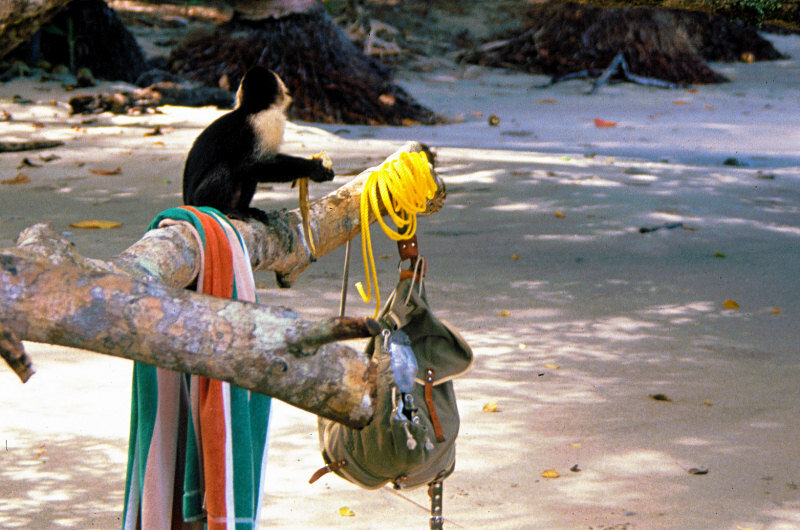 Hanging your rucksack from a tree may offer a certain protection against other species, however, the Capuchin monkeys are not easily deterred, especially if they know there are fruits to be found. 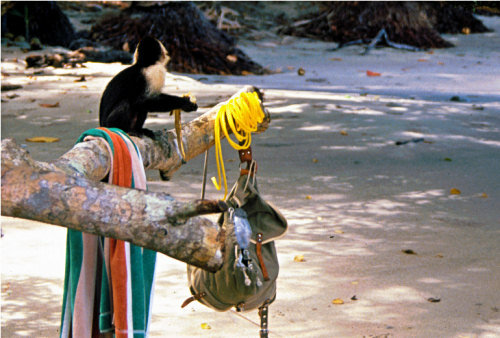 Actually, a few minutes later when nobody was looking, a colleague of the monkey in the picture retrieved a shopping bag full of fruit from another traveller and disappeared with it in a high tree. Seen on a Costa Rica beach. click on the pictures to see a larger version. 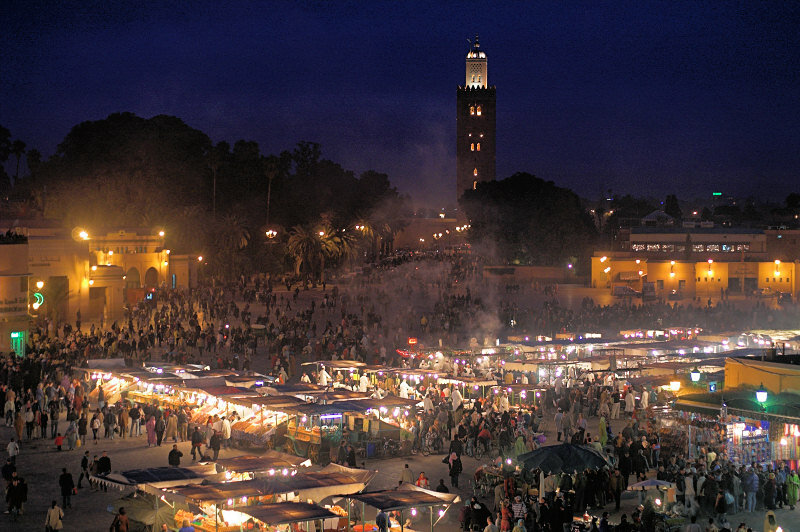 I was fortunate enough to get a table with an excellent view of Marrakesh’s main square on the evening before my flight back to Germany. The sunset itself was not spectacular, but seeing the lively Place Jemaa el Fna and the spire of the Kotoubia Mosque under a rapidly changing sky was truly beautiful. 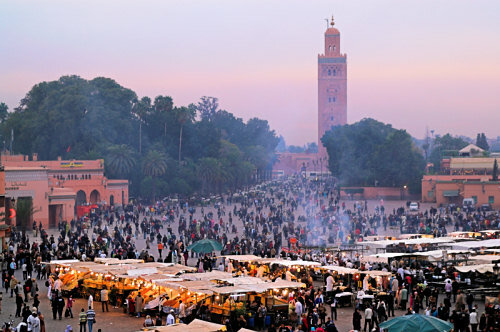 The square itself is already quite lively during day time and offers many attractions: there are many fruit stalls, musicians, magicians, tea vendors and artisans. When night falls, however, it becomes even busier: there are long rows of food stall catering to tourists as well as the local population and Many people are passing through on their way to the extensive souks surrounding the square. On the photos you can see the smoke rise from hundreds of grills. Wikipedia told me that the name comes from the Arabic for “Assembly of the dead” and indeed, the heads of many executed people were on display here in ancient times. 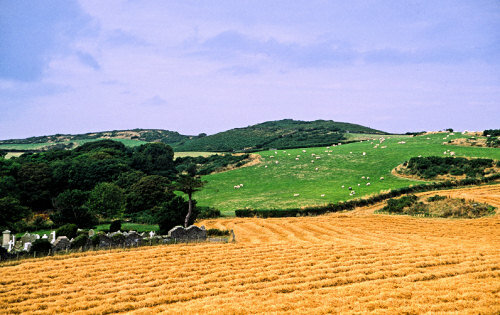 A small cemetery between fields somewhere on the Isle of Man. A street scene in the Kasbah area of Marrakesh, near the Saadian tombs. Not a full-fledged tea-ceremony - but still a very meditative process: with her back to us, a woman prepares two cups of green macha tea in Tokyos Shinjuku Gyoen Park. 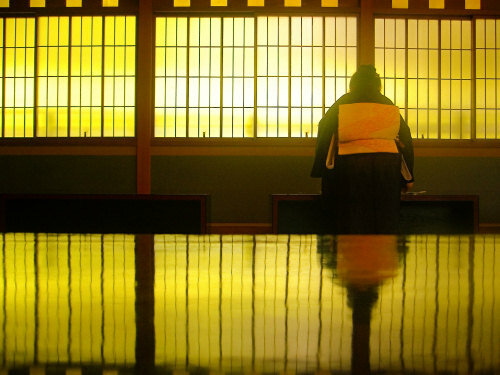 Her silhouette is reflected on the lacquer wood of the table. More on Shinjuku Gyoen Park at Wikipedia. 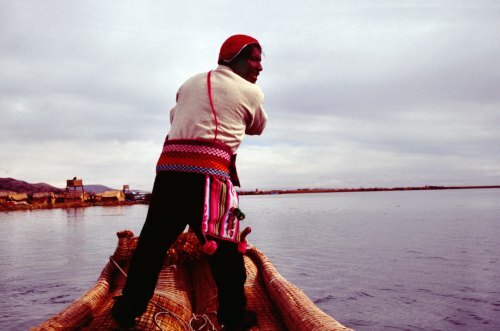 A few days ago, I posted a rowing boat in Essaouira now here is a slightly simillar small boat in a completely different setting at Lago Titicaca, Peru. 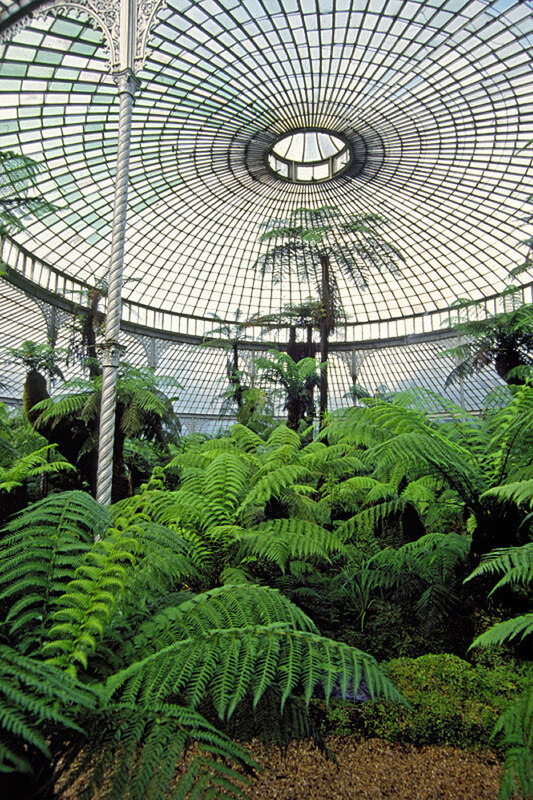 I took this picture inside Kibble palace, a world-famous glass-house in the Glasgow Botanical Gardens, back in 1993. 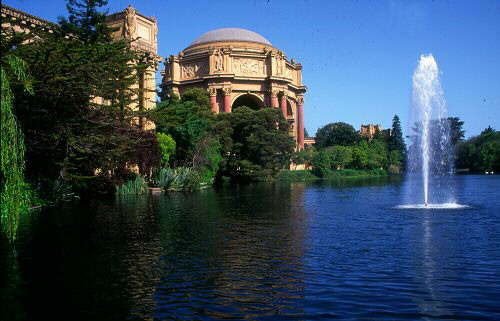 When I revisited the botanical gardens in 2005, this attraction was closed for restoration. One more reason to return to Glasgow some time later and see what this great building looks like now! Bodhgaya is maybe the holiest place in Buddhism as Siddharta Gautama (the historical Buddha) is said to have attained enlightenment here. 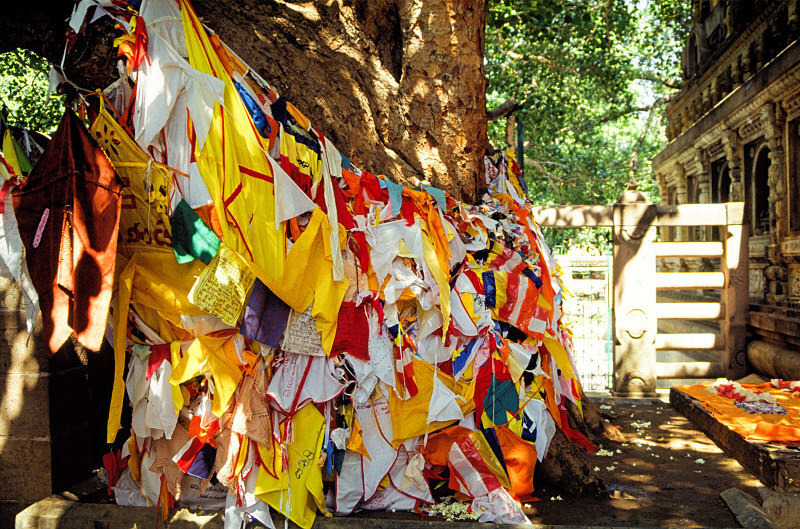 The tree brightly decorated at the Mahabodhi Temple is said to be a direct descendant of the actual one under which Buddha was meditating when this happened. 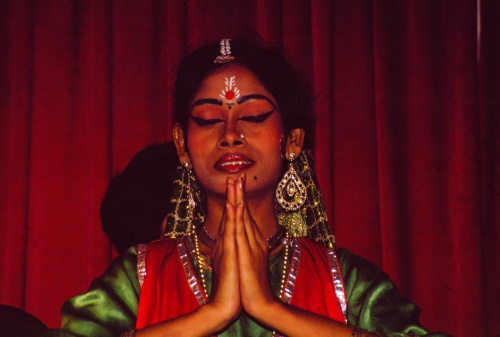 A dancer in a dance show in Calcutta (India). 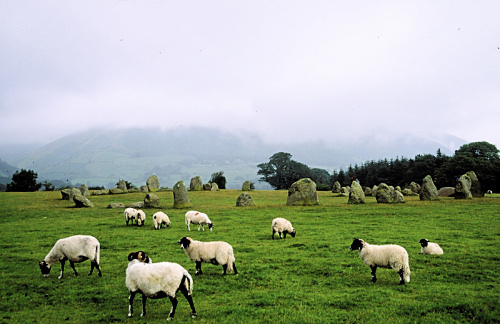 It seemed as though the sheep (unlike tourists) would not really like to wander within the ring. Cosmic energy? Training? Or do they just perceive the stones a sort of solid barrier? 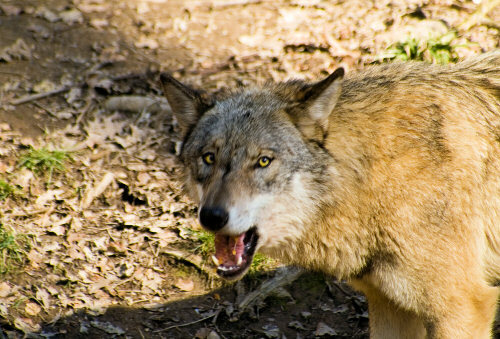 Hungry Prisoner, originally uploaded by laurenz. 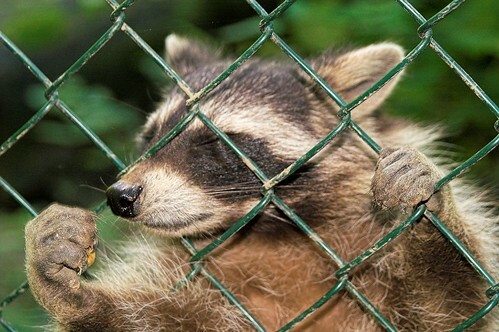 A racoon in Wiesbaden’s “Fasanerie” is begging for food. Who’s that?, originally uploaded by laurenz. 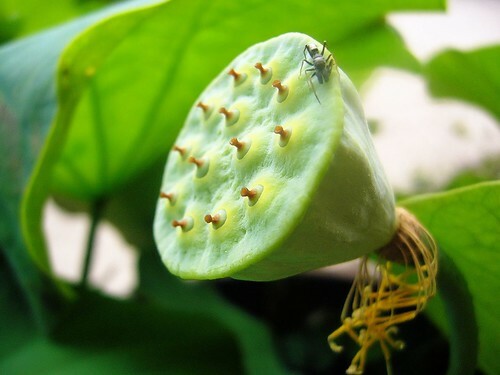 no idea what type of bug this is - but it sure is sitting on a beautiful lotos seed pod in a Fukuoka temple. Seagull, originally uploaded by laurenz. highly recommended: a boat trip on a beautiful day near Otaru (Hokkaido). Otaru itself is a pleasant enough city, but the colourful harbour is a photographer’s paradise. 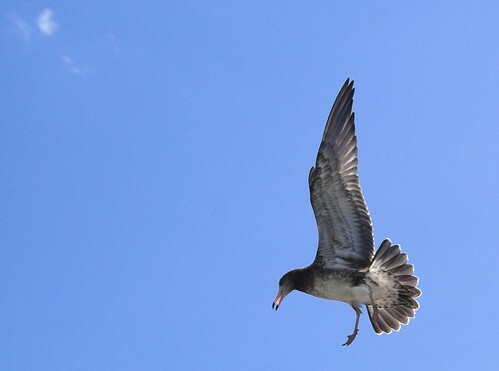 One of the attractions aboard are the seagulls which are attracted by crumbs of bread thrown into the air by some passengers. Sapporo Reflection, originally uploaded by laurenz. 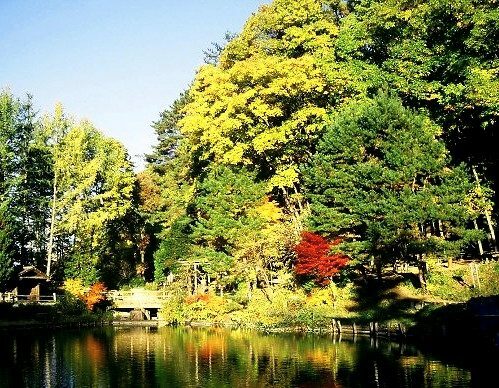 There is a small park with two beautiful ponds next to the old Sapporo government building. A very meditative spot right in the centre of this Northern metropolis. PICT7238-01, originally uploaded by laurenz. The “Okano” crater lake at Zao San (Near Yamagata, Japan) lies still and displays its incredibly green colour - for a few seconds before it is again covered by mist. PICT6001-01, originally uploaded by laurenz. 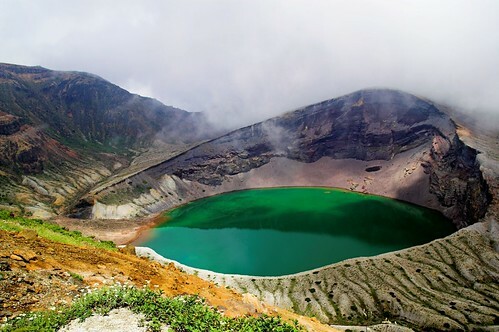 Much less peaceful: the crater lake of Mount Aso on Kyushu (Japan), also shows an impressive greenish colour. 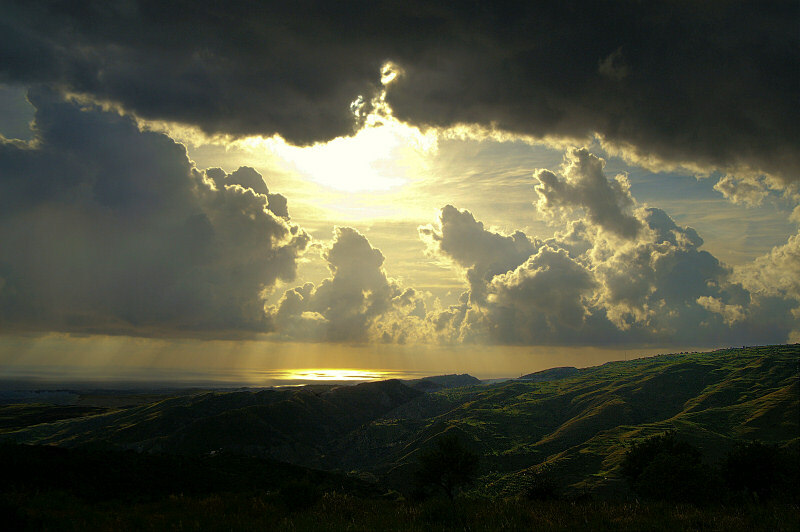 Mountain Sunset, originally uploaded by laurenz. 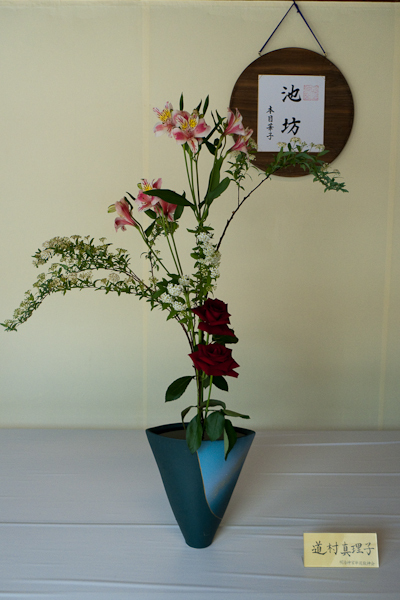 I saw this on the way back from the termal springs of Zao Onsen to Yamagata. Path in the Garden, originally uploaded by laurenz. 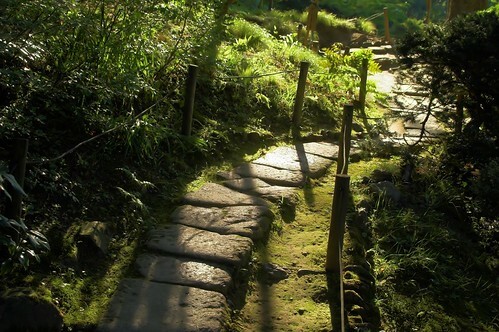 a footpath in the beautiful Japanese “Oyakuen” garden, Aizu Wakamatsu, Japan. 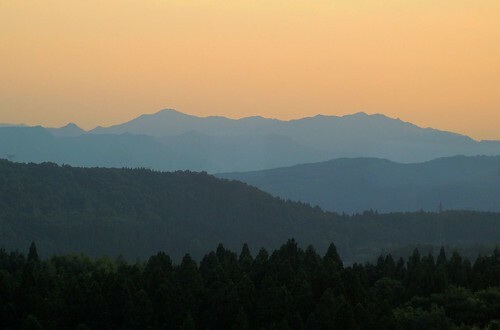 Kiyomiza Temple at Sunset, originally uploaded by laurenz. a magical moment in kyoto, Japan. 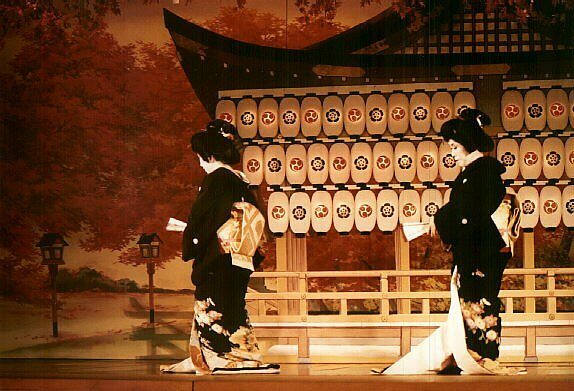 Japanese Theatre, originally uploaded by laurenz. 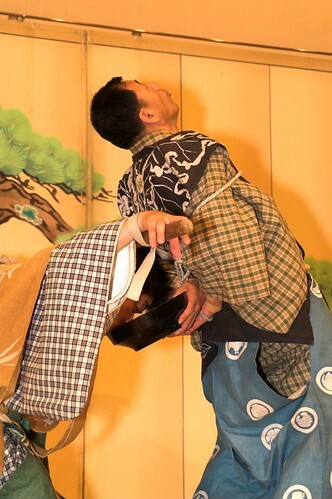 This is a scene from a funny “Kyougen” play: distrusting his servants, the a master binds them before leaving the house. However, even bound, they find a way to get to the master’s sake provisions and drink from it. 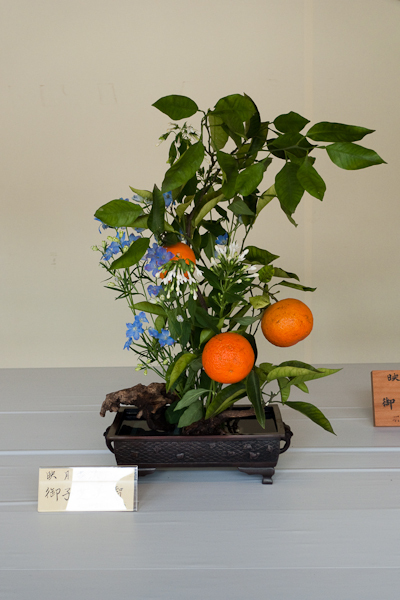 Gion Corner in Kyoto presents short snippets of Japanese arts including various styles of theatre, the tea ceremony and the art of flower arrangement. All this is quite touristy, but still fun and a good way to get some fascinating shots (you can even use flash throghout the performance). Kinkakuji Temple, originally uploaded by laurenz. 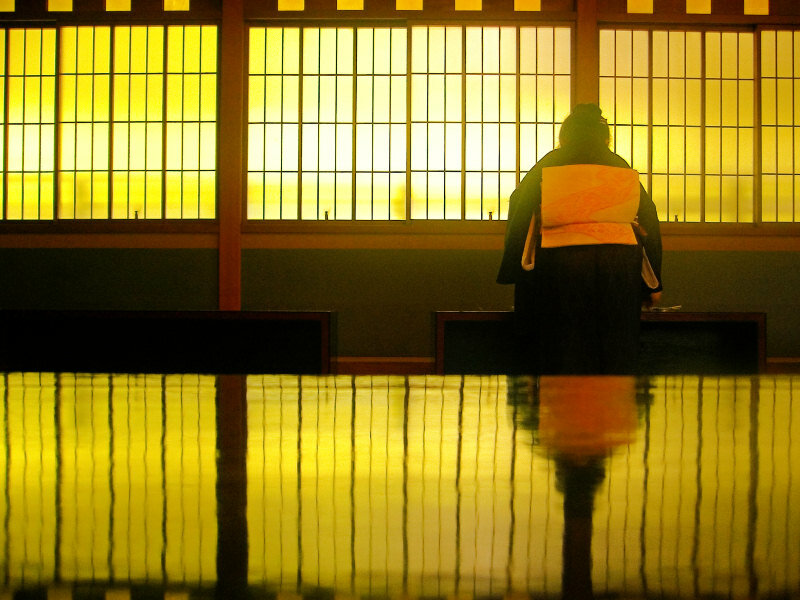 This is the famous golden pavilion that figures in Yukio Mishima’s famous novel “the temple of the golden pavilion”. Like the pavilion in the novel, the real one was burned down by fanatical young man. Mishima himself tried to stage a coup by taking a Japanese Military commander hostage. When he realised that hist plans for restoring the traditional Japan would not succeed, he committed ritual suicide. The real golde pavilion was rebuilt in 1987 this time also covering the lower storey with a relatively thick layer of gold. 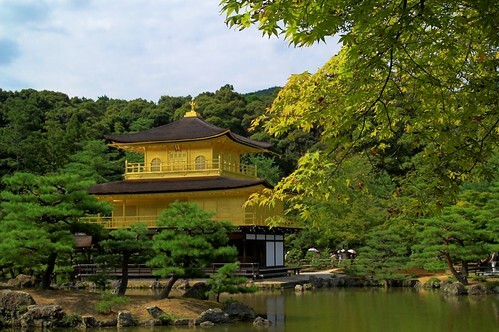 Popularly known as Kinkaku-ji, the temple’s real name is Rokuon-ji. 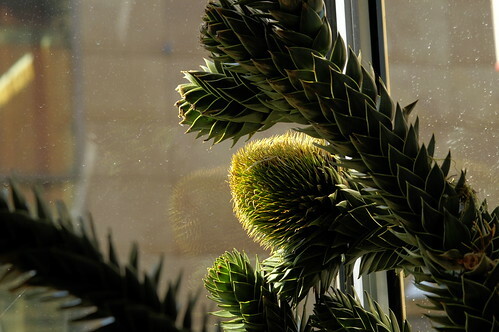 Araucaria, originally uploaded by laurenz. quite a big plant?- inviting passers by to enter a flower shop next to Wiesbaden’s “Marktkirche”. 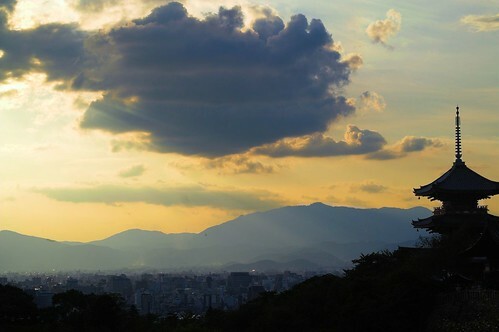 Fukuoka Sunset 2, originally uploaded by laurenz. another shot from the Fukuoka Tower at sunset. 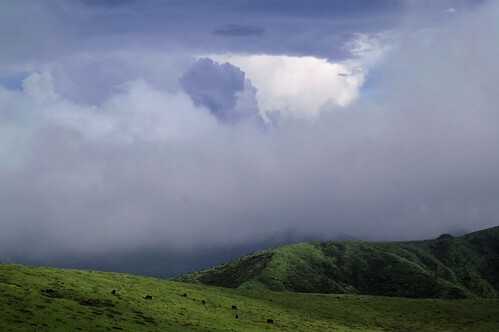 The way to Mount Aso, originally uploaded by laurenz. 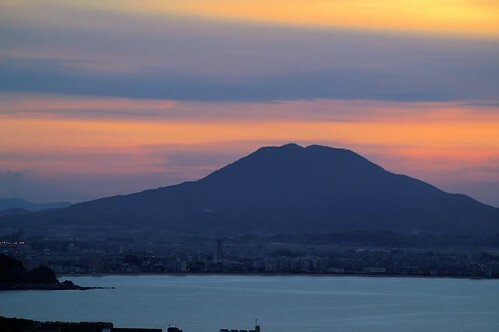 Mount Aso is one of the largest active volcanoes in the world and the largest one in Japan. 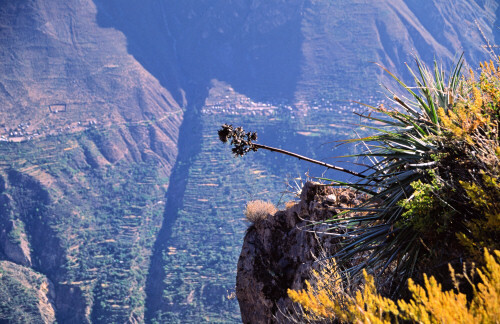 It’s almost 1600 meters high and its caldera has a circumference of 120 km. Nagasaki Atomic Bomb museum, originally uploaded by laurenz. next to the Nagasaki Atomic Bomb museum is a vault that you reach through grey concrete tunnels while always there is water flowing next to you. A very impressive place. The racks in the central vault hold the names of the victims of the second nuclear bomb. 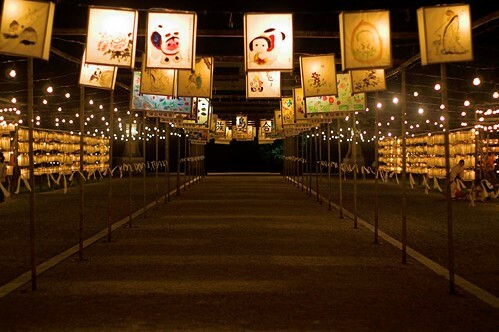 Lanterns at the Shrine, originally uploaded by laurenz. 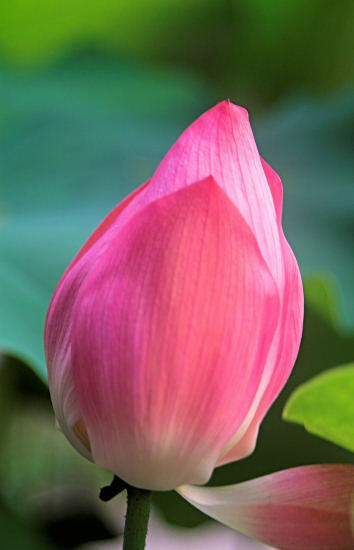 Lotos Bud, Tochoji temple, Fukuoka, originally uploaded by laurenz. 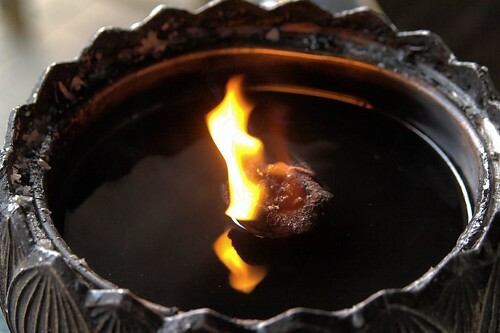 Oil lamp in Tochoji temple, Fukuoka, originally uploaded by laurenz. 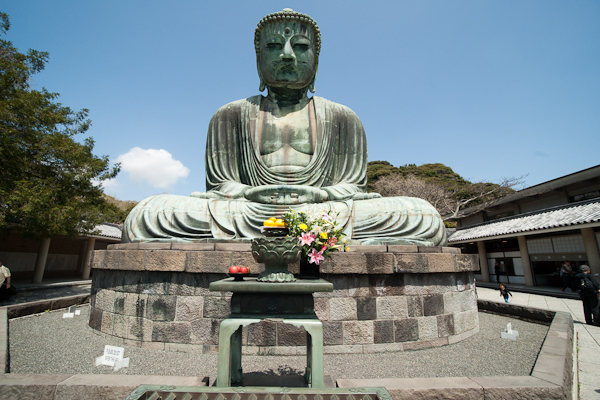 This temple is famous for holding the largest wooden Buddha statue in the world, but unfortunately photographing this impressive (albeit recent) statue is not permitted. Somewhere in Fukuoka, originally uploaded by laurenz. A temple in Fukuoka, Japan. 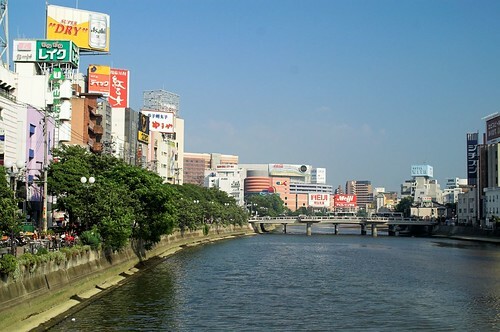 Naka River, originally uploaded by laurenz. ACROS Fukuoka, originally uploaded by laurenz. I placed my camera on the ground and shot upwards using a delay of 10 seconds. Konica Minlta 7d Sigma 15-30. 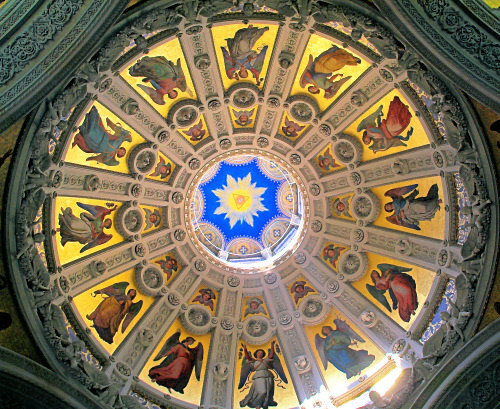 The cupola inside Wiesbaden’s Russian Chapel. A Skyscraper in Coral Gables, Miami. A dove sitting on a tree in Wiesbaden, Germany. Minolta Dynax 7d, Tokina 80-400mm lens. 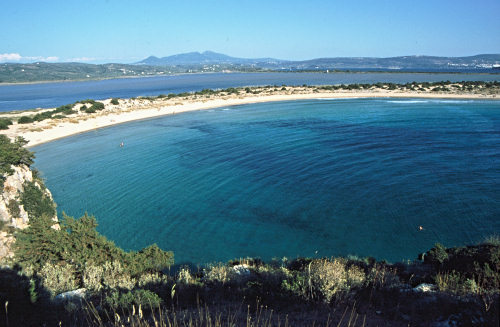 Voidokilia Bay is often referred to as “OX Belly Bay”, due to its peculiar Shape. It is located on the Peloponneses, near the much bigger Bay of Navarino where a famous sea battle took place. 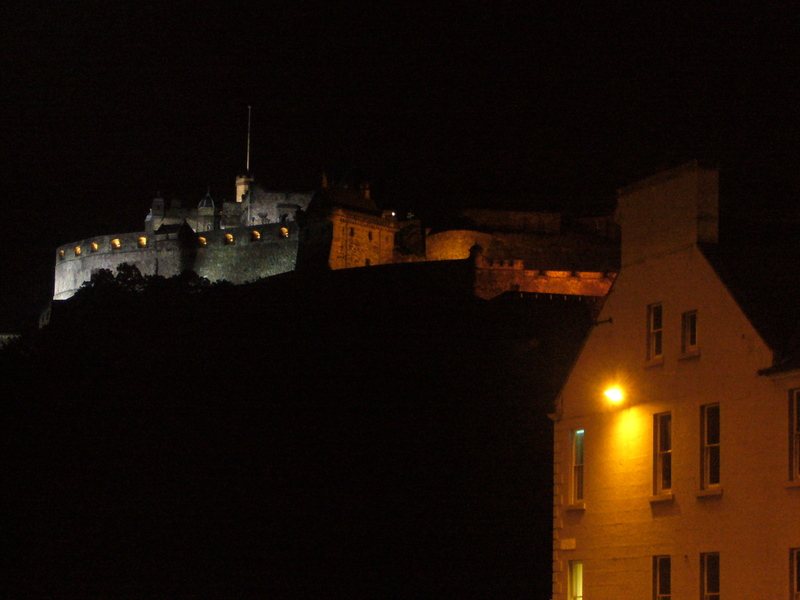 Right next to the main street, with Edinburgh Castle in the background. The Theatrium is the street festival of Wiesbaden’s most fashionable street, the Wilhelmstra�e. The name of course is related to the state theatre of Hesse which re-opened in 1977 with a relatively small festival. 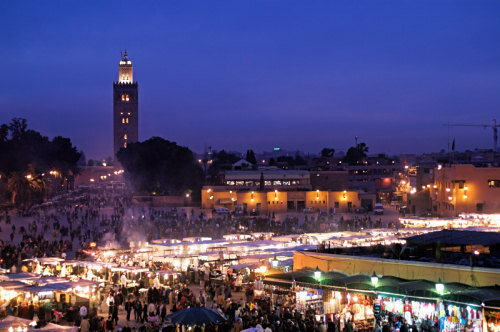 Today, there are several music venues, 140 food stalls, lots of street events and many artisans. This picture was taken at a Brazilian stall where one could buy the cocktails to go with the international speialties sold nearby. A stately knight enjoys his glass of local sparkling wine in Eltville (Rheingau). and it seems Chihuly has a number of other expositions going on at the same time. 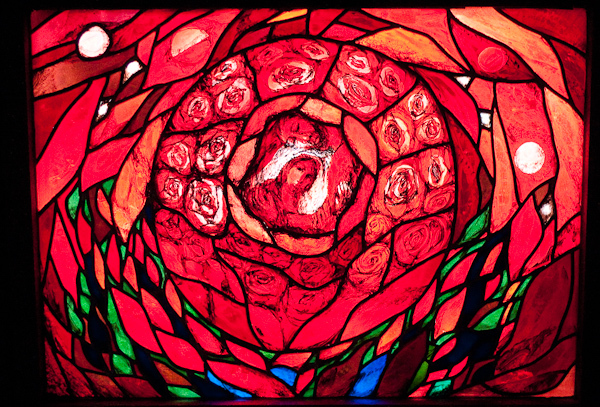 It turns out that Chihuly has not blown glass for a long time, but is responsible for the artistic design. Which brings us to an interesting law case, with Chihuly attempting to assert a copyright on “his” style of glass art and an assistant claiming co-authorship of several of the pieces. 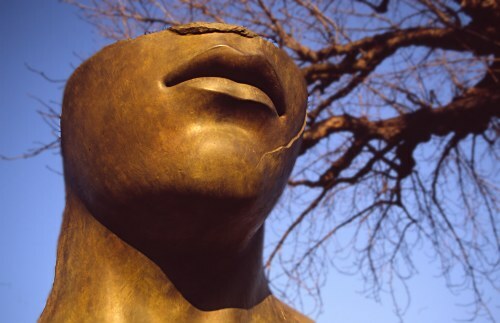 Lots of interesting questions involved here: what makes these sculptures art? The technical perfection? The design, the context in which they are presented? Is it really possible to clearly define a “Chihuly style” that is different enough from other artisans’ work to be copyrighted? Is “Chihuly” more of a brand name under which other artists’ works can be sold? 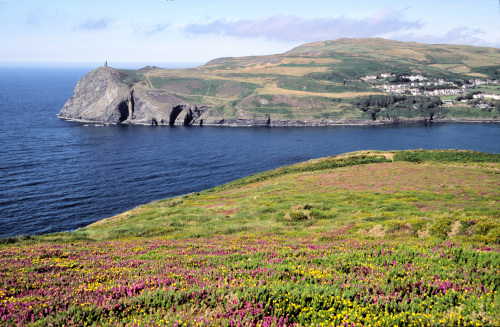 This was taken on a walk from Port St Mary to the “Calf of Man” along the famous Raad Ny Foillan walk. 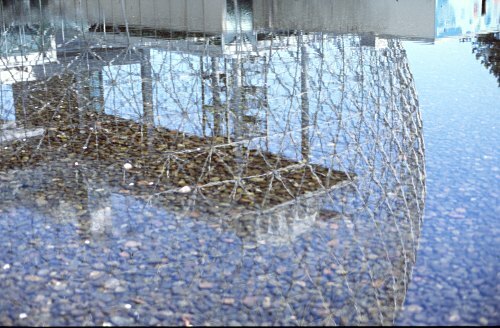 By the way: I had two cameras with me, the Minolta Dynax 9 loaded with Fujichrome Velvia 50 with which I took the picture above and a small digital Panasonic Lumix FX8. 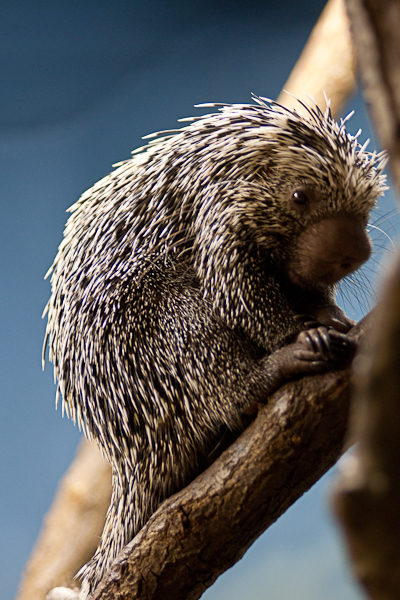 Today, I visited the “Fasanerie” a small zoo in Wiesbaden specialising in local animals. There now are many young animals, but especially the young foxes were everybody’s darlings. 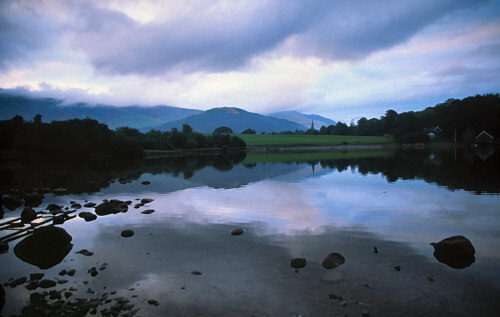 yet another shot of this picturesque highland lake. 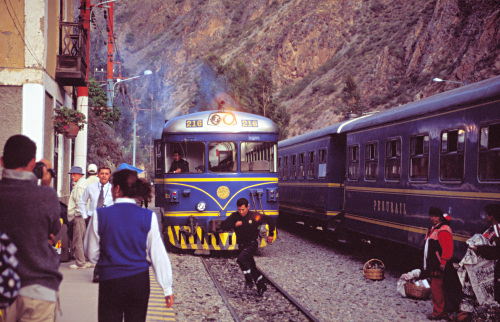 For most travellers visiting Machu Picchu from Cuzco, the starting point of the train ride is Ollantaytambo. 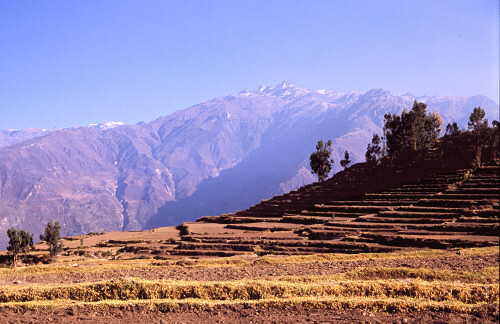 It would be a pity though to miss out on the Inca ruins in Ollantaytambo itself, which are also very impressive. Some glimpses of the Chihuly exhibition in Fairchild Garden (Miami, USA). 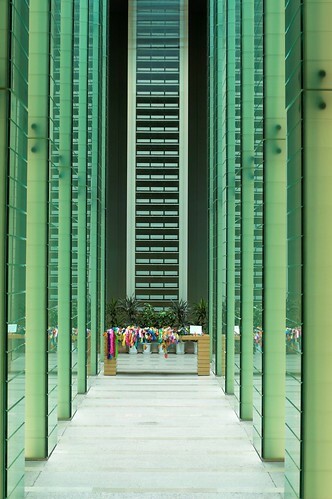 I found it incredible how well the glass exhibits fit their surroundings and complimented them. 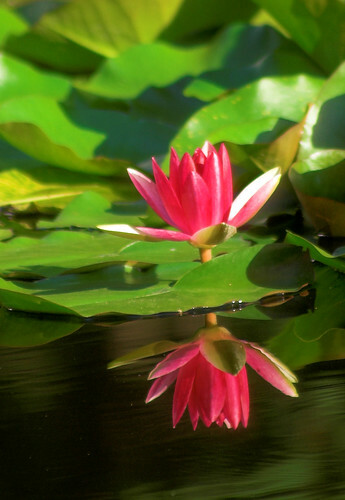 Sometimes, it was hard to tell whether a particular flower was natural or not. On another weblog, I found a reference to a Chihuly Exhibition at Missouri Botanical Gardens, as well as quite a few photos with installations ver ysimilar to the ones I saw in Miami. 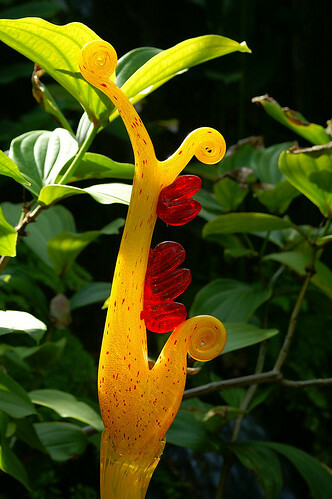 More on the artist and the glass objects created by him on the official Dale Chihuly Website. in a nearby park, Wiesbaden, Germany. Luminale Wiesbaden, originally uploaded by laurenz. These are the last minutes of the Luminale for Wiesbaden. This event took place in most of the Rhein Main area with illuminated buildings and art projects everywhere. 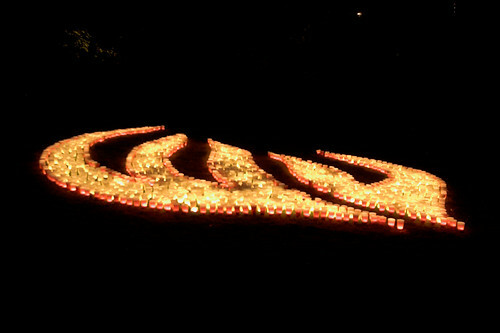 In Wiesbaden, the “Kurpark” was illuminated by many art installations. Goose Family, originally uploaded by laurenz. 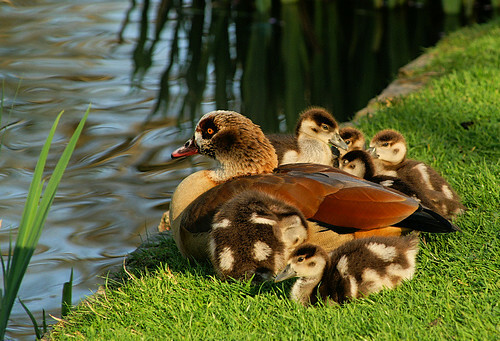 Mother goose with her young. A moment later, they all would get under a her right wing! 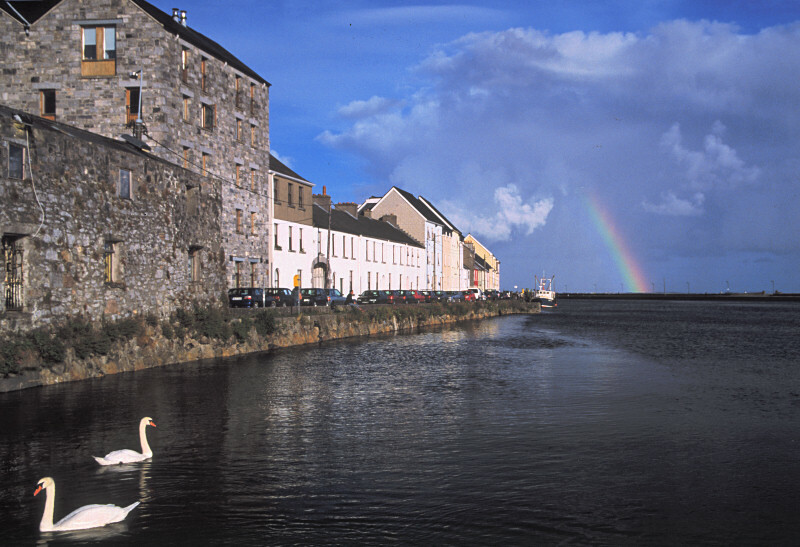 A very pleasant toen in Ireland. There are many volcanoes in the Chilean altiplano, but it is only when you come to the thermal springs that you really get an impression of the volcanic activity that formed these mountains. church windows in St Stephan, a catholic church in Mainz. 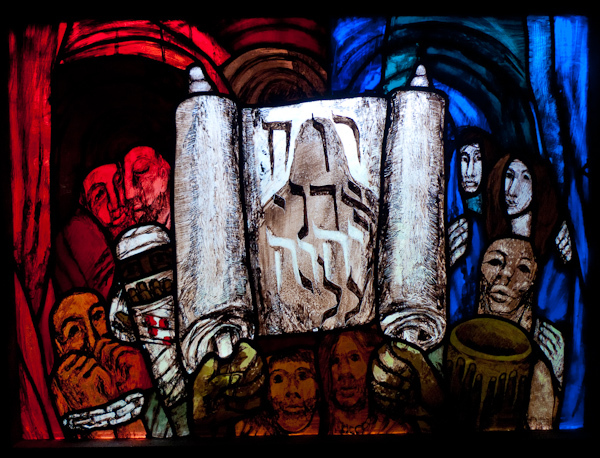 The blue glass windows by Marc chagall are a major tourist attraction. This is a Greco-Roman building near the Kalabsha temple. Actually, the kiosk now stands about 20-30 km from its original site - like many other archaeologic treasures it was moved before the Aswan dam was opened. 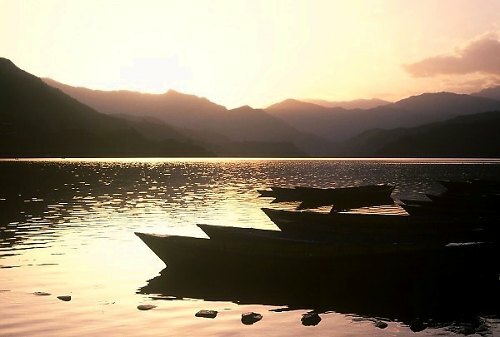 Locarno Sunrise, originally uploaded by laurenz. 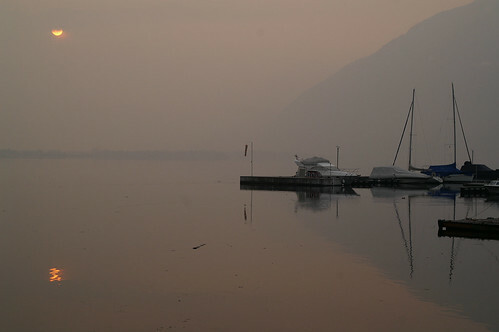 Sunrise in Locarno on an overcast day. Turtle head, originally uploaded by laurenz. 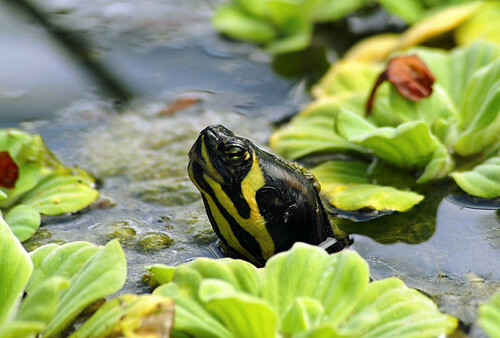 Shot with a tele lens in the botanical gardens of Puerto de la Cruz (tenerife, Spain). Due to bad weather the main carnival event had to be postponed. So the procession in Santa Cruz took place in the evening which completely changed the atmosphere. Yesterday, I visited Loro Parque - a zoo that once specialised in parrots but now also has a huge penguin area and a spectacular dolphin show. Beautiful and a good choice if one can’t be too sure about the weather. 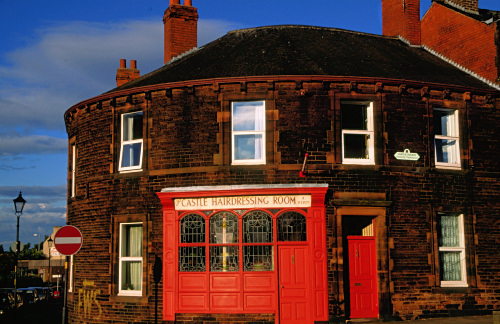 A hairdresser in Carlisle North England. 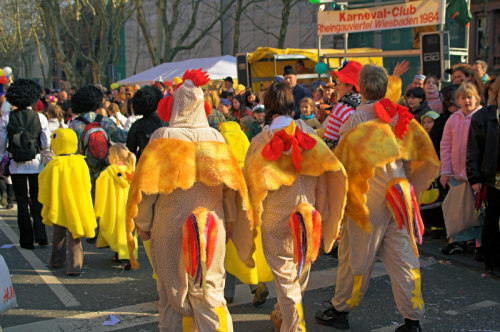 Even though the big carnival parade in Wiesbaden only takes place tomorrow, there were many international groups to be seen in the city today. This is a costumed musician from Basle (Switzerland). 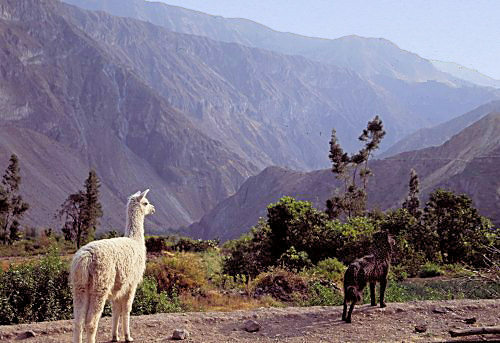 A white llama and a black dog are looking into the Colca Canyon (near Arequipa). I took this photo on one of those big revolving balls made of granite - the somewhat ghostly appearance comes from the structure of the stone. Otherwise, this is just a normal street scene on a beautiful winter day in Wiesbaden, Germany. 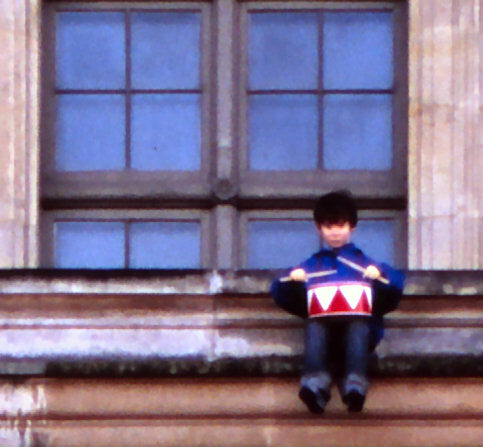 More photos from the same occasion on a special site I dedicated to my hometown Wiesbaden. The official page of the city. 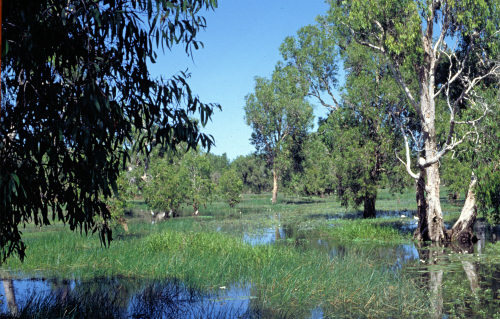 A great place to see some birdlife - and lots of water after the desert: Cooinda in the Northern Territory. 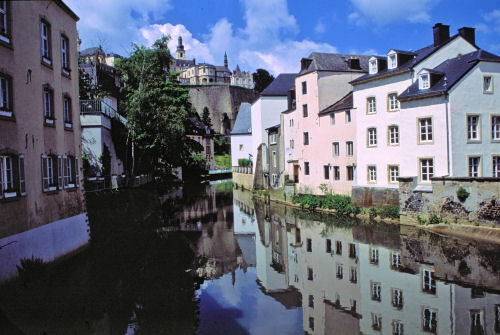 Another shot from the pleasant town of Luxembourg. The new part of the city is a busy economic centre, however. 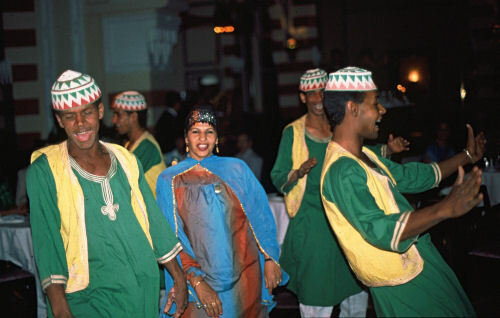 An Egyptian Dance Group in Aswan, 1992. Luxembourg is a very small country, but as a host to many important European instututions it is also one of the wealthiest states in Europe. Surprisingly, the city of Luxembourg is a very green place and you can see such seemingly “rural” scenes right in the centre of it. The “moon valley” in the Chielan Andes - one of the most spectacular lanscapes I’ve come across on my travels. Varanasi is maybe the “holiest” place in Hinduism. Many people believe that “death in Varanasi is Liberation” meaning that if you are cremated here, you have a good chance to escape the cycle of rebirth. 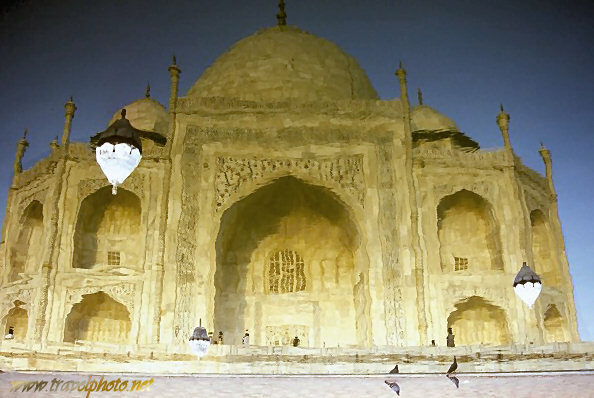 Consequently, many people come here to die, dead are brought here for cremation and there are millions of pilgrims. There are over 100 “ghats”, some of which are dedicated to burning bodies while others are pure bathing ghats for the ritual cleansing (puja). There also are plenty of small rowing boats for pilgrims and tourists who want to see this all from the water of the holy river Ganges. 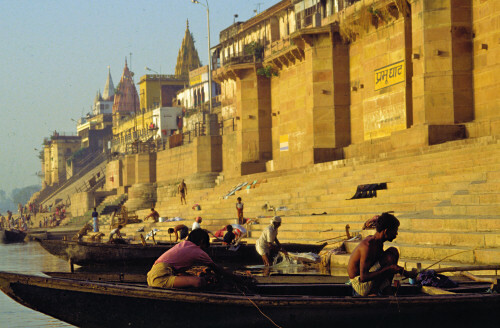 Other names for Varanasi: Benares, Banaras, Kashi. Aren’t these nice autumn colours? 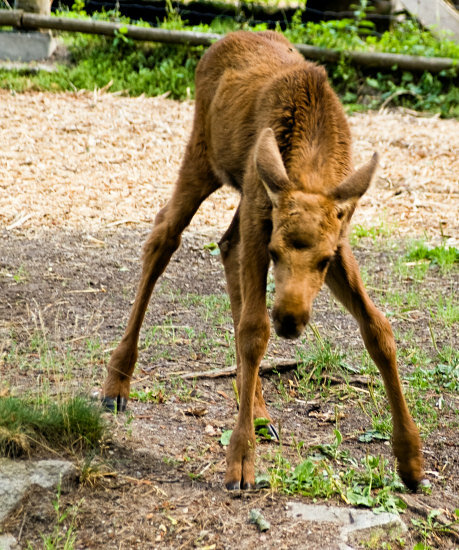 That’s what the local park is like right now…. 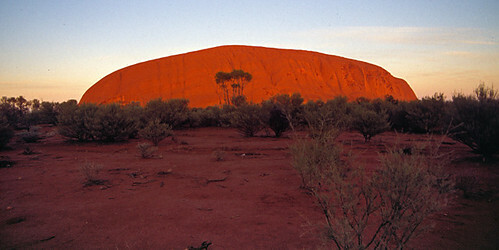 Ayers Rock in the evening. It is amazing how the colours change in the course of a day. This is due to reflecting particles in the rock itself. The statue of Leonidas, the famous king of Sparta (or Sparti) who led his small force to certain death against a huge Persian army at the pass of Thermopylae. The photo was taken in bad weather using fill flash. 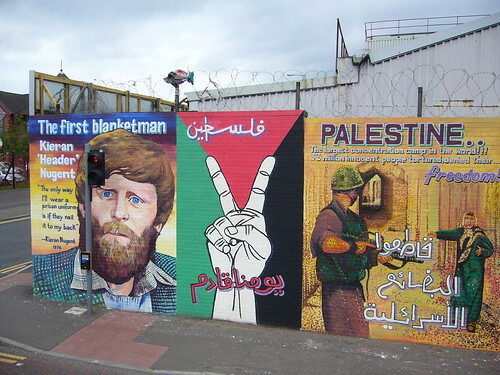 now that the “troubles” are (mostly) over, the Belfast murals are mainly a tourist attraction, visited by bus and taxi tours. 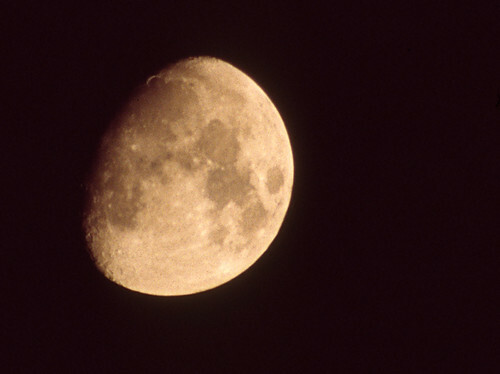 After my Aswan moon photo I now took a photo in my home town, using the same equipment. Taken during the Fringe Festival in Edinburgh, Scotland. Taken at the same time as my shot of the Sydney Harbour Bridge. 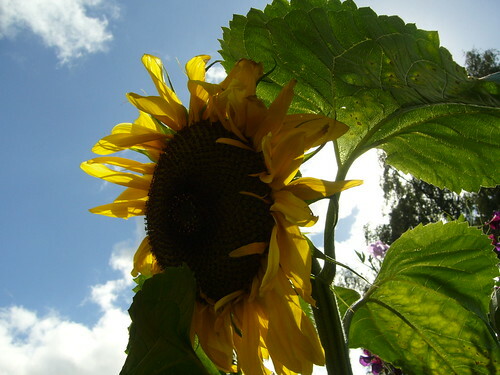 Sunflower, originally uploaded by laurenz. 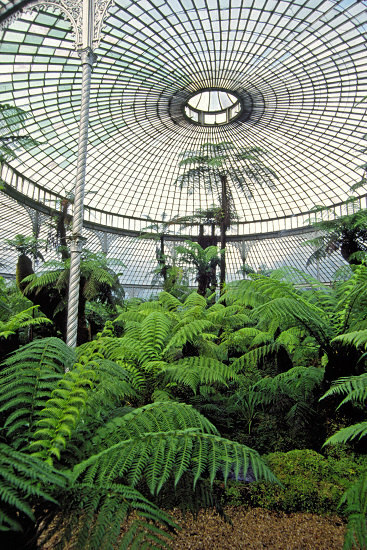 seen in Glasgow botanic garden. 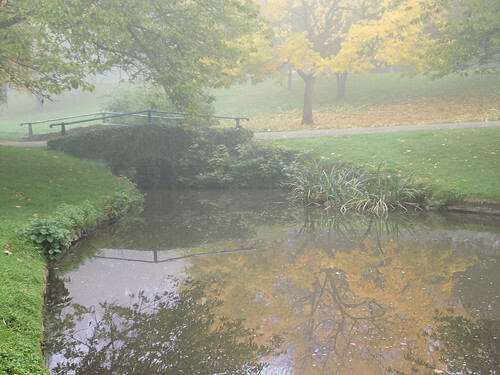 Fog in the Park II, originally uploaded by laurenz. 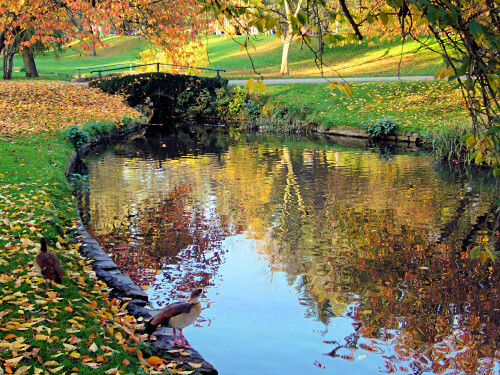 also taken in the “Walkm�hltal”-Park, Wiesbaden (Germany). Bridge at Athlone, central Ireland, at night. and here a shot from the Lake District: Derwent Water, near Keswick. Loch Morlich (Scotland) shortly before sunset. Another shot from the local flower shop. A macro shot I took at the next flowershop with my Lumix FX8. No tripod, no filters. 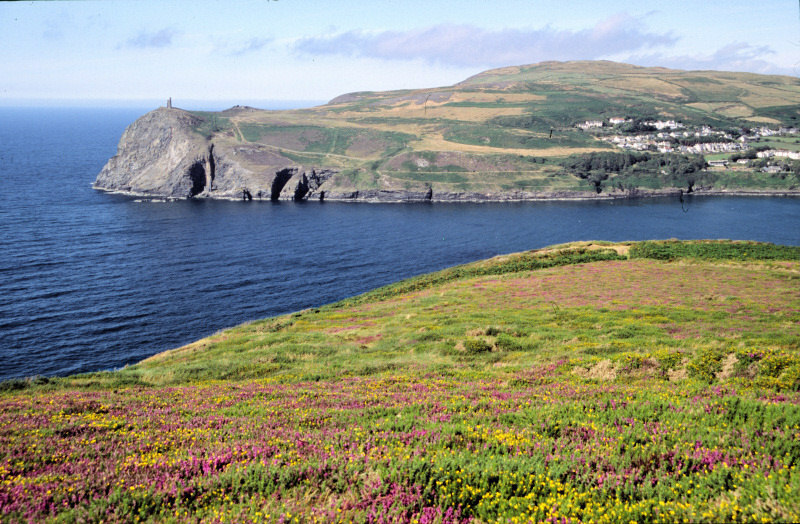 Coastline, Isle of Man, originally uploaded by laurenz. You can walk all around the island. I didn’t have the time to do so, but tried a walk around the Southern tip and another one from Ballaglass to Ramsey. 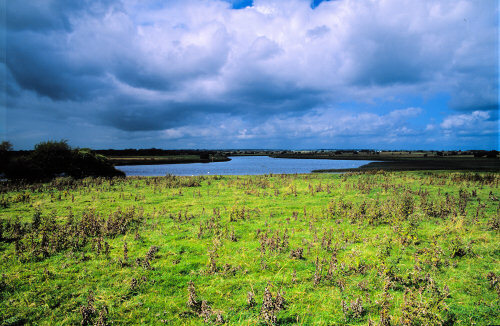 This photo was taken near Ramsey. Passers-by, originally uploaded by laurenz. Presumably actors from one of the many theatre performances going on simultaneously in the hundreds of venues. 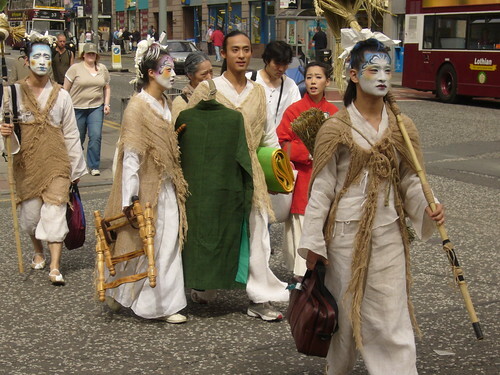 This is a picture from the 2005 Edinburgh Festival. Flash photography was explicitly prohobited so I took this shot without flash with my small Lumix FX8. 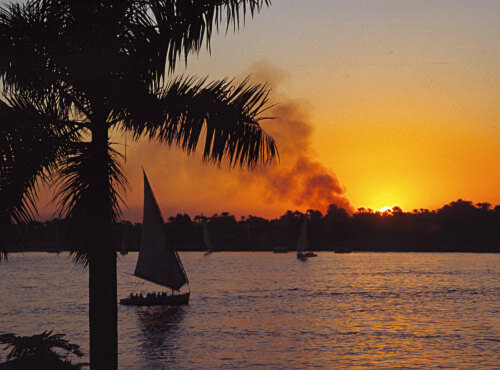 Yet another sunset over the Nile. taken from the east bank of the river. 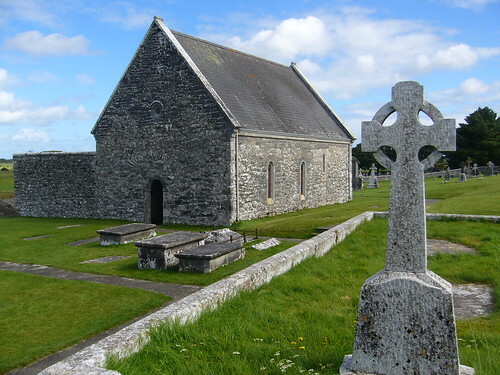 Clonmacnoise was founded by St. Ciaran about 1500 years ago. Although the monastery itself was destroyed by the English, it is still regarded as a place of high religious significance - and also is a major tourist attraction. I especially like the beautiful setting. 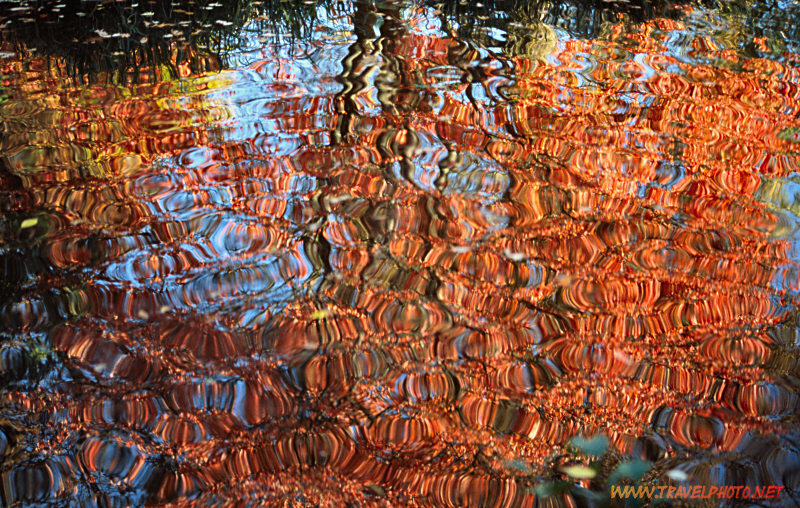 Within a couple of hours, I”ve seen this river in rain, beautiful sunshine and many different lights. I took this photo only a few minutes ago with my small Lumix - digital photography sure has its advantages. 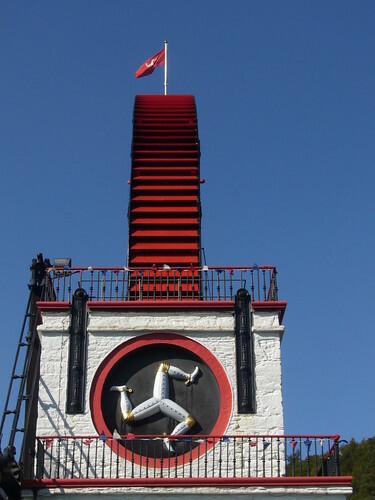 Maybe the most photographed tourist attraction of the Isle of Man, this is one of the wheels in the old mining town of Laxey used for lifting huge quantities of water. Please excuse the somewhat unusual perspective, but I do not have access toimage editing software while travelling. 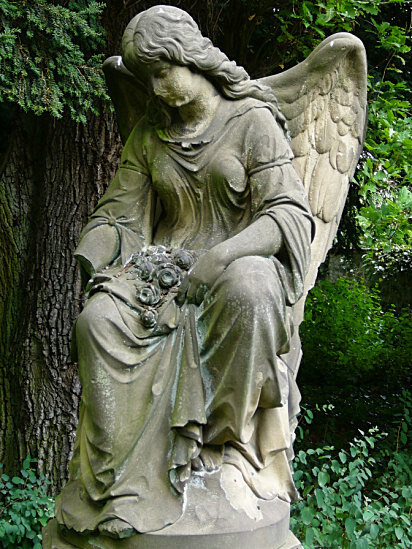 Grave on the old cemetary of Wiesbaden. 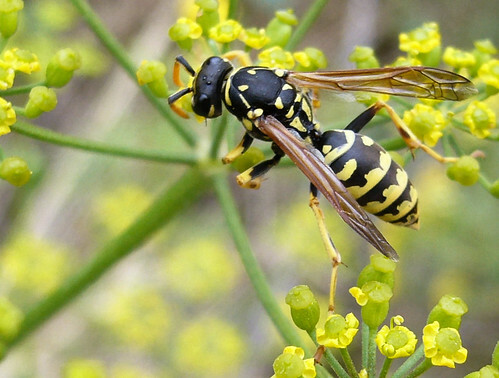 Cropped Wasp, originally uploaded by laurenz. a macro shot of a wasp taken in Wiesbaden Schierstein with my tiny Lumix FX8. Wiesbaden: Russian Church, originally uploaded by laurenz. 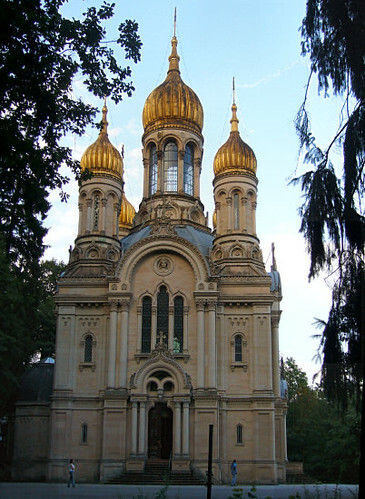 in Wiesbaden itself, this building is universally known as “Griechische Kapelle” (Greek Chapel). It was, however, built for Elisabeta Michailovna, the Russian wife of the grand Duke Adolf of Nassau. A striped shiel bug sitting on a flower. Seen on a walk in Wiesbaden-Schierstein. 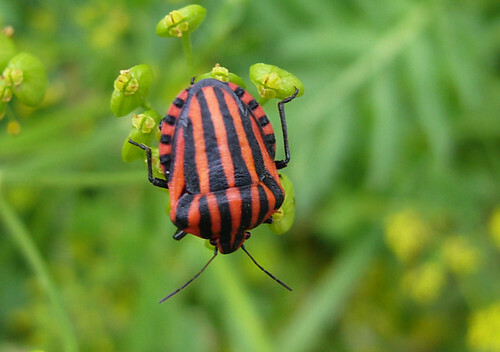 The scientific name of the animal: Graphosoma lineatum. One more reflection seen in the Walkm�hltal, Wiesbaden, Germany. 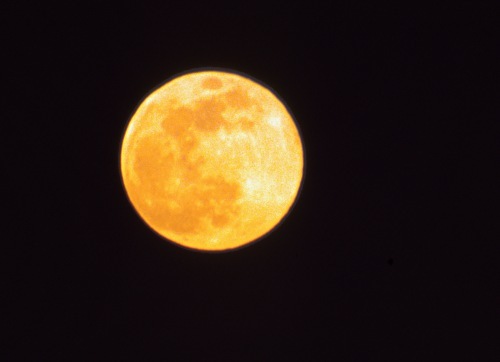 The moon seen from a camp in the Australian outback. Well, even before I took this photo, I envisaged turning it around in the slide tray. And another shot taken on the same occasion as yesterday’s. 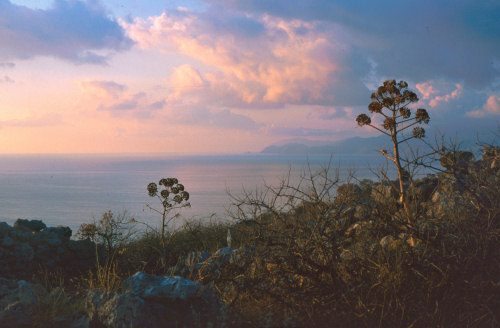 This was taken from the ruins of the upper town in Monemvas�a. 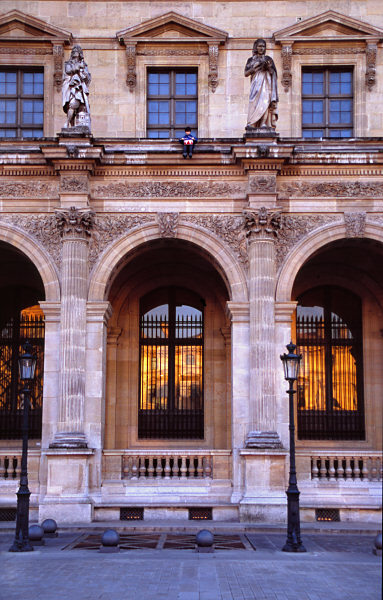 When looking for reflections of the Louvre in the windows of the Louvre, I realized a little figure sitting precariously high under the windows of the world’s most famous museum. 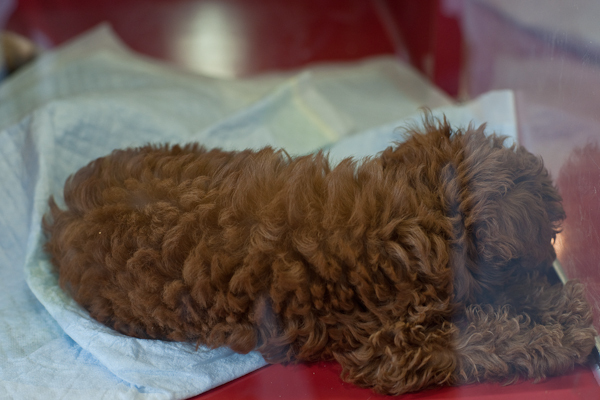 Only when looking at him through my tele lens, I realized that this was art - not suicidal behaviour. I wonder how many times a day the police are called to help? Presumably it’s just a reference to G�nter Grass’ Oskar Matzerath from the “tin drum”. Enlarged view of the boy with his tin drum. 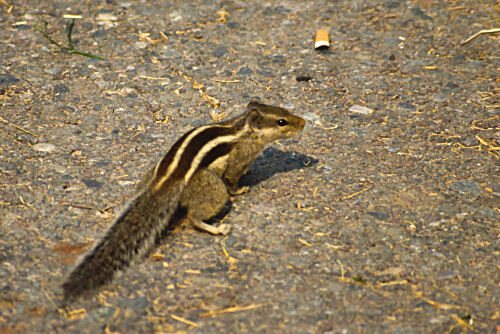 I have seen all sorts of squirrels in parks, but the chipmunks in Agra and other Indian cities were not the least shy. Bodhgaya is a pleasant town situated at the shores of the Niranjana river. 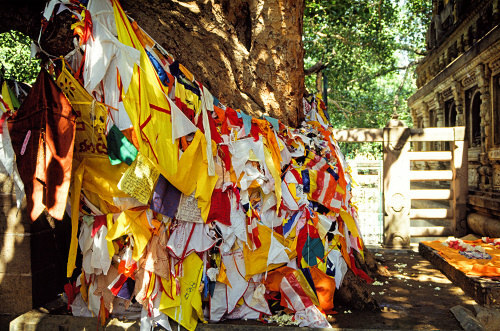 There is, however, one thing that sets this place apart from all others: here, under a Bodhi tree, prince Siddharta achieved enlightenment and became “the Buddha”. So, Bodhgaya is one of the holiest sites for Buddhists and there are monasteries from just about any Buddhist country. Very interesting to visit, - but exploring rural India is just as rewarding! A fishing boat on Loch Morlich in the Cairngorm National Park. 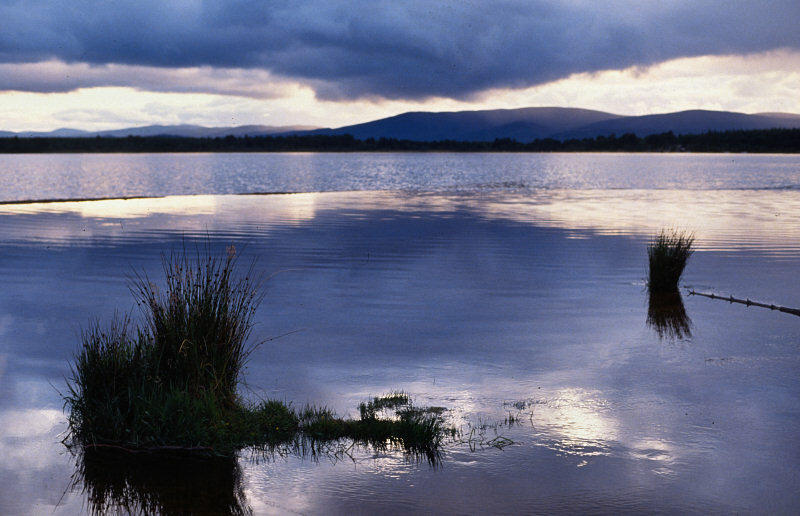 This picture was taken only a few meters from “Rainbow in the Cairngorms”. 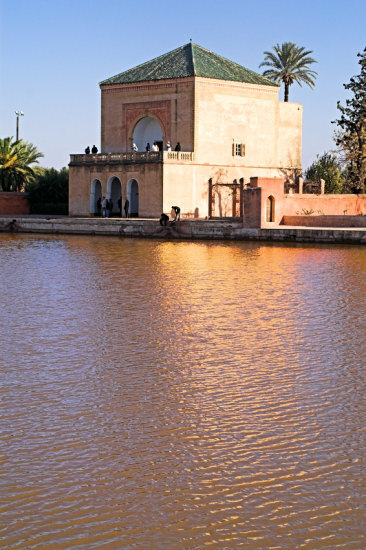 Like the other famous Andalusian cities (Granada, C�rdoba…), Sevilla also has an “Alc�zar” - a Moorish fortress. 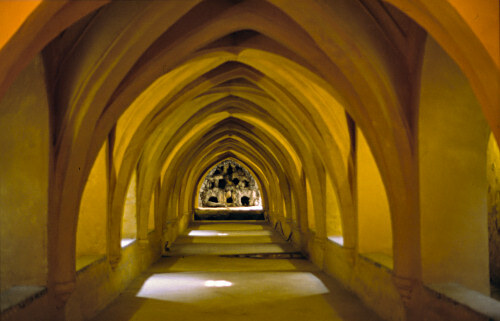 The one in Sevilla dates back to the 8th century, but much of the current site was actually built after the reconquista in the times of Pedro the cruel who nevertheless employed Moorish architects and artisans. The palace-fortress has beautiful gardens and right next to them are some vaulted baths. 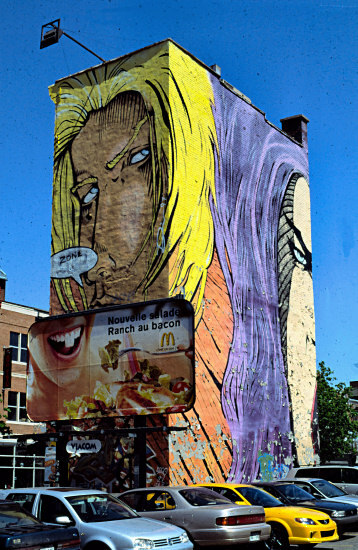 A house that is painted in bright colours with comic-like faces on all sides. 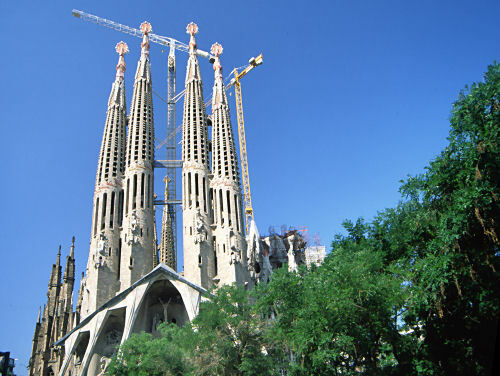 The Sagrada Familia, Barcelonas newest cathedral, has been a building site ever since 1882. It is foreseen that carrying out the plans of Antoni Gaud�, even using materials not available at his time, will take another 80 years or so. On the other hand, the first restoration works are already taking place. The church itself is a peculiar mixture of Gothic and modern elements. Definitely worth a visit - after all where else can you see a cathedral in the making? 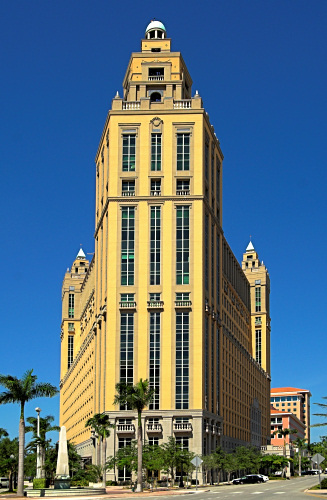 Antoni Gaud� (1856-1926= is one of the most important modern architects. 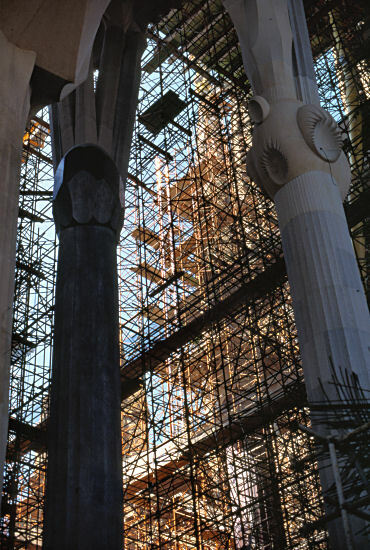 In Barcelona, it is hard not to come across at least some of his works: Parc G�ell, Palau G�ell, many private houses and, of course, his most important project, the Sagrada Familia. 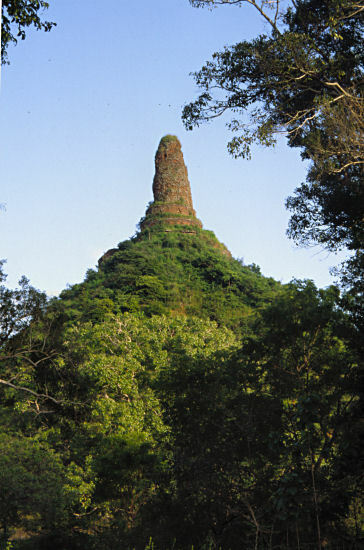 The Buddhist “dagoba” once was among the greatest of its kind, but now it is completely overgrown. A stupa is a Buddhist monument, normally housing a relic. 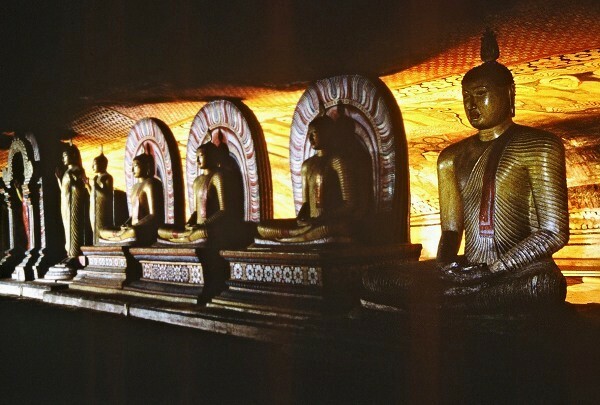 In Sri Lanka, the stupas are called “dagoba”. This one once housed the famous tooth relic now venerated in the Temple of the Tooth in Kandy. 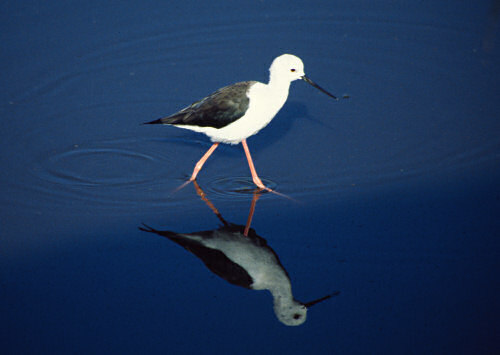 I saw this bird near Cape Town - if anyone knows the name, please tell me! 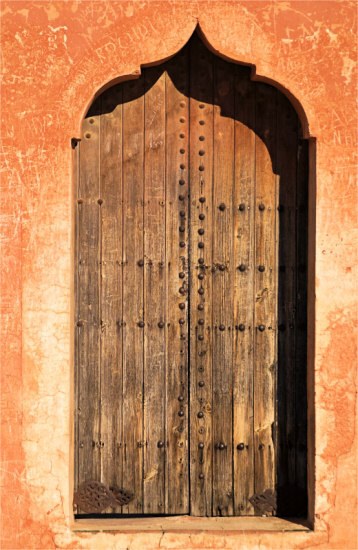 One of the most striking archtectural achievement in Northern Africa are the “Ksour” (plural of “Ksar”), fortified Berber strongholds consisting of many rooms called “ghorfas” used for storing grain. 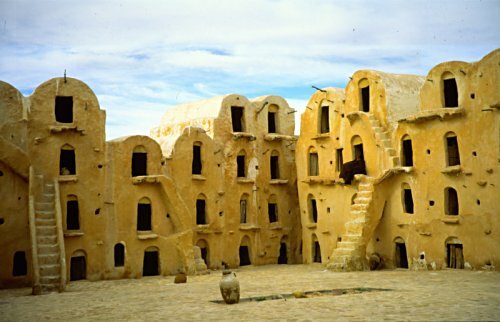 The structures look so outlandish and bizarre that Geaorge Lucas used them as the backdrop for his planet Tataouine (actually a small city in Tunisia) in star Wars, home of Anakin Skywalker. Right next to the gigantic Centre Georges Pompidou, there is the small Igor Stravinsky place with a very colourful fountain. 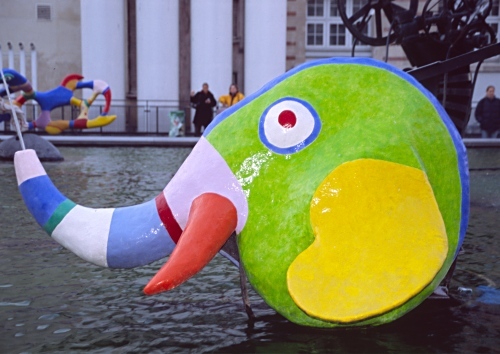 The sculptures of the fountain are by two well-known modern artists: Niki de Saint Phalle and Jean Tinguely. 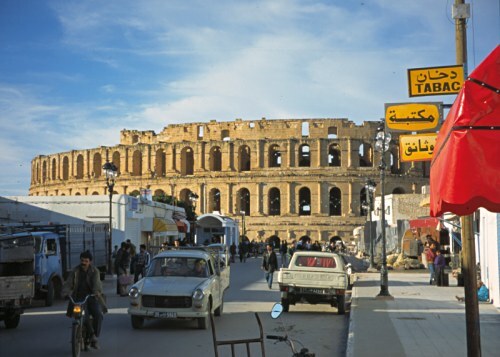 Although this colosseum very much looks like the one in Rome, it’s actually located in the Tunisian city of El Jem. The contrast between the third largest amphi-theatre of Roman times and the smallish city below it couldn’t be greater. 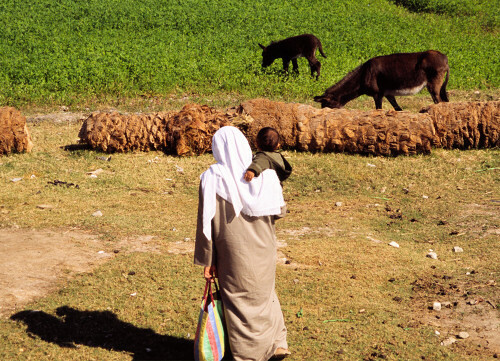 Seen from the park beside the Old Cataract Hotel, Aswan. 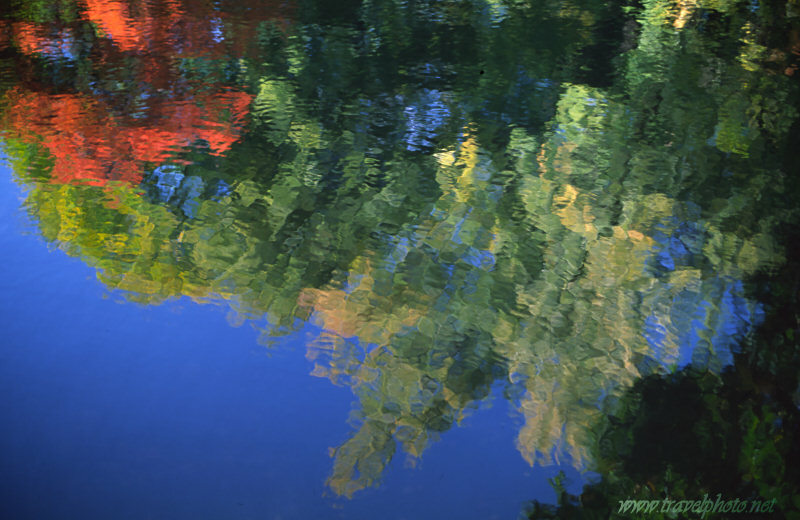 Reflection of the Biosphere in Montreal. Seen on a birdwatching trip near Capetown. 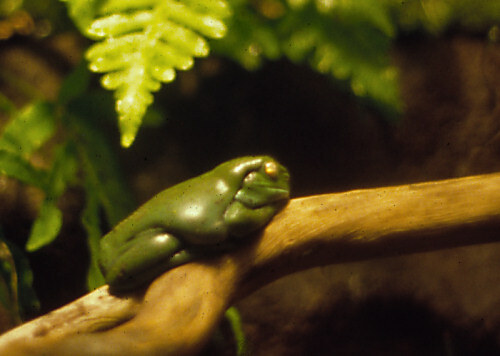 The sculpture “Froschk�nigin” (”The Frog Queen”) by Birgid Helmy in Wiesbadem-Biebrich. 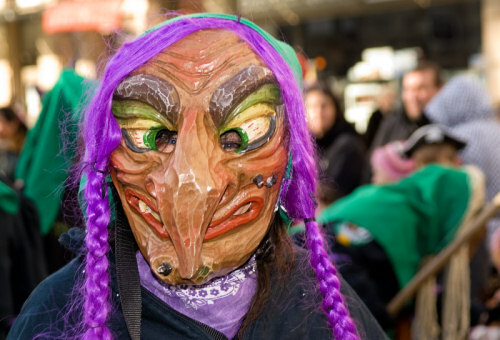 It is currently the time of the “5th season” - carnival. 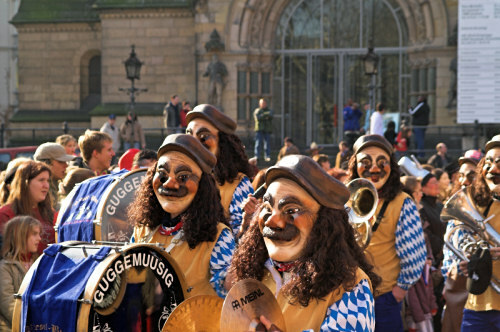 Just across the bridge from Biebrich is the city of Mainz, one of the most important centres of carnival celebrations. 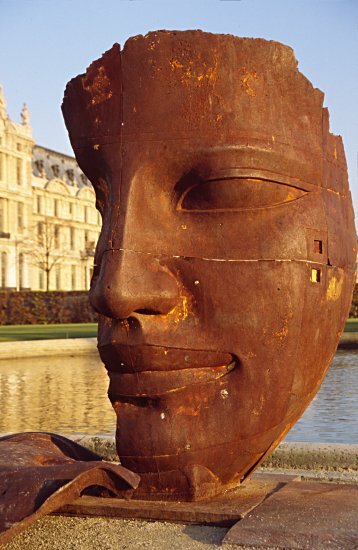 Birgid Helmy was born in Wiesbaden and is known for her dynamic sculptures. 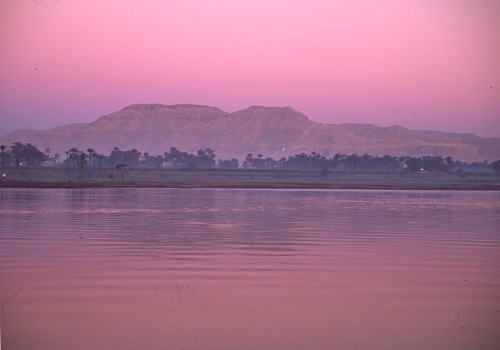 and another shot of dawn at Luxor. I had to get up pretty early to get this shot. The moon seen from our hotel room in Aswan. For the technicall inclined: Minolat Dynax 9, Fujichrome Velvia, Tripod, Tokina 80-400 mm lens + 1.7* Tele extender (=680 mm focal length). 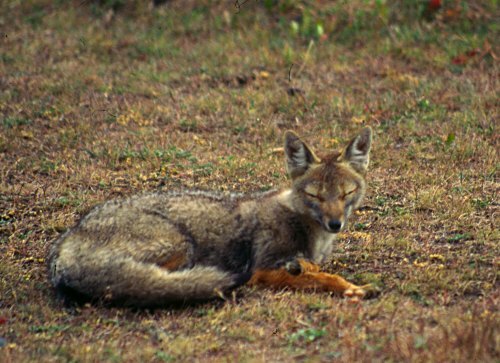 I saw this fox in Patagonia, Chile. you can take the convoy. This is the cheapest and most popular option, giving you, however, little more than an hour at the site! 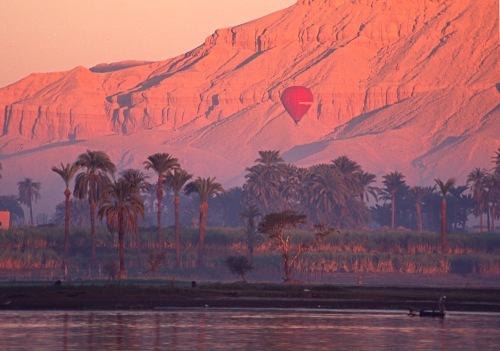 The luxury way is to take one of the ships cruising lake Nasser. We opted for the plane instead: this gave us time to visit the site at daybreak, before the big crowds. A side-effect of this approach was that we also saw the sound and light show at night. While we enjoyed the illuminated temple, the laser projections simply were too much! 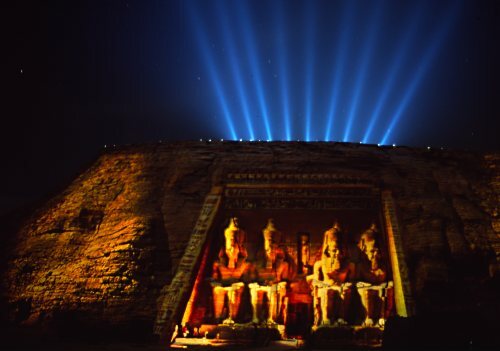 The picture above shows the Ramses temple with laser beams behind it. Now, as always, one can only approach this temple by boat. Looking at it, it is very difficult to believe that the whole complex was moved from one island to another one when the new Aswan dam was constructed. 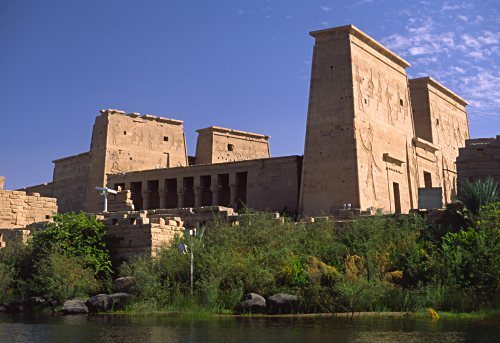 Even the shape of the new location, Agilika island, was changed to make it as similar to the original Philae island as humanly possible. 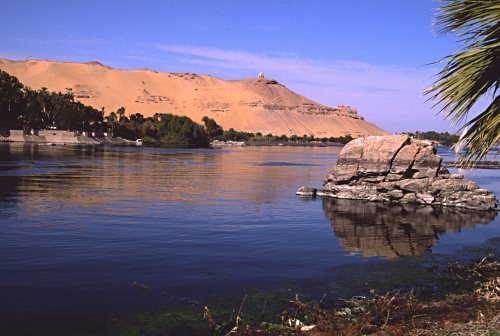 View from Elephantine island at Aswan. 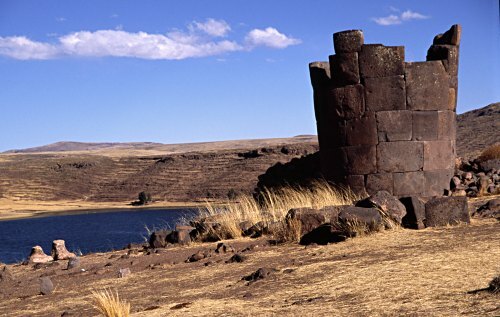 Sillustani is famous for its Chulpas - the ancient Indian burial towers. 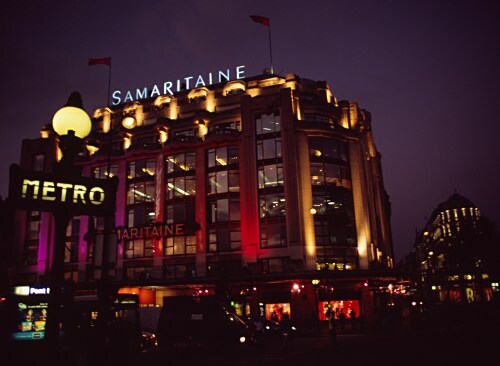 The Samaritaine is on e of the great department stores of Paris and has a prime location at Pont Neuf. Now, at Christmas, it is lit in festive colours and al the windows have special decorations. 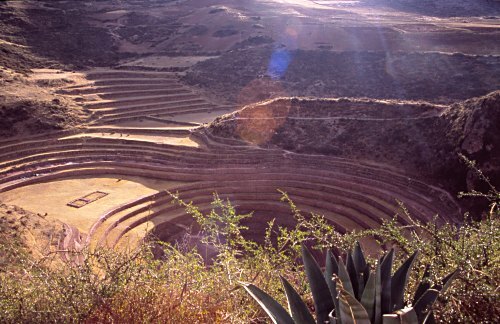 The cricular terraces of Moray are believed to have been an Incaagricultural laboratory. There are many theories regarding the purpose of these lines. Were they built for the gods to see? 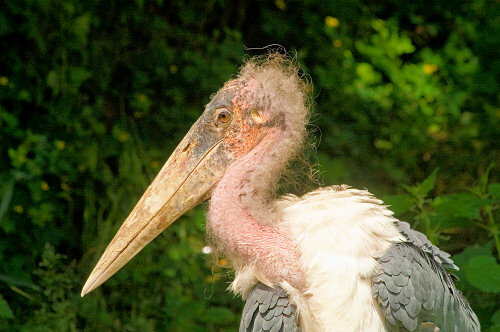 Or for shamans who “flew” over them in drug induced dreams? Or did their creators already have means to actually leave the ground, such as balloons? In any case, from the ground there hardly is anything to see: the area is mostly flat and the figures are of a size that makes it impossible to see them whole from this perspective. From an airplane, however, they are clearly distinguishable. 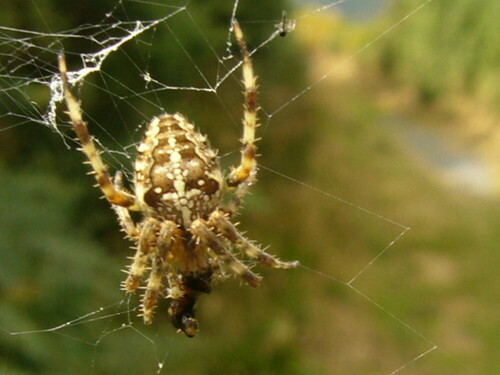 There are a monkey, a spider, a colibri, even a human figure (often called the “astronaut”). 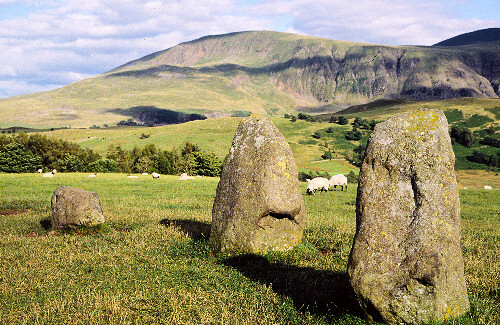 Of course, over time, erosion must have taken a toll on the lines which are believed to be more than 2000 years old. 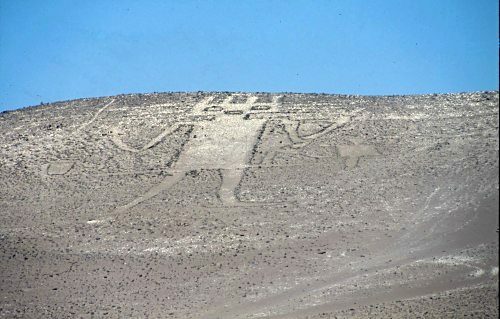 By the way, while the lines at Nazca are the most famous ones, there are others in South America, such as the Atacama Giant in Chile, which can be clearly seen from the ground. According to a CNN report, many new, even bigger and older geoglyphs have been found near Paracas - actually quite close to the Nazca lines. National Geographic on the Nazca lines: “Ancient, Giant Images Found Carved Into Peru Desert“. 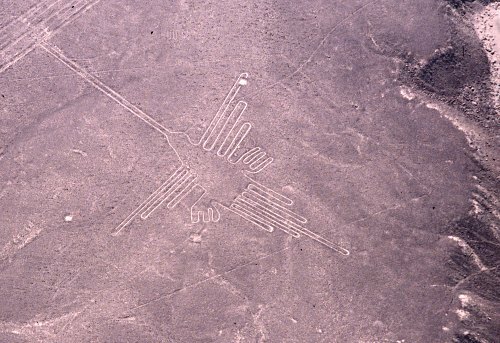 Here is an interesting account by someone who visited the Nazca lines several months before me. 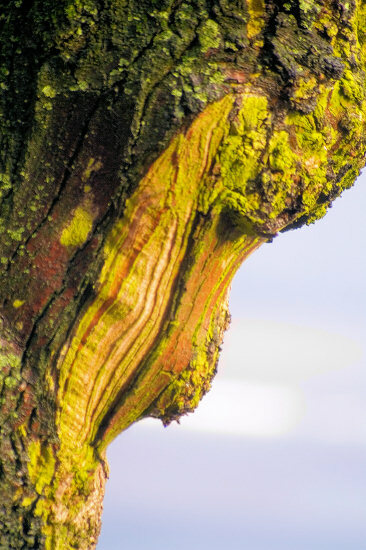 A Spanish blog notes that the lines have now been recorded digitally - a way to preserve them for the foreseeable future and maybe the analysis of the data will yield further insights?! 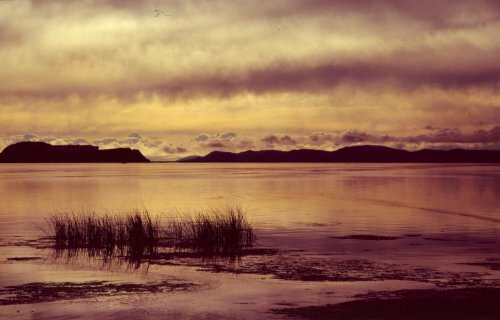 One of the “must sees” on Lago Titicaca are the artificial “islands of the Uros”, made of marsh reeds (totora). 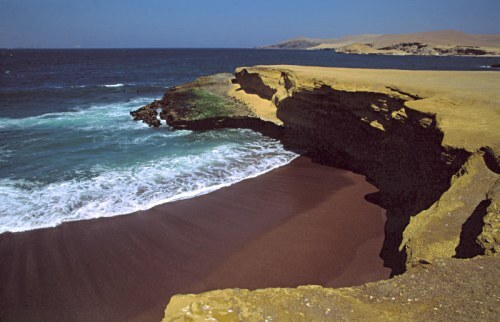 The tradition of constructing such islands dates back to times well before the Inca empire. 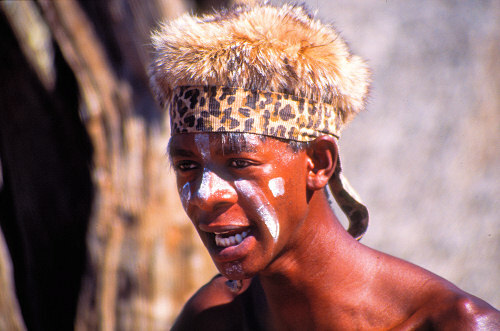 The original inhabitants were believed to have black blood and other magical qualities. When they started to mix with the neighbouring Aymara tribes, however, they were no longer regarded with awe. 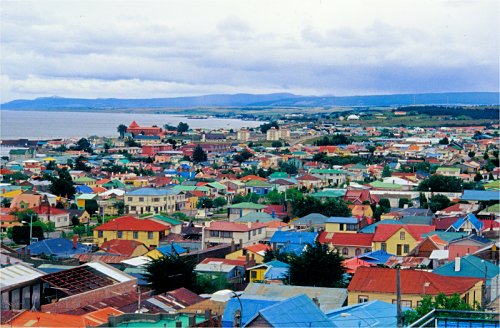 Today, the inhabitants of the floating islands no longer are Uros but people from other Indian cultures who speak Aymara or Quechua. 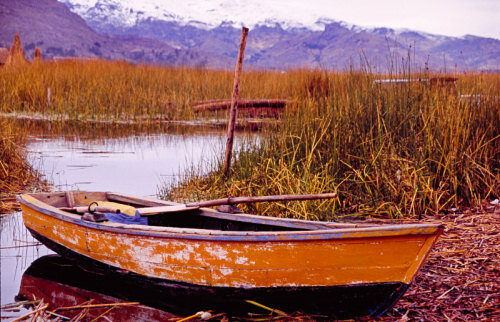 The totora reeds are also used to produce boats such as the one sown on this picture. 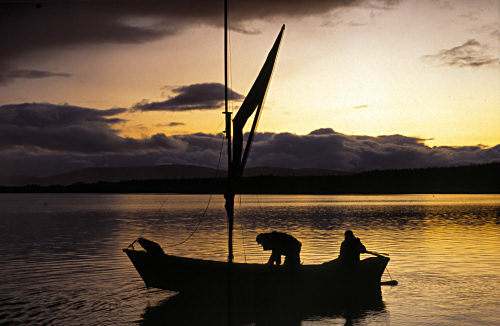 The famous Norwegian adventurer/anthropologist Thor Heyerdahl asked Uros from Lago Titicaca to help him with the construction of his reed boat Ra II with which he eventually crossed the Atlantic Ocean. Although many boats are obviously mainly constructed for the entertainment of the tourist crowds, you can still see many families use them as the traditional means of transport. 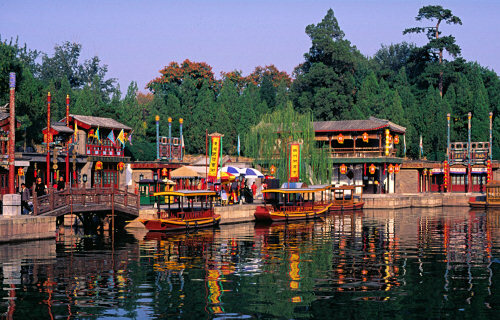 By the way: I also saw floating islands in Xochimilco, Mexico. 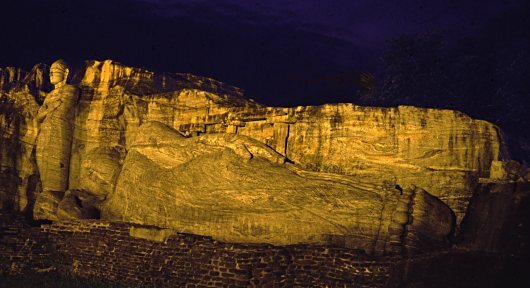 The reclining Buddha of Polonnaruwa (Sri Lanka) at night. 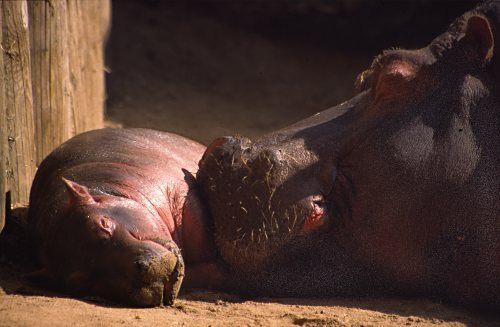 Baby hippo in the Frankfurt (Germany) Zoo. 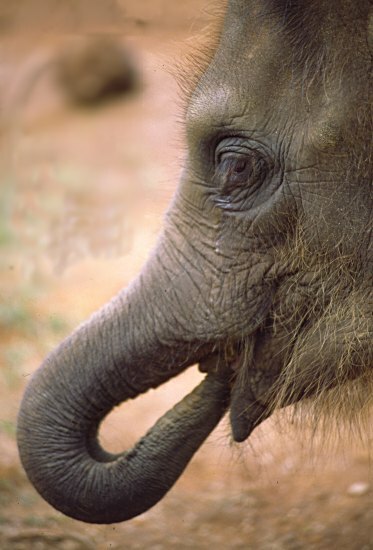 12 years ago, in 1992, I visited the Pinnawela elephant orphanage in Sri Lanka. 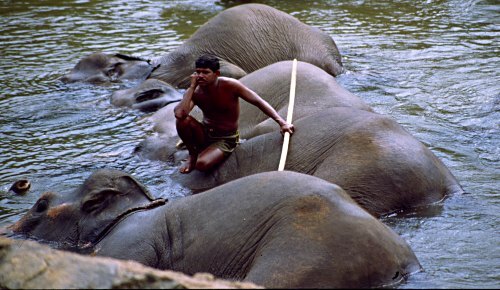 Now, rescanning some images from Sri Lanka brought back some very fond memories! 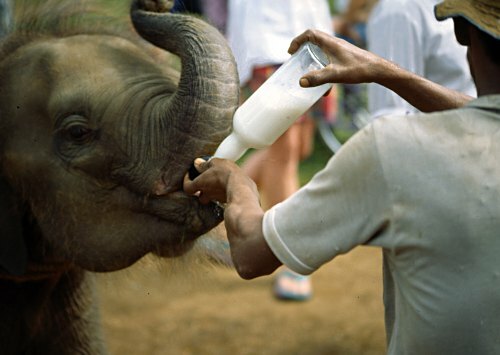 Pinnawela elephant orphanage is a truly unique institution that raises motherless young elephants. Of course, there now also are many growm-up elepjants at Pinnawela and it is a special experience to see all the big and small elephants take a bath in the nearby river.. The “stars” of the orphanage are the baby elephants however, who already wait for their bottle(s) of milk and the special treat, a sweet rice ball. I was glad to read that Pinnawela Elephant Orphanage will not only be maintained but even upgraded. Also, I was quite surprised to read how the dung produced bythe elephants helps to finance the Pinnawela orphanage - in the form of business cards! 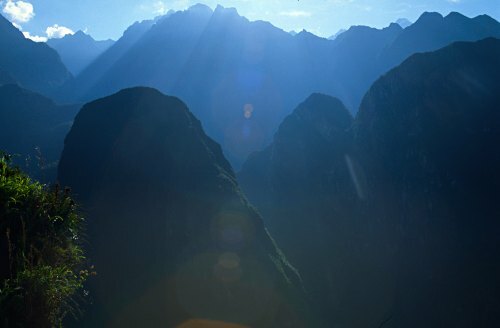 It is advisable to take the first bus up to Machu Picchu and be there before sunrise. At this time there is already surprisingly much light and the place is truly magical. 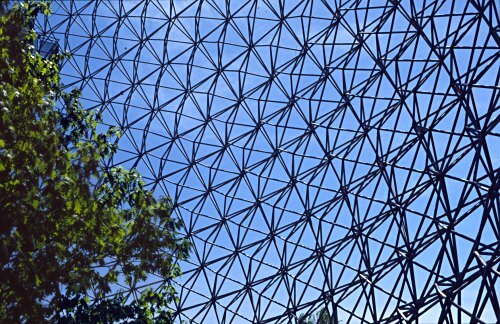 The attraction of the Expo 1967 by the famous architect Buckminster Fuller has lost its skin, but is still one of the most important landmarks of Montreal. Today it houses a water exhibition. 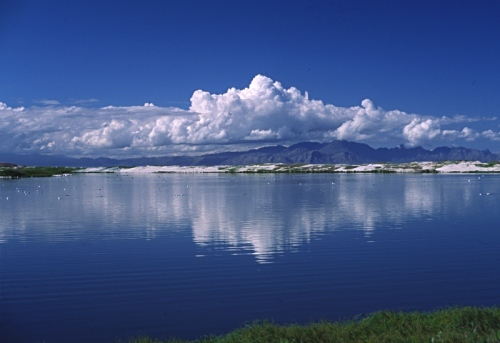 The Titicaca lake seen in the early morning from a boat. 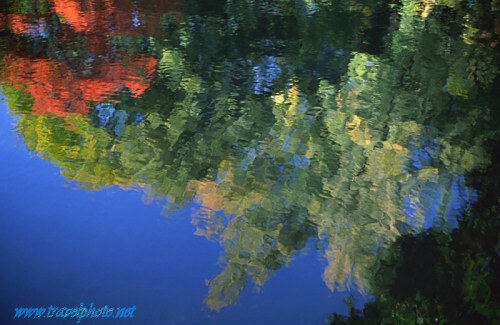 The pond in Hida Folk Village, Takayama, Japan. 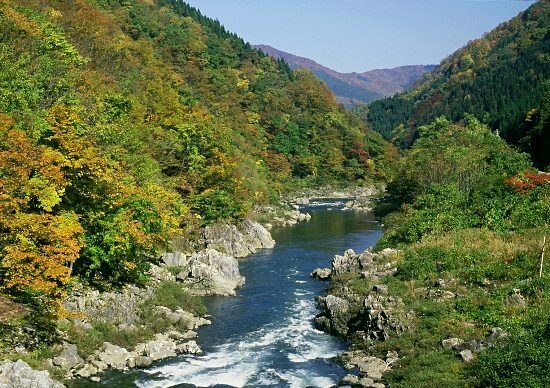 Already, you can see the first autumn colours. Hida folk Village is worth a visit anyway as youi can learn a lot about traditional Japanese architecture and see demonstrations of traditional crafts. Visiting a theatre performance can be quite an experience - especially if this takes place in another culture. 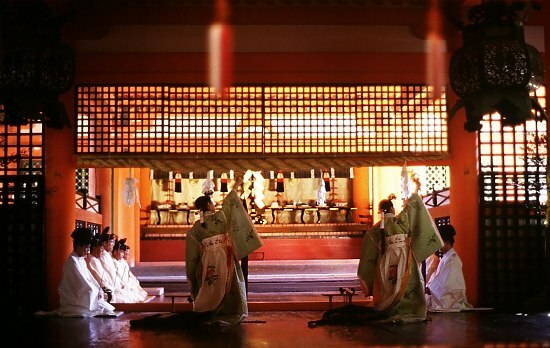 I’ll never forget this performance in Kyoto - the colourful costumes, the light, the traditional music. 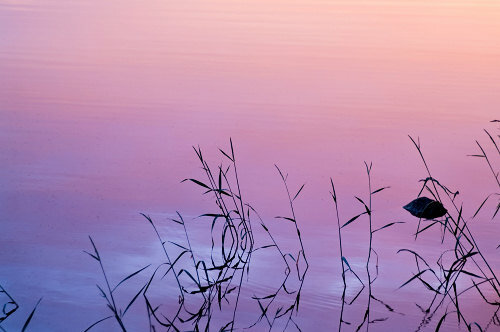 The short piece here is about a Koi (goldfish) and a crane. 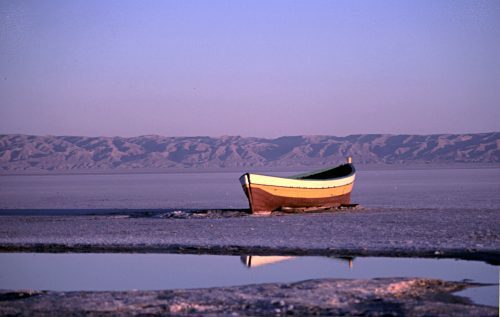 A small rowing boat on the salt lake near Douz (Tunisia). 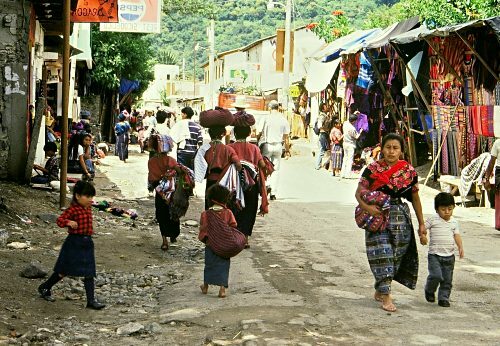 Maya culture still is very much alive around Lago Atitlan (Guatemala). It is a long night trip with the train between Bangkok and Koh Samui, but quite comfortable. 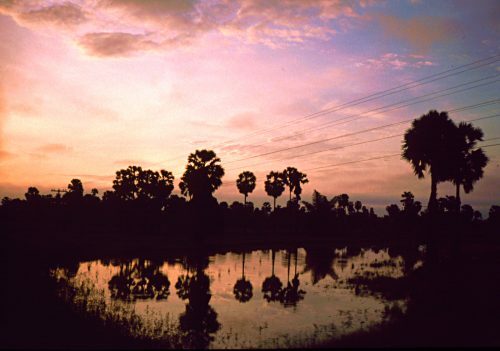 When I woke in the early morning, a while before reaching Suratthani, I was amazed to see this view of a sunrise over rice paddies. 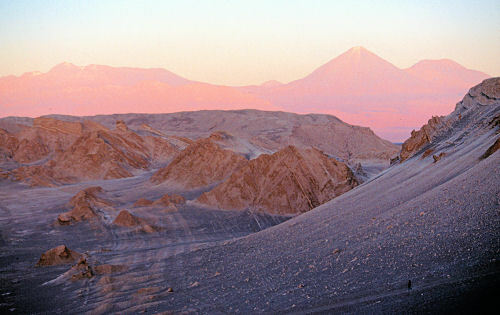 In the Peruvian and Chilean desert, there are numerous, gigantic drawings made by carefully moving aside the dark pebbles thereby exposing the brighter soil underneath. 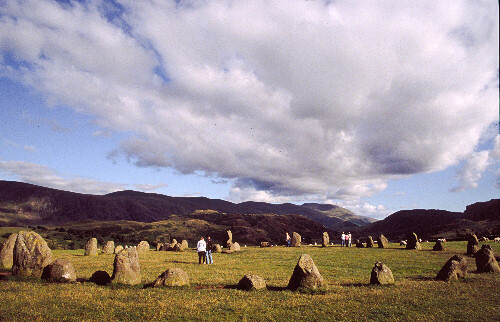 The most famous examples of this technique are the so-called “geoglyphs” in Nazca Peru. As the area is mostly flat, these can only be appreciated from a plane! Did their builders already have the technology to take to air either with a balloon as some believe or even using alien technology as others imply? Or were the images only supposed to be seen by the gods or shamans who could “leave their body” in a state of trance to “fly” over them? (Personally, I wonder why the drawings are often very crude - if they were produced by aliens capable of interstella travel, it must have been their pre-school children who drew them!). A slightly less famous (and less enigmatic) specimen is the so-called “Atacama Giant” in the Chilean Atacama desert: this figure is 115 m tall, but can be viewed quite well without leaving the ground as it takes up the slope of a hill. If the photos fom my Peru travel turn out well, I may be able to post pictures of the Nazca lines as well, - which actually are quite different in style. 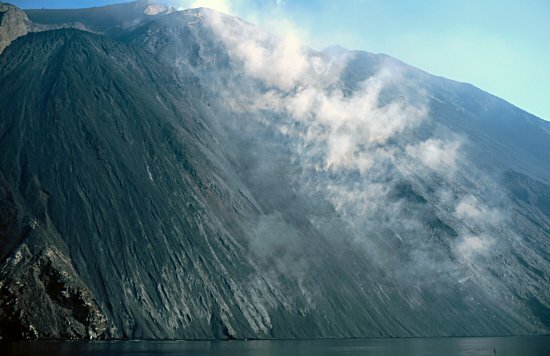 This volcano is still active. 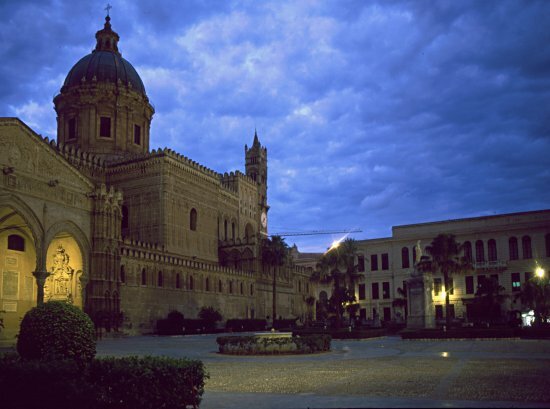 Another view of the famous mosque of Cordoba. You find pictures from Sri Lanka at the main photo gallery. The Beach of Koh Samui, Thailand. 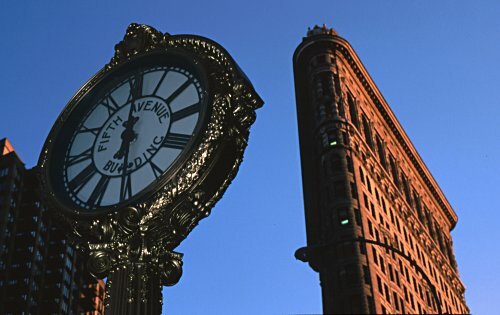 One of the most unusual sky-scrapers, the Flat Iron Building in New York. Quite close to San Jos�, volcano Po�s is still active - and an impressive place. View from the castle of Rethymnon (Crete, Greece). Canada: the Art Galleries of Montreal. Syracuse is a very beautiful city in broad daylight, but turns magical at night. This is the harbour of Syracuse in the “blue hour”. 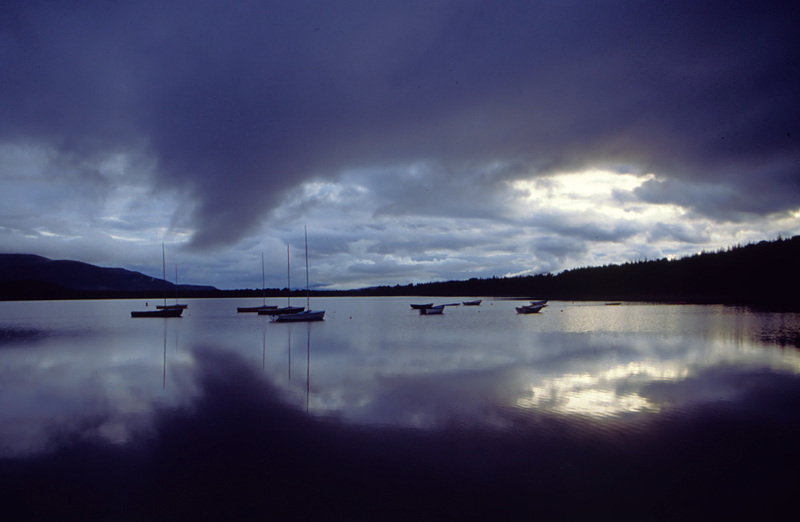 Taken with a Minolta Dynax 9 on a tripod on Fuji Velvia slide film. … but I wouldn’t risk this for any sweet! You find pictures from Nepal at my main photo galleries. 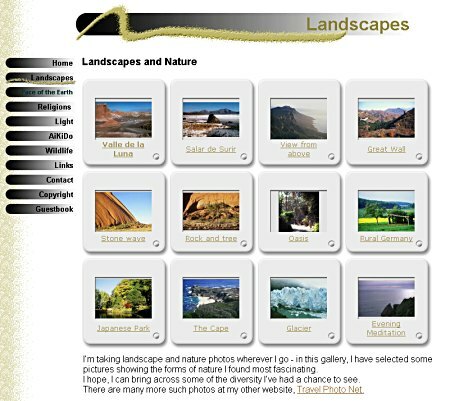 Please note that I also have a site with a few thematic photo galleries. 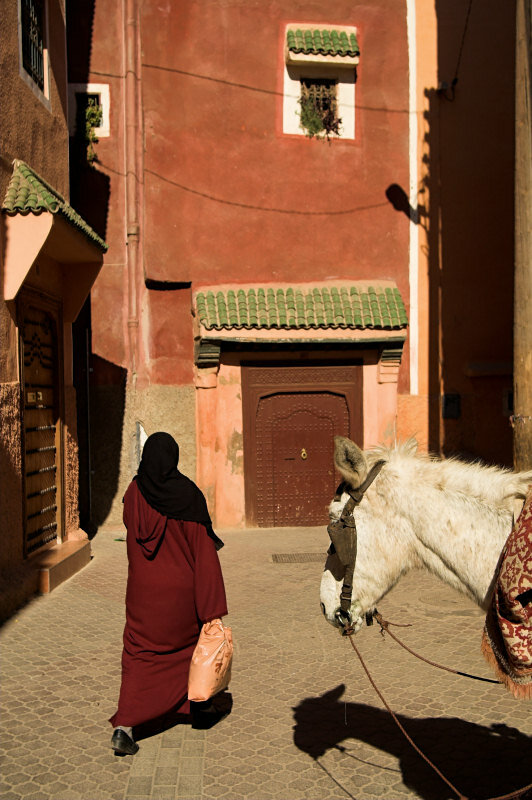 Very quiet: dromedaries are waiting for tourists. Quite decorative, but slightly less colourful lighting would have been more to my taste: the city hall of Montreal at night. One of the nicest ways of crossing from Argentina into Chile is the “Paso Hua Hum” a combined bus and boat trip. 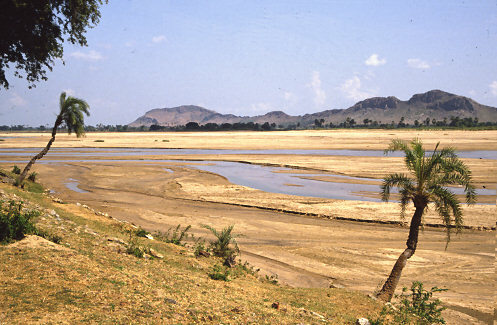 You then come through the area of the “seven lakes”. This picture was taken in Panguipulli, a small but pleasant town. my slides, I exactly remember a place but not its name. Where did I come across this small temple? 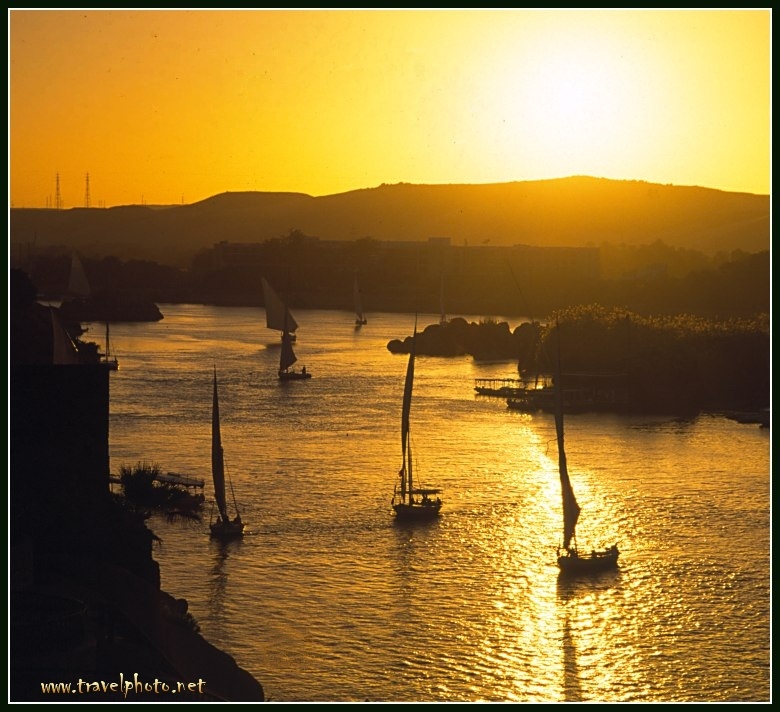 it must have been near Aswan (Egypt) and the head of Hathor is clearly visible on the left. 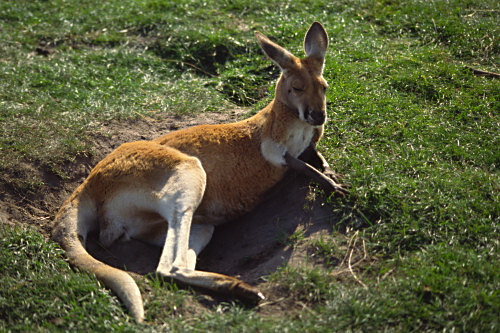 Maybe it was on Bigga island. So, if anyone here knows the answer, please tell me! Koh Samui in the morning. 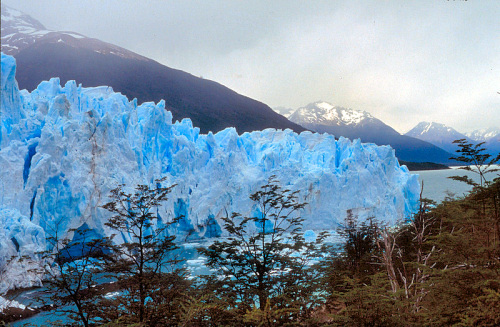 Parque Nacional “Los Glaciares”: Moreno - Glacier. 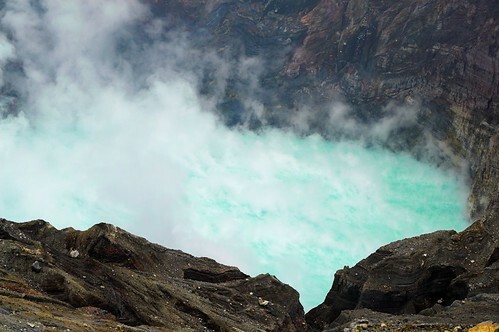 A fascinating short trek leads to the Torres del Paine, but unfortunately, the weather is unpredictable. When we arrived there, the famous peaks were barely visible in the fog. Still it surely was worth the effort: the Torres del Paine National Park has so much to offer, including crystal clear lakes and many wild animals. 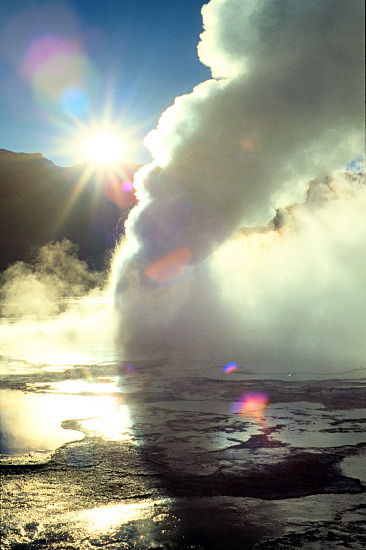 High up in the Chilean Andes, at about 4000 meters, there is a famous geyser: El Tatio. In the early morning, this is a truly magical place with ice, steam and many colours. 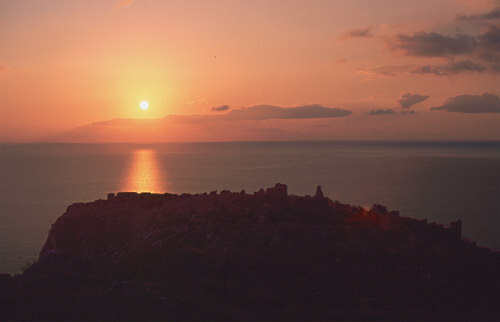 However, this spectacle only lasts for a short time, a few hours after sunrise there isn’t really much to see. This is why many travelers leave San Pedro de Atacama at night and reach the place before sunrise. It’s worth it. Take some hot beverages and warm clothes - it can be bitterly cold with temperatures well below 0. If New York has any such thing as a “city center”, then it would be the area around Grand Central Station. Maybe the most attractive skyscraper in New York. It’s only a matter of perspective: from aboard the ferry, even the New York skyline seems to be quite small. 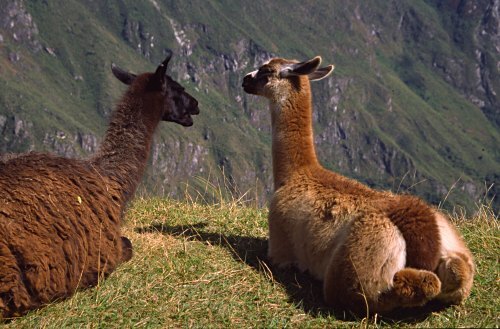 Llamas in the Altiplano, Chile. The head of the most controversial pharaoh in Egyptian history. Even though the museum of Luxor is much smaller than the one in Cairo, I’d prefer it any time. The arrangement of the pieces and the almost perfect lighting create an almost mystical atmosphere. 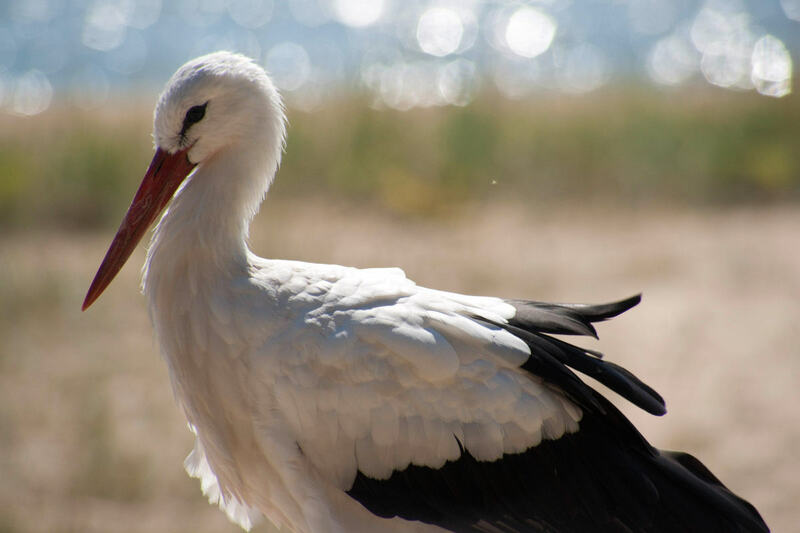 Seen in Agia Tri�da, Akrotiri, Crete. Church in the Chilean table lands. When we visited Greece, many places were building sites, including the Acropolis. Honduras: Ruins in the Jungle. 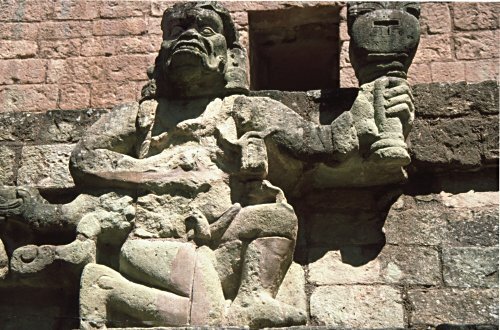 The Maya temples of Cop�n are surrounded by jungle. Untouched by the splendour of the ornaments, a stone Buddha sits in Bangkok, Thailand. Egypt: an evening in Aswan. I rented a Braun slide scanner that is able to scan up to 100 slides in one go. This could be the perfect solution for me - I have thousands of unscanned slides. Unfortunately, although this is a very good idea, the scanner itself still leaves a lot to be desired. Colours are fairly neutral, but very often, it will not correctly detect the format of a picture and try to scan a “portrait” as a “landscape” or vice versa.. It’s also quite fond of simply cutting of parts of dark pictures. A nightmare for night photographers. Having said that, I was able to scan quite a few pictures, so the future of these pages is not in doubt. 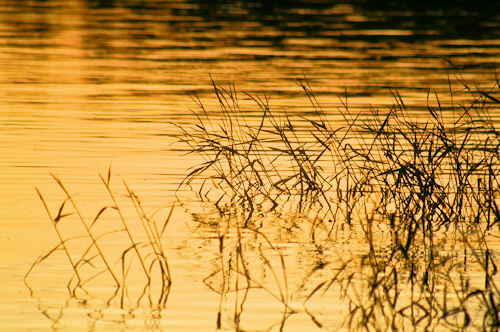 The wet sand banks glisten like gold in the setting sun. Greenwich Village - or just “the village” - really comes to life at night. 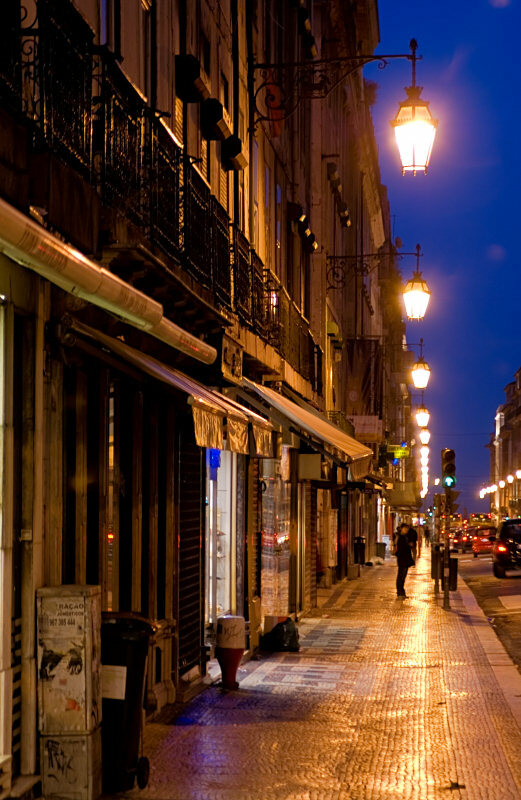 Pubs, bars, night-life and trendy shops seem to never close. 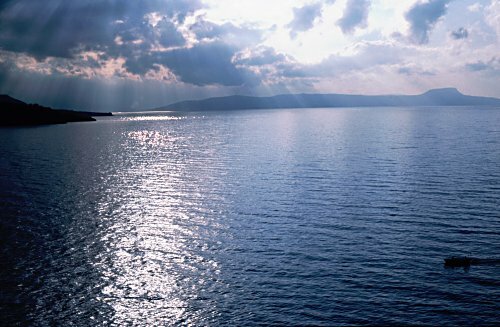 Ashino-ko lake is a crater lake and only a few thousand years old. On it’s shores, there’s a small red Torii which is illuminated at night. 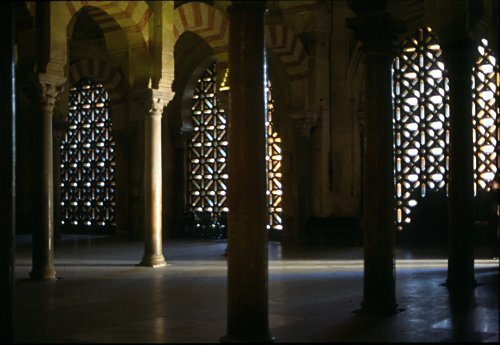 The Mezquita (mosque) of Cordoba is an architectural wonder, even today, although building a Cathedral in its center did not exactly improve it. Well, nice quote, but after all it was Carlos himself who had ordered the construction of the cathedral. 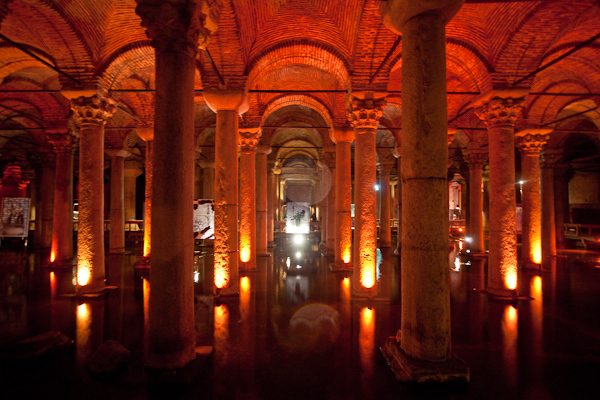 Still, the maze of columns is breathtakingly beautiful. 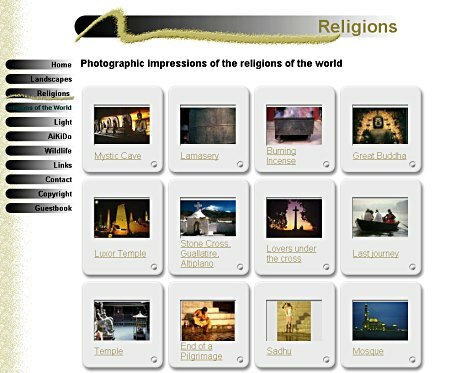 There also is a special gallery on “religions of the World” at my Online Photo Galleries. Somewhat anachronistic - and one of the most romatic spots in San Francisco. Granada, seen from the Alhambra. San Giovanni degli Eremiti (12th century) is romantically situated in a very photogenic setting: a small garden that allows for many interesting angles. Consequently, the entrance fee is a bit steep. 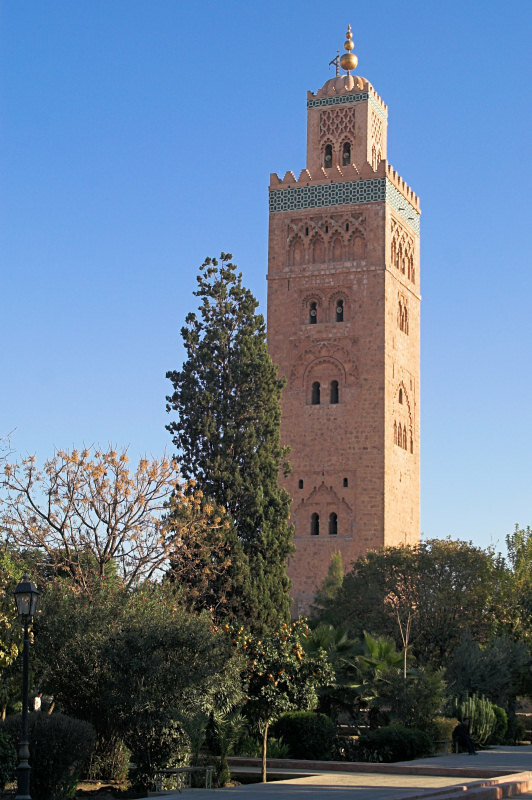 Those interested in the history of architecture will be baffled by the ingenious mixture of normannic and arabic styles. Here, I had some difficulties. No technical issues, but as soon as I had mounted the camera on my tripod, a guardian appeared, telling me in Italian that professional photographers were not allowed to take photos without a special permit (needless to say that you would have had to go back to town and surely, the office wouldn’t be open at that time). Pointing out that I’m not a pro didn’t help either. After all, I was using a tripod! 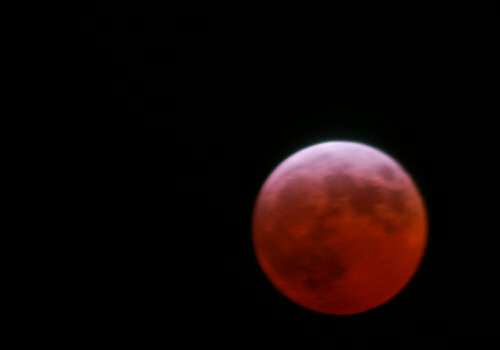 Fortunately, I had taken a number of hand-held shots before as well as some pictures on the tripod. Still, if you are the proud owner of a professional looking camera and/or a big tripod, I’d recommend that when visiting historic sites at night you either enquire beforehand whether you would need a tripod, - or take as many hand-held pictures as you can and only then hurry up to use your tripod. 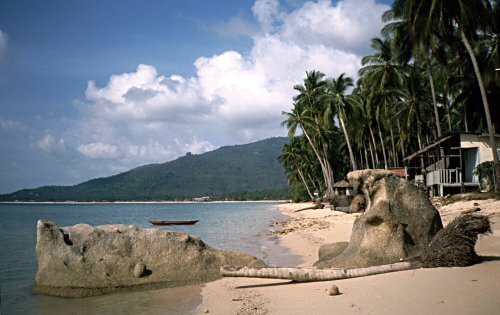 Small, cheap, not too comfortable but charming: bungalows on Tioman Island (Malaysia). And here is the view you have from the upper town. Monemvas�a has been dubbed the “Gibraltar of Greece” - and there are definite similarities. 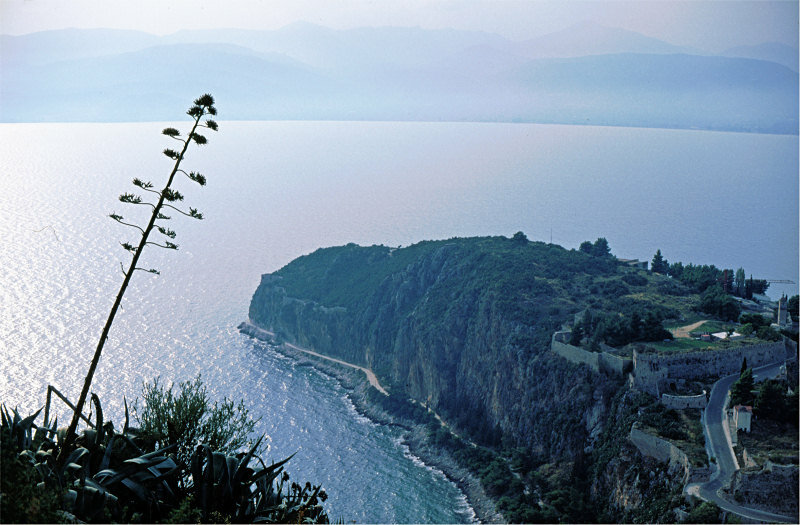 Only a small dyke links the Island-rock to the Peloponnese, in earlier times this strategic position was further fortified by a drawing bridge and a castle on top of the rock. Looking at the town from this side it seems to be almost uninhabited, - only after passing through the city gate one sees the remains of a city that once had 30000 inhabitants. 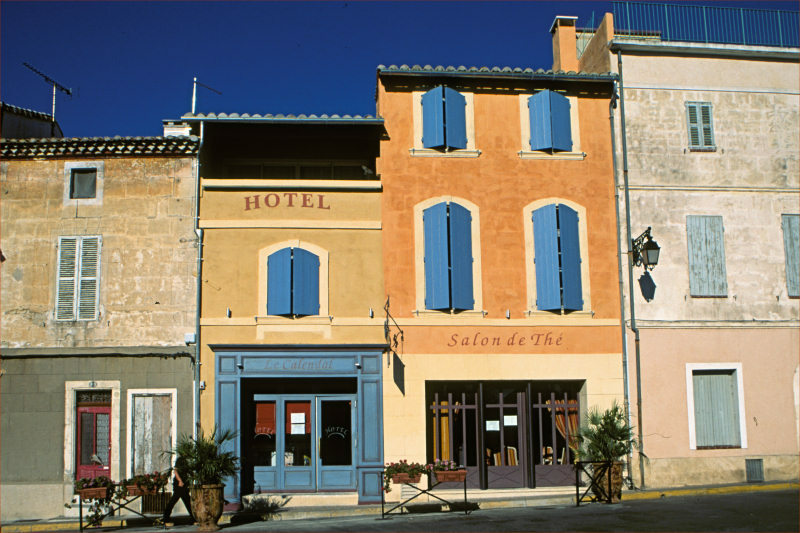 Today, the lower city has been carefully restaurated and it is possible to stay there in an apartment that is several centuries old. Definitely recommended. Although today only 400 people live here, there’s a regular bus to the other side. Please beware that on public holidays and sundays you may not be able to catch the earliest long distance bus from there, as the bus may not be running yet and taxis may not be willing to take you either. 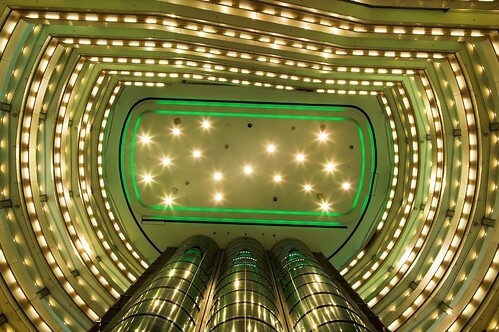 A good excuse to prolong your stay. A must: going up the rock to the ruins of the upper city. 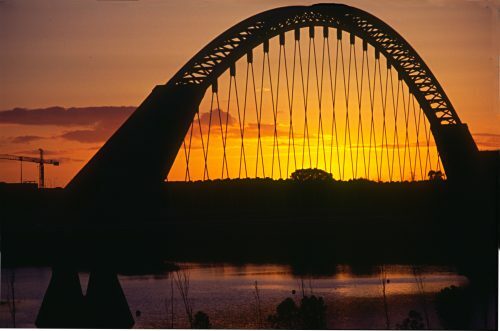 This is especially beautiful at sunrise. You’ll be back in time for breakfast and the colours are amazing. The Golden Gate Bridge in San Francisco. Walking across it takes quite a while but is an unforgettable experience. 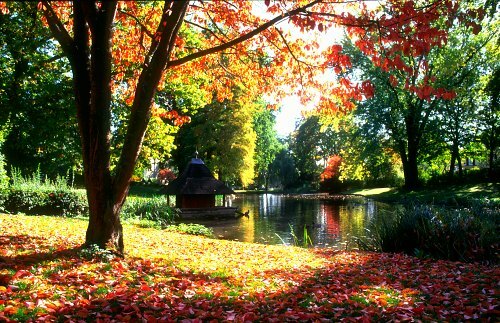 Currently, the weather is not at its best here, so how about a nice shot from this fall? 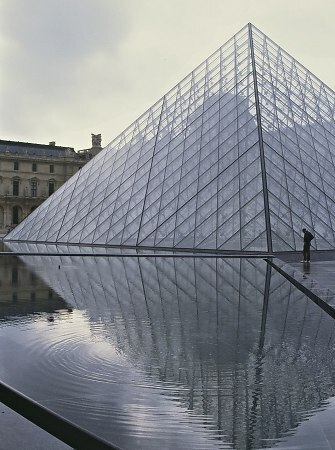 The pyramid at the Louvre, Paris, France. 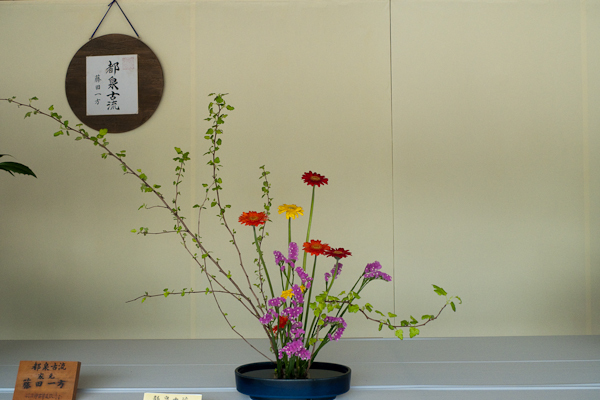 What is the real purpose of the Tea Ceremony? Philosophy? Zen? The perfect cup of tea? Well, I would guess that, today, the answer is simple: money. The event no longer takes place in a small garden house but in theatre-style halls. Even so, one shouldn’t miss the opportunity to attend such a ceremony. It’s beautiful. And you even can take photographs, which would not exactly be compatible with the traditions of Cha-Do - the way of tea. Even on rainy days, the streets of Chongqing (China) are full of people. A beautiful sunset in Kamakura. More on taking pictures of silhouettes. I’m going to post some pictures from Japan in this Weblog, in addition to this, here’s my Japan photo gallery . Actually, it is quite easy to take pictures of dramatic silhouettes: you shoot into the sun, metering on a lighter part of the sky. Consequently, the foreground will be dark or even black. 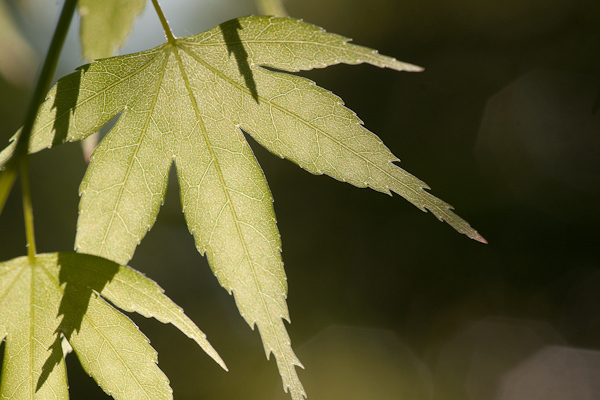 Getting the exposure right is pretty simple with spot metering (if your camera has this option). Still bracketing (taking pictures with different exposures) is highly recommended, - at least when you are using slide film. Sometimes, you want to have a nice silhouette in the centre or background, but would like to show the details in the foreground. In this case, it is advisable to use the above technique combined with a fill flash. Here is an example, the Ggantija Temple on Gozo (Malta). The place is 6000 years old! Other pictures I took showed much more detail but failed to capture the magic atmosphere. Other examples: Sunset in Glasgow or sunrise in the Himalayas. Well, actually I wanted to shoot the sunset, but then thought better of it when I looked at the magical glow of the sun on the mountain peaks. This is a new scan of one of many shots on the occasion. Here are some pictures from Grand Bahama. The woods on Grand Bahama are very different from European forests or South American jungles, - but also very attractive. 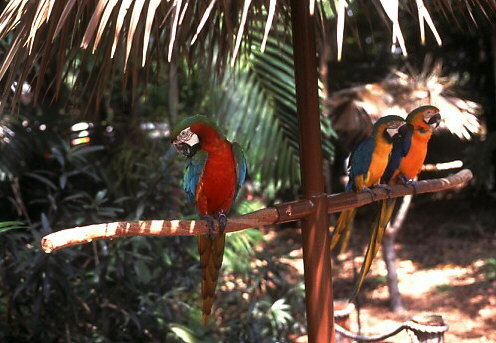 Parrots in the “Garden of the Groves”, Grand Bahama. 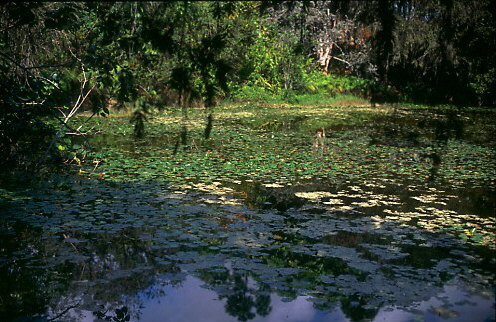 Rand Memorial Nature Center, Grand Bahama. 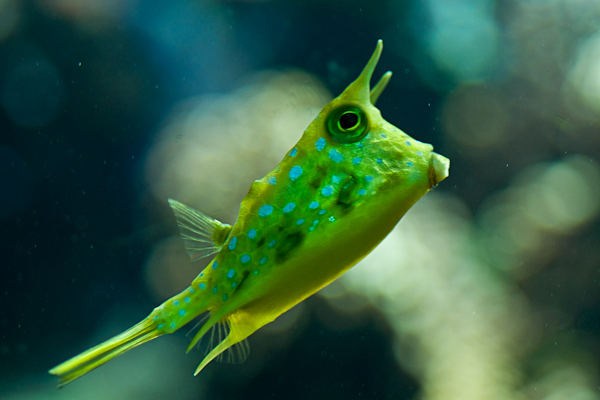 The “house riff is only a few meters away, so don’t forget to bring your snorkeling gear. 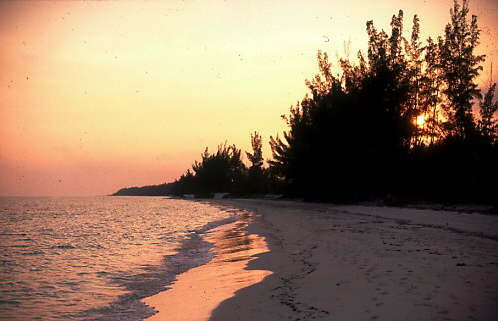 Bahamas: Beach in the Evening. Walking the beach shortly before night falls is a memorable experience. Only a few minutes later you can see many small crabs in the beam of your flashlight. 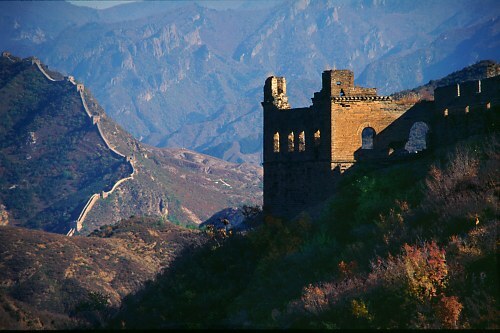 There are many pictures of Beijing, the Great wall, Xi’An and the famous three gorges. A stopover in Bahrain was a good opportunity to visit the city. 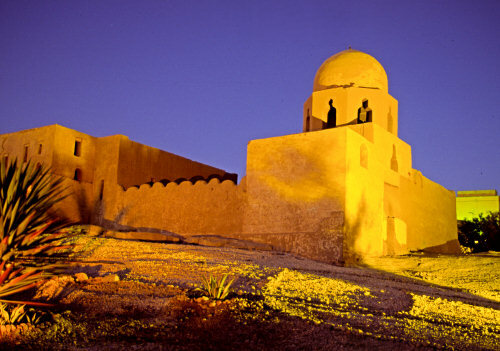 This is a mosque in the blue hour. Republication only with my written permission, and only with proper credit (including a link back to this site if shown on the web).